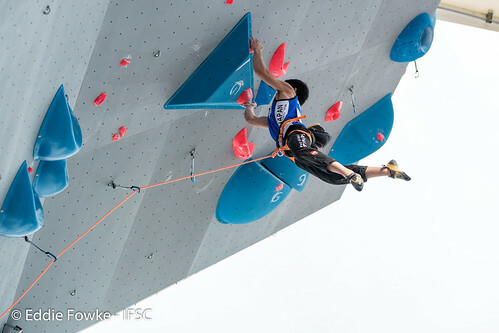 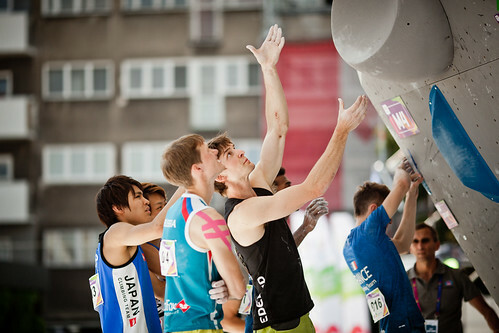 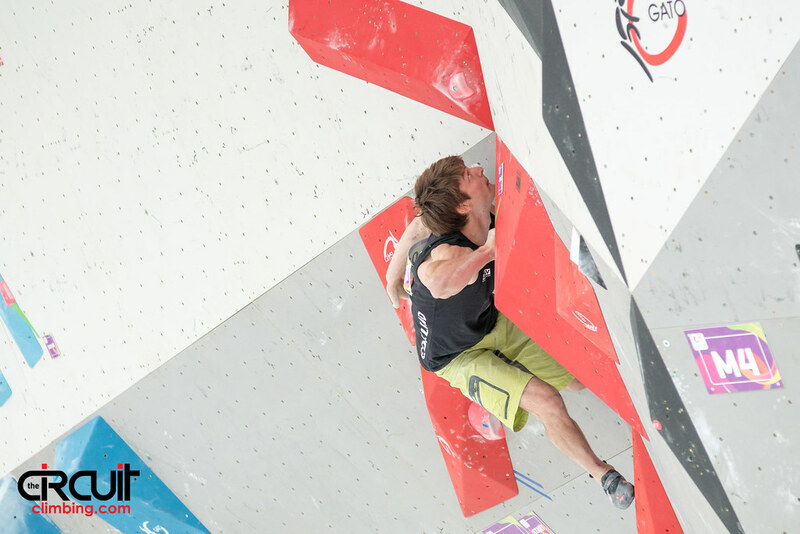 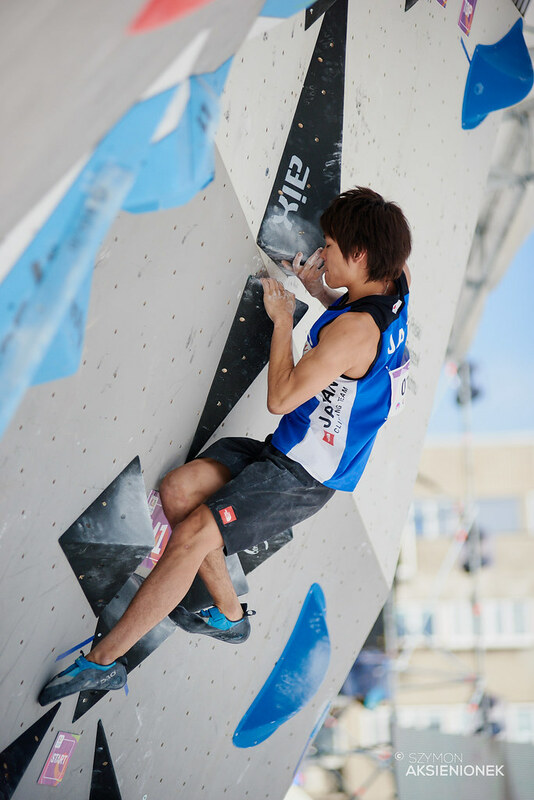 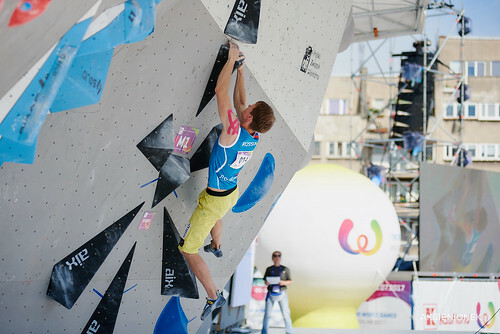 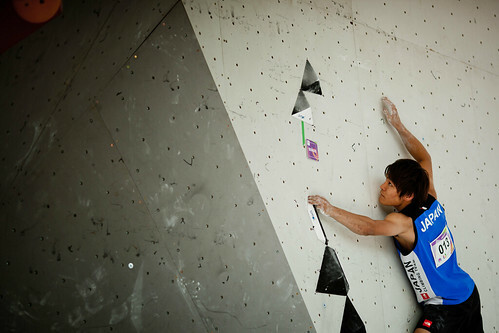 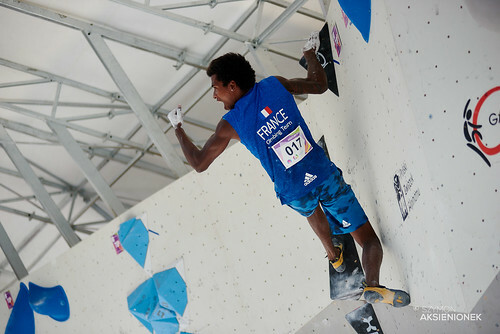 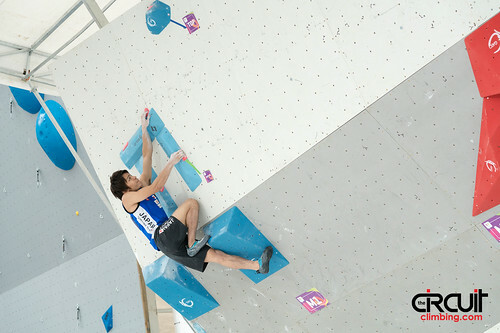 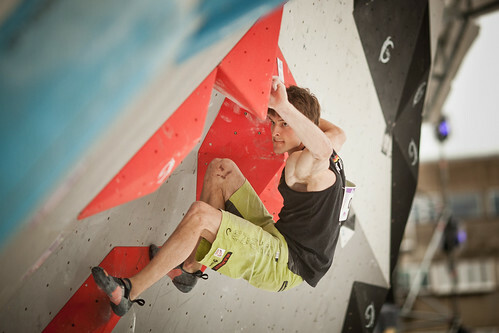 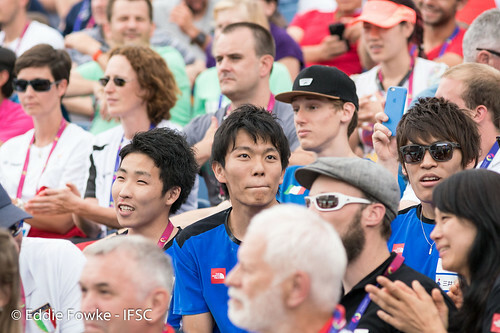 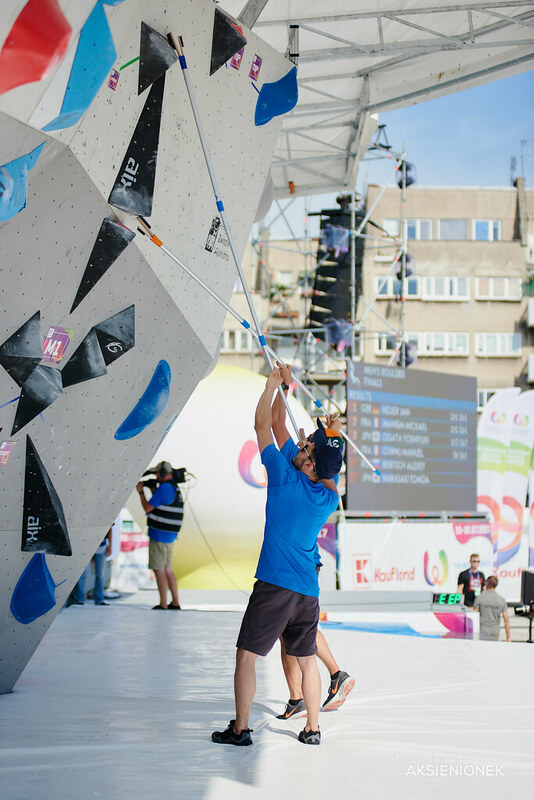 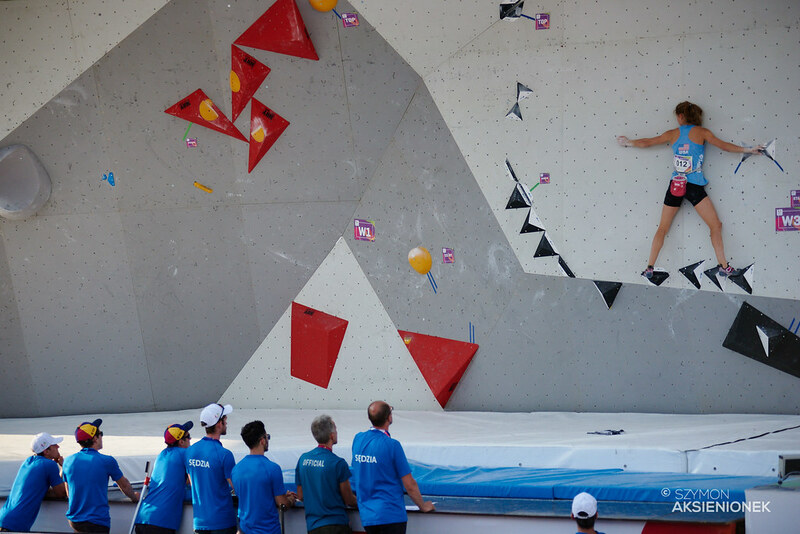 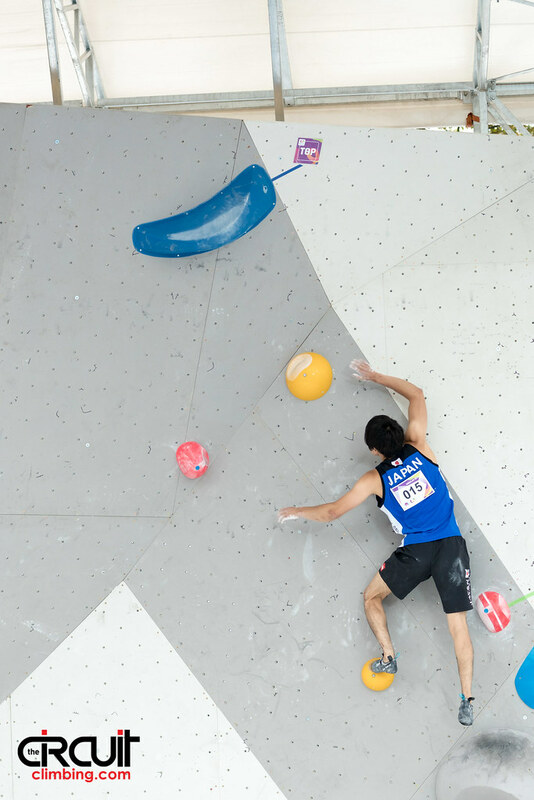 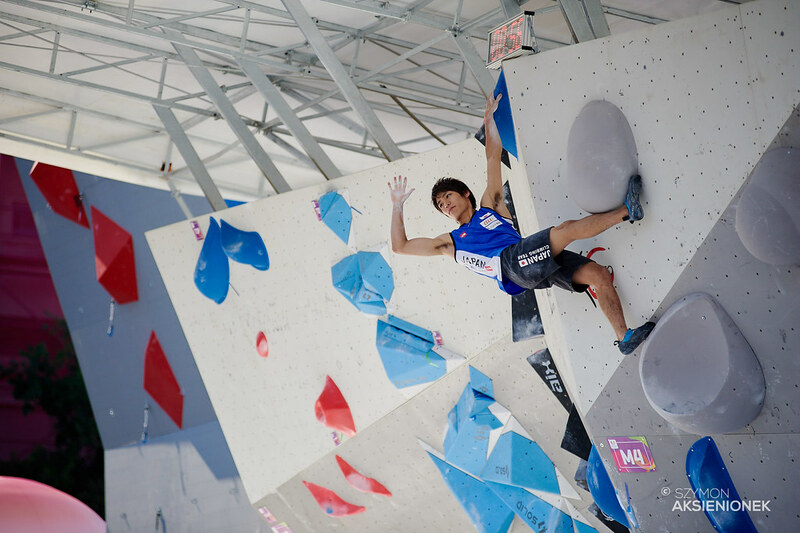 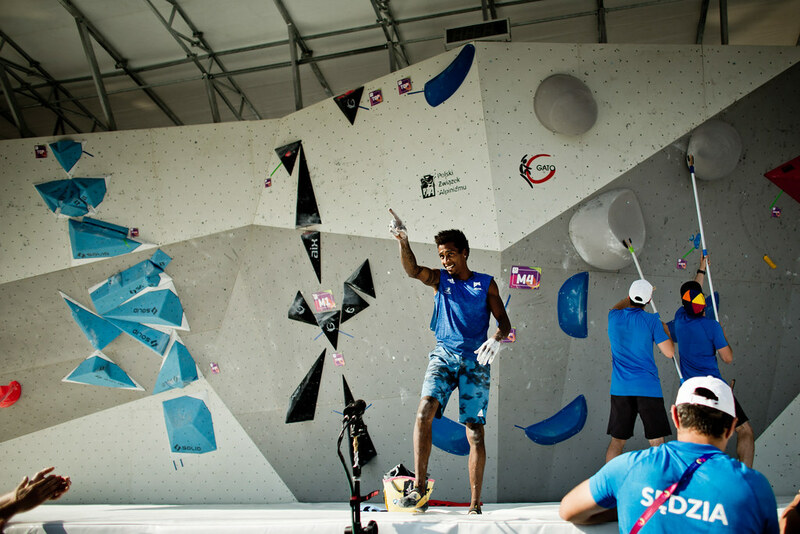 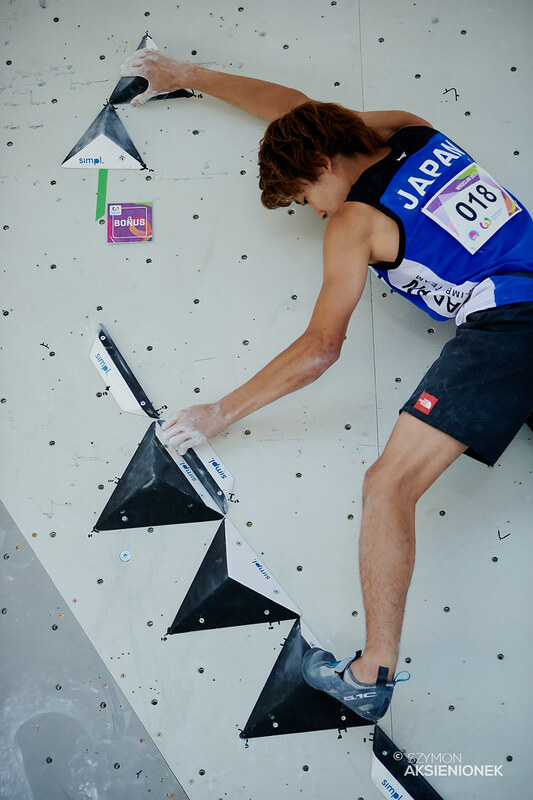 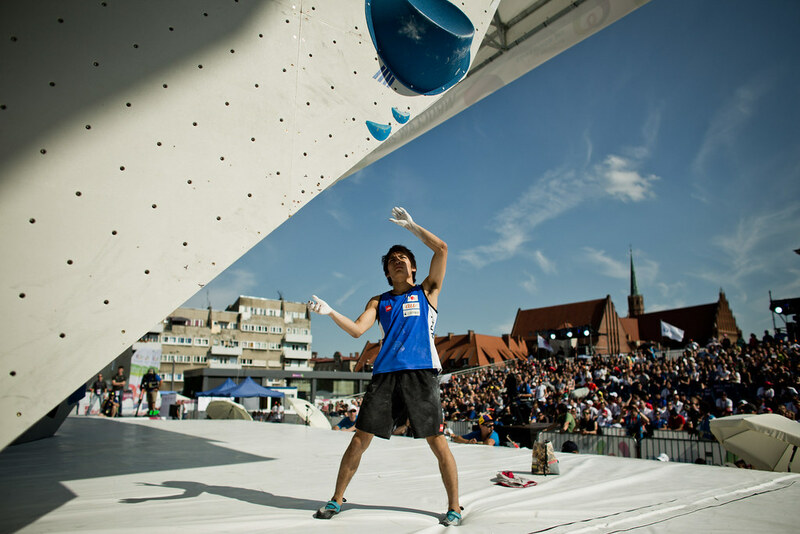 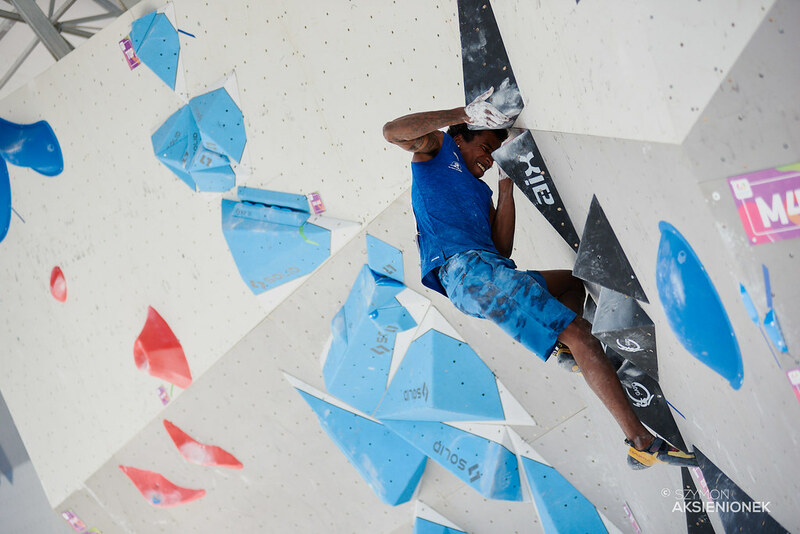 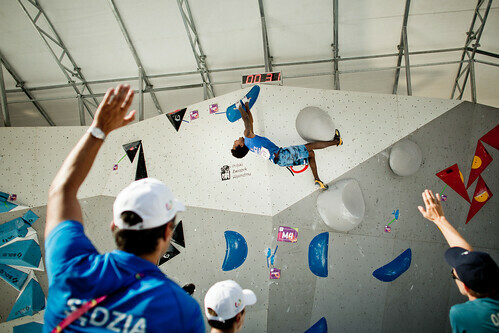 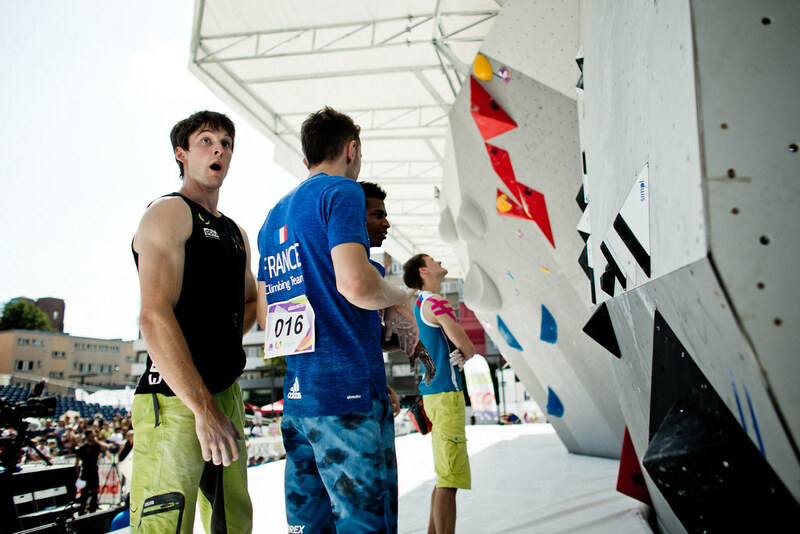 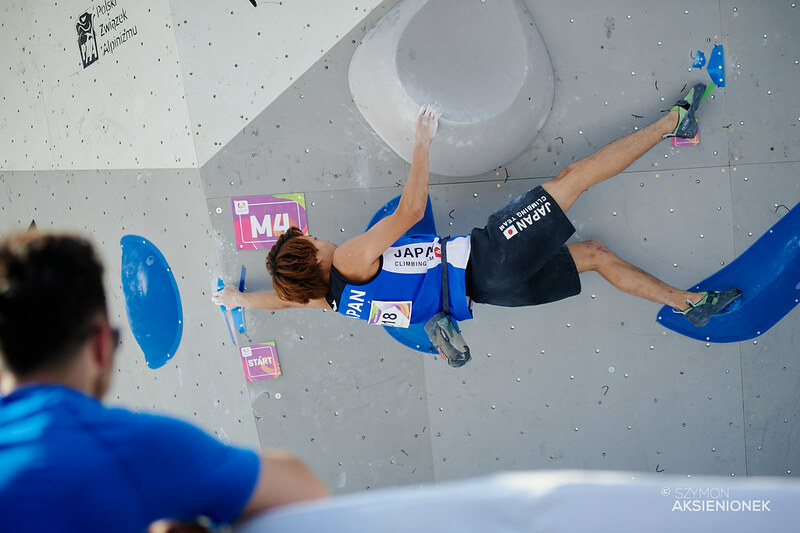 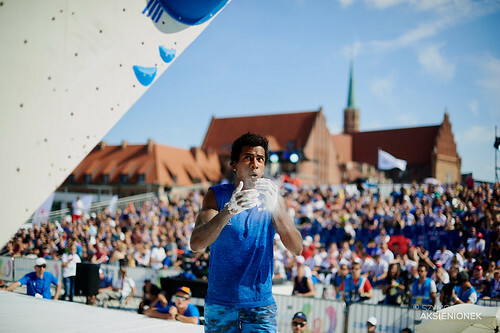 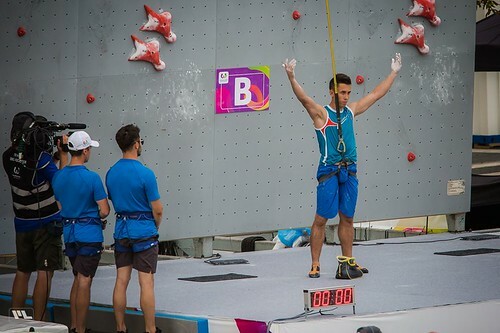 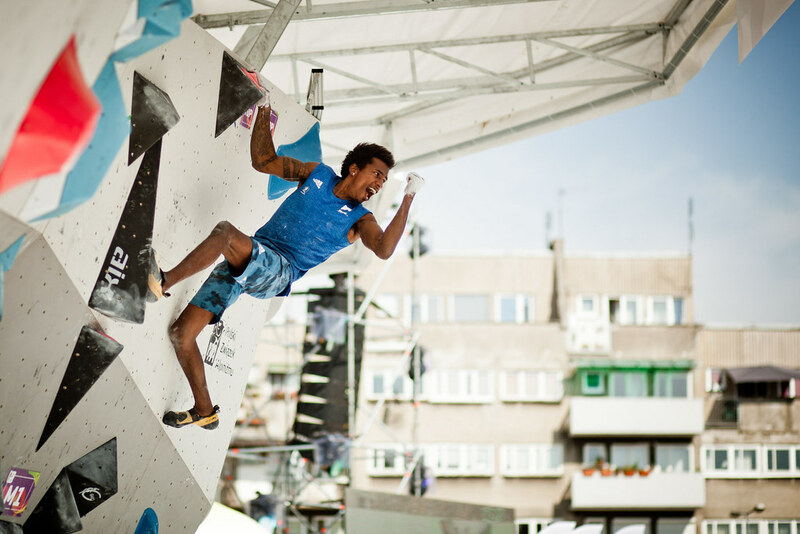 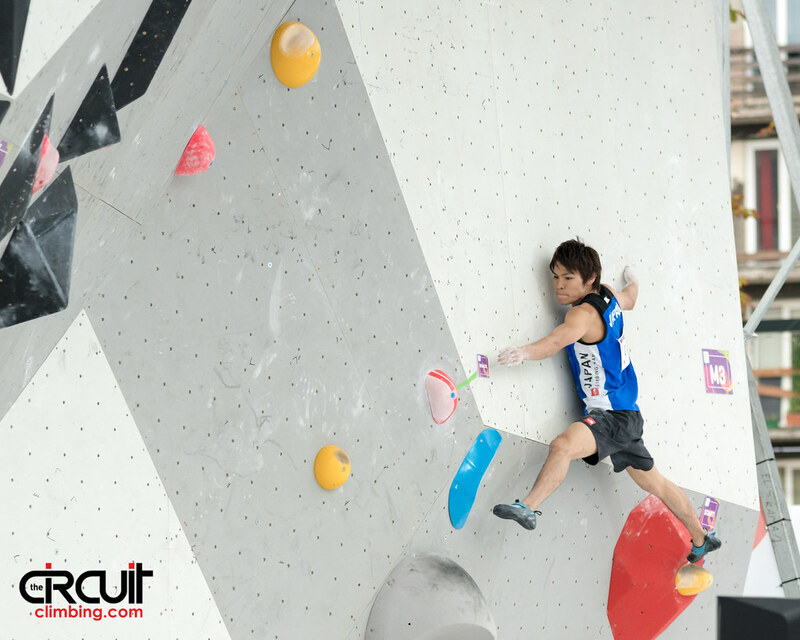 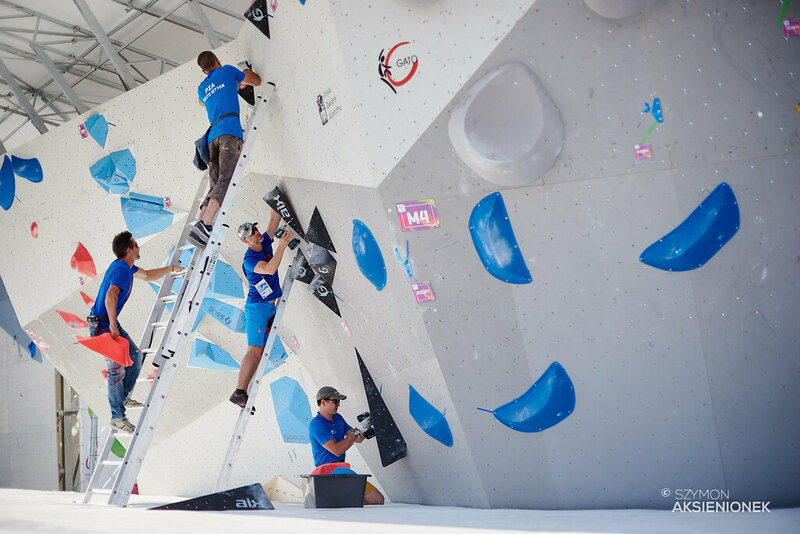 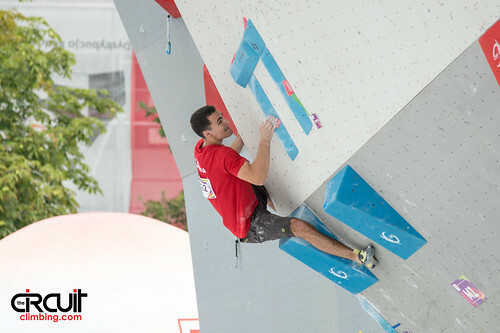 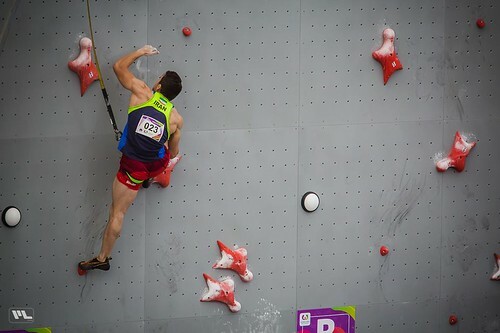 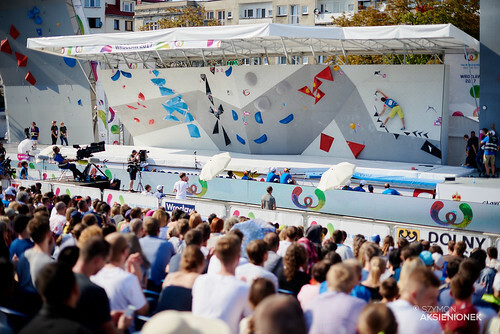 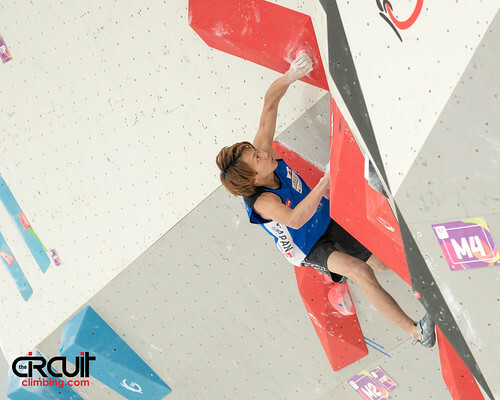 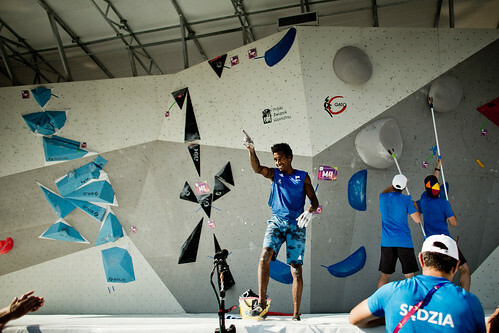 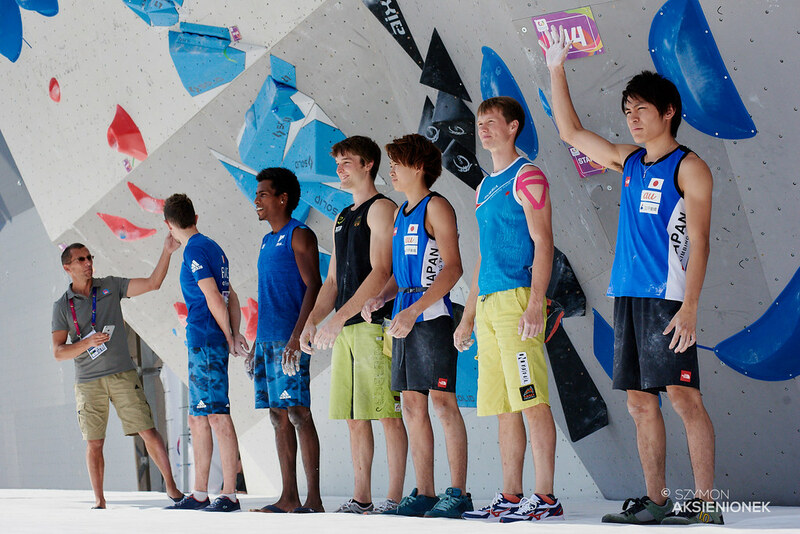 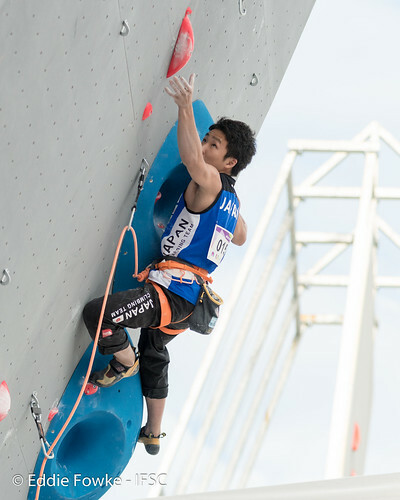 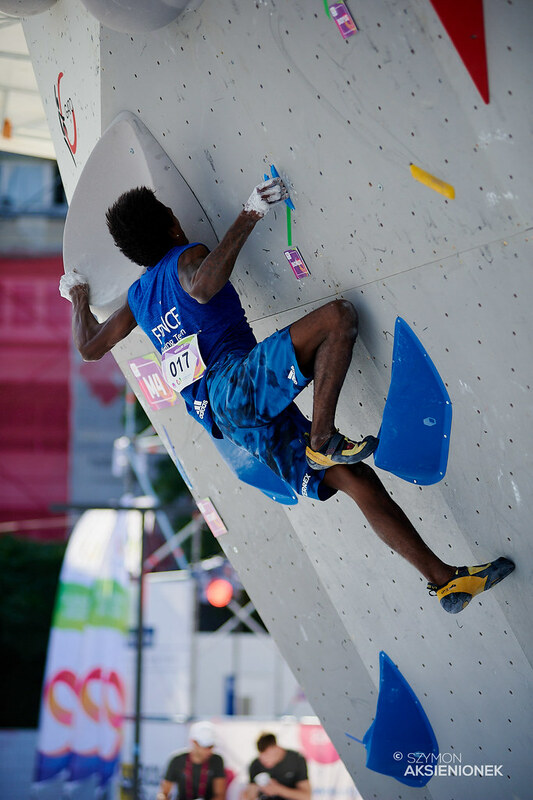 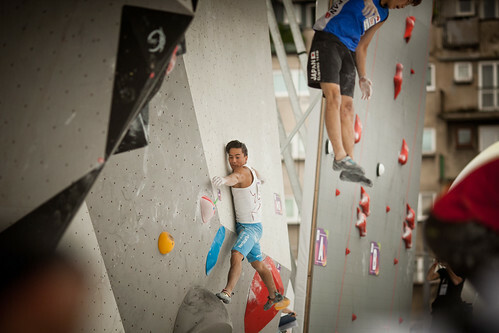 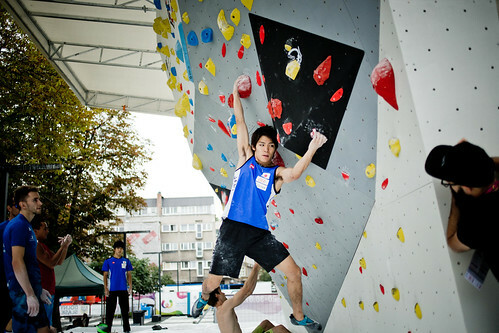 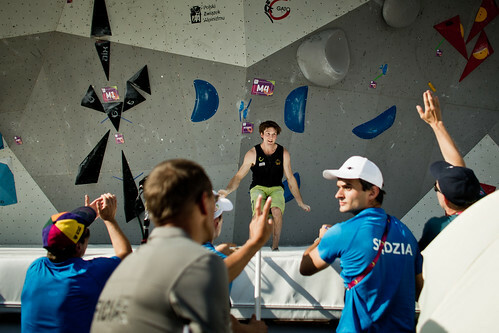 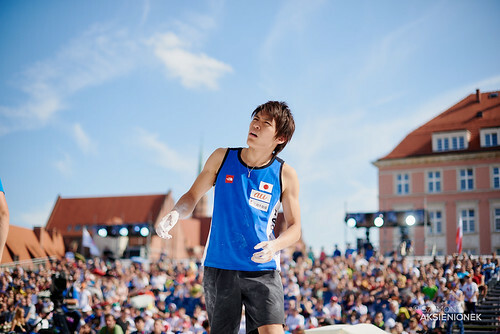 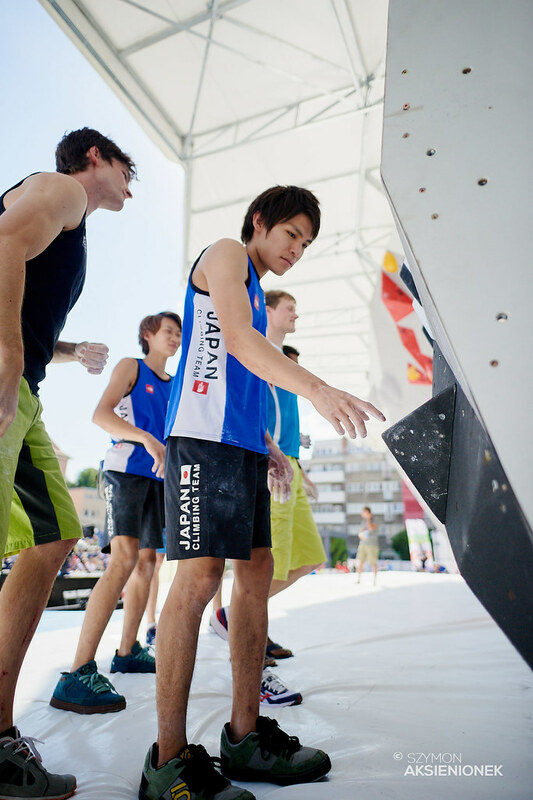 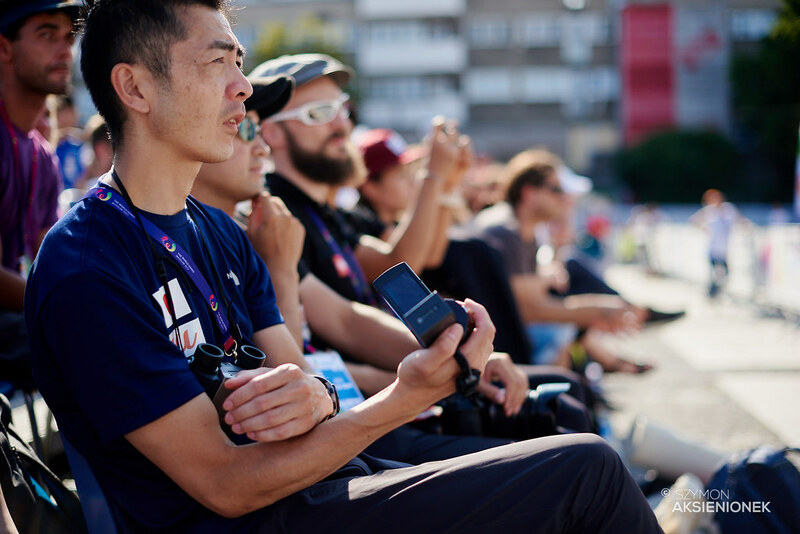 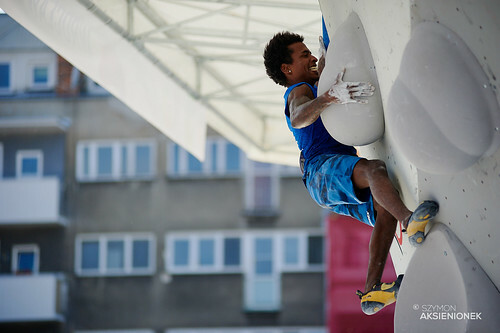 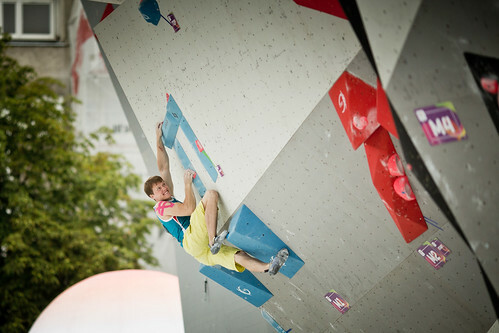 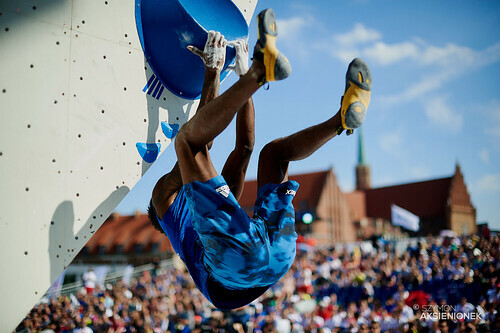 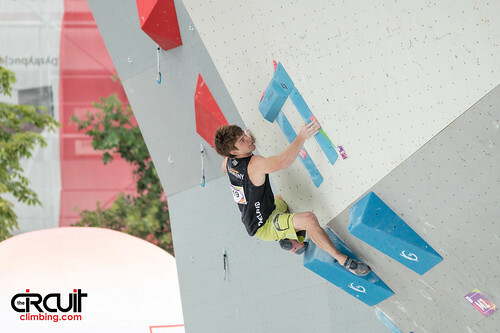 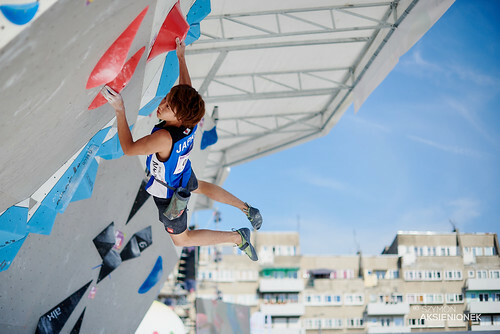 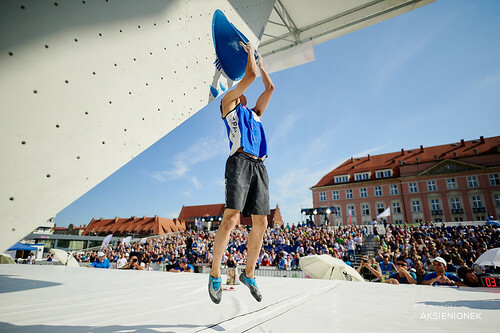 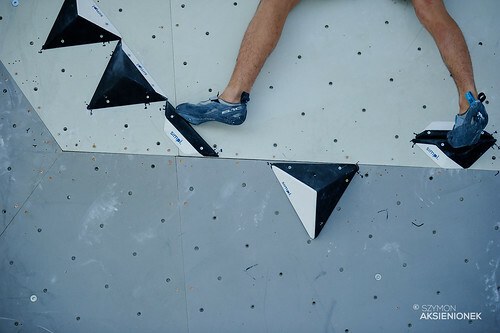 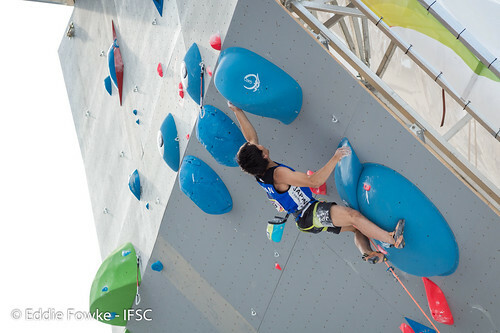 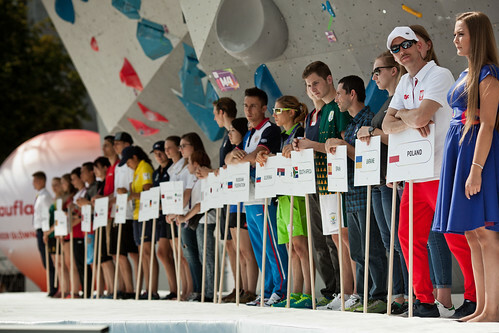 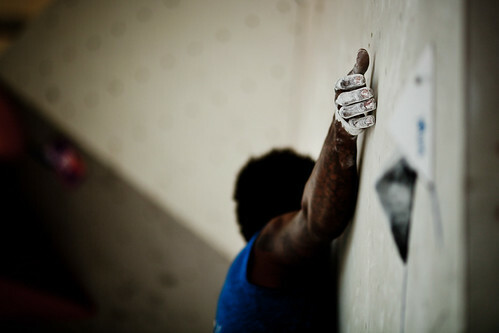 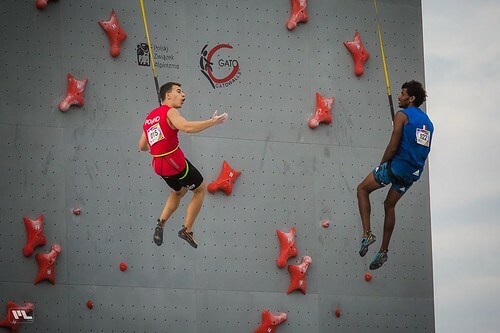 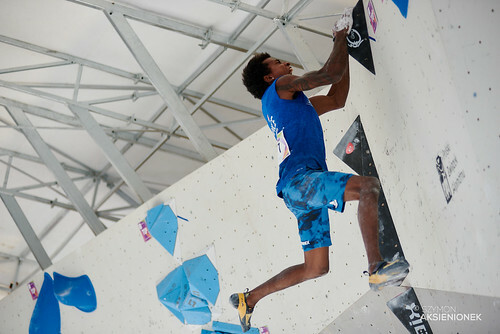 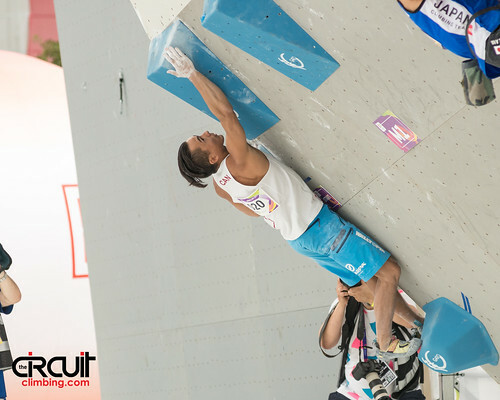 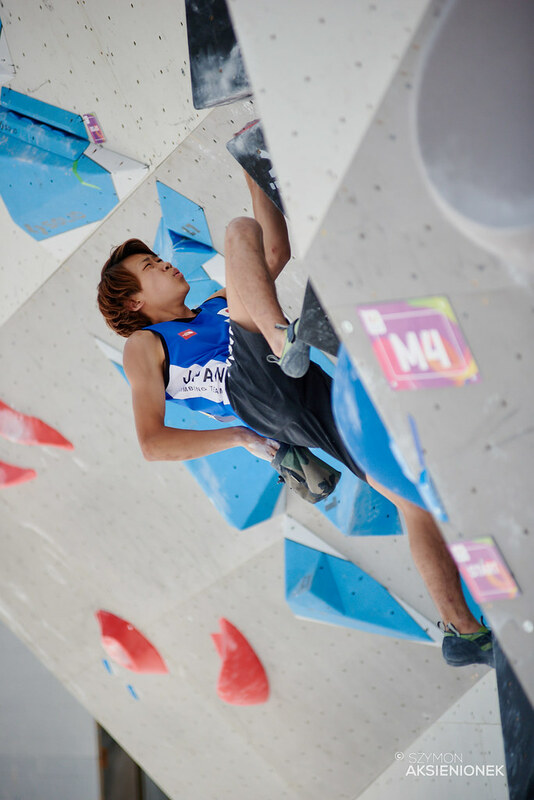 Yoshiyuki Ogata was the star of the Bouldering final for the men. 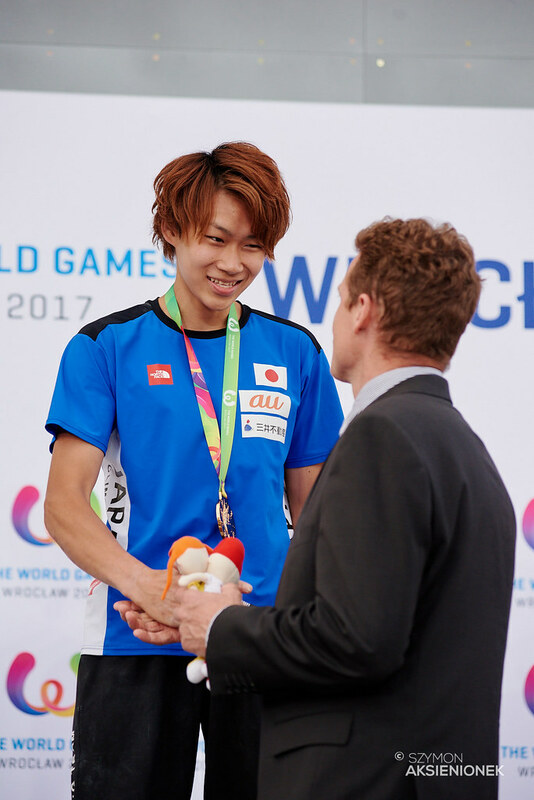 Qualifying for The World Games 2017 as a winner of the Asian Continental Championships Duyun 2016, the 19-year-old from Japan topped every problem and was the sole athlete to link all the powerful lateral moves of M2. 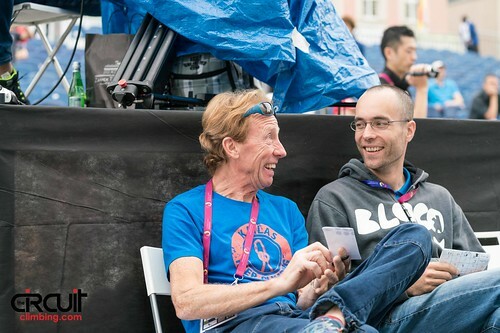 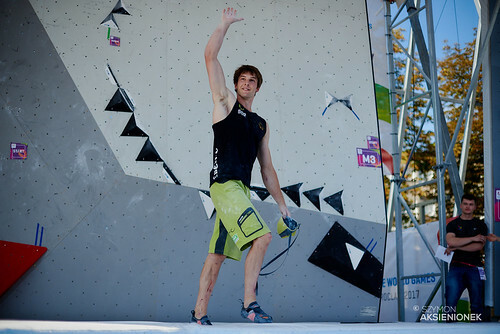 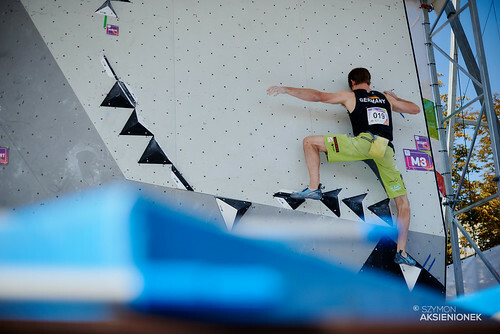 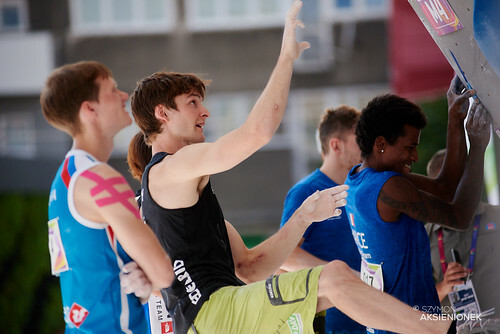 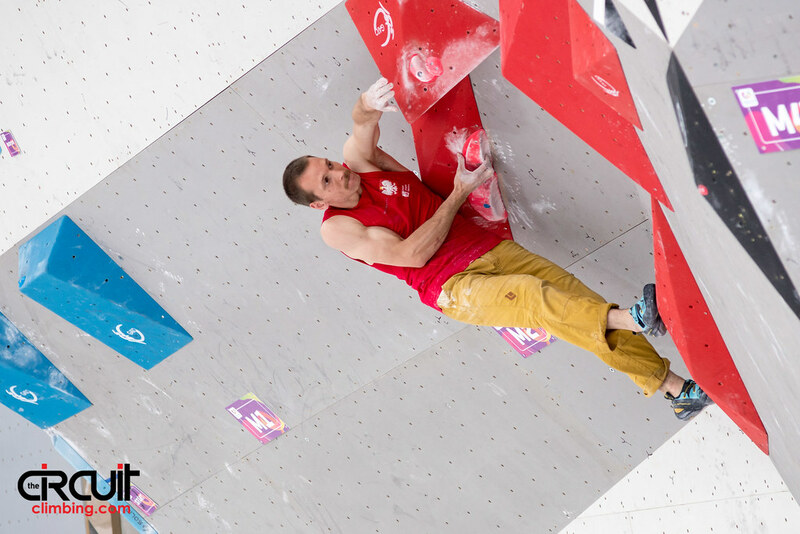 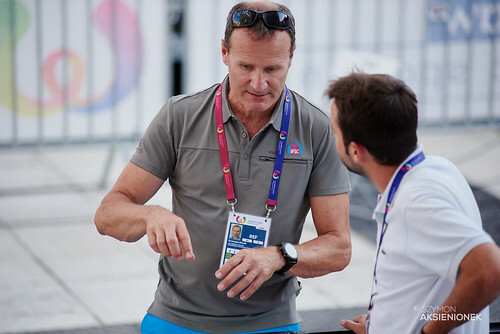 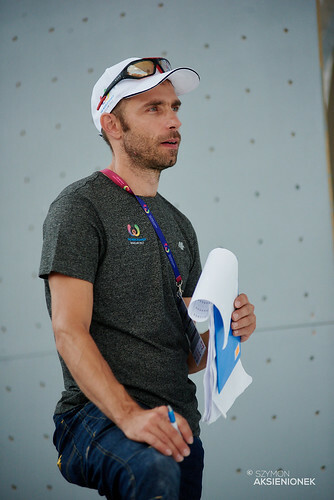 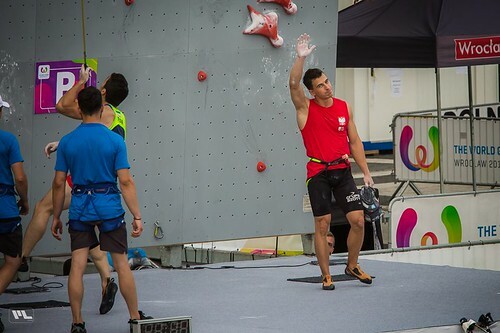 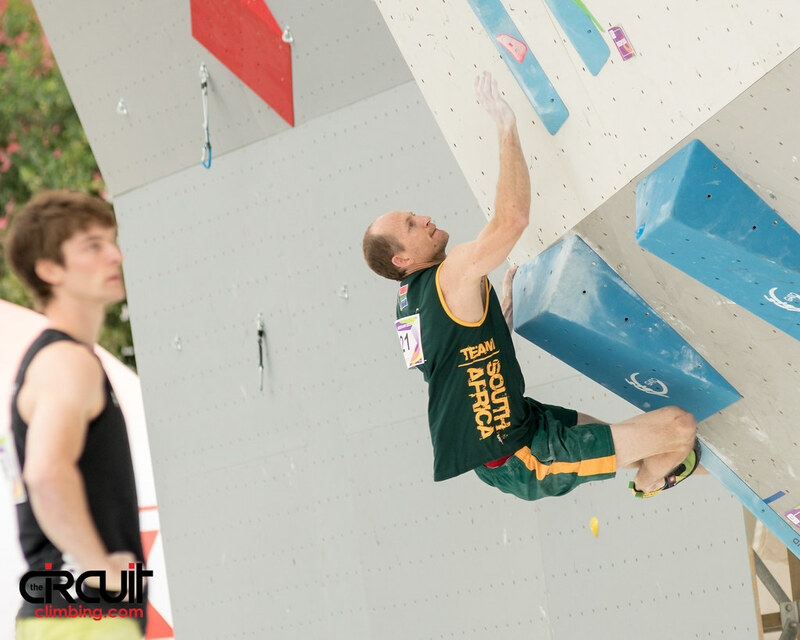 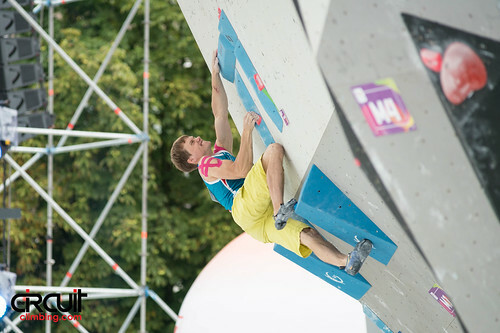 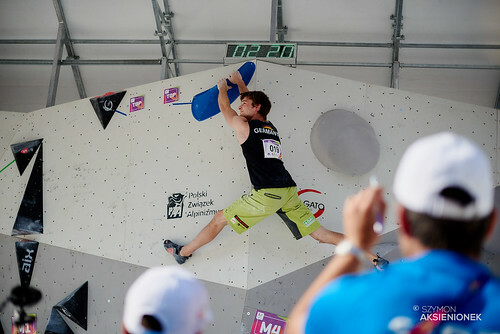 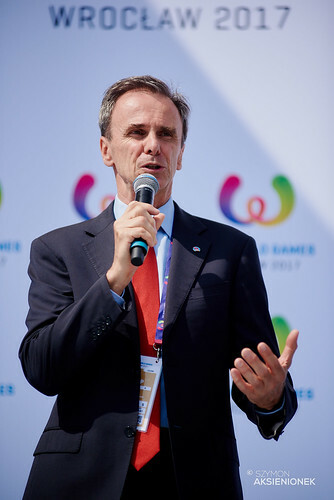 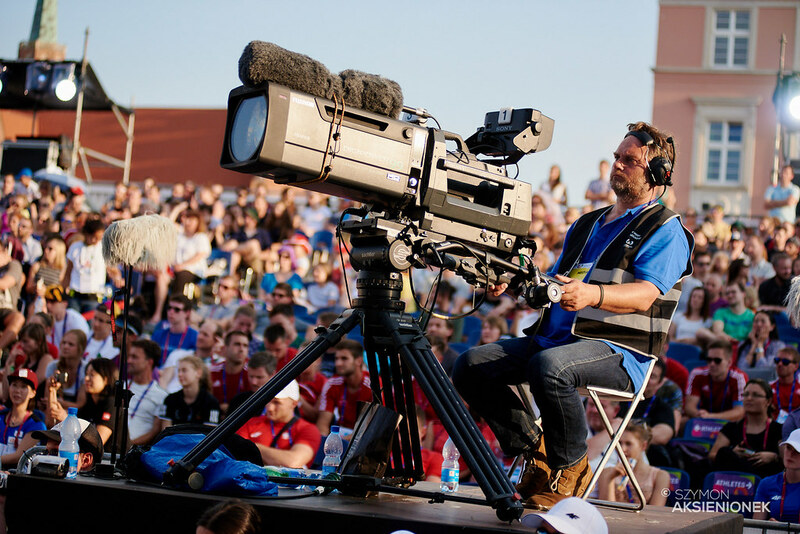 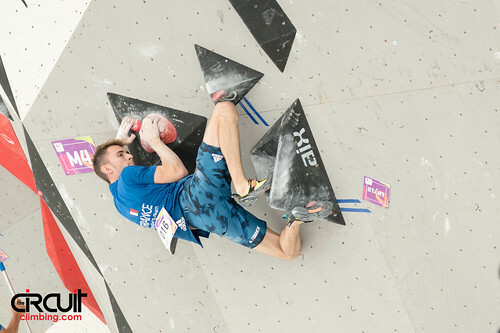 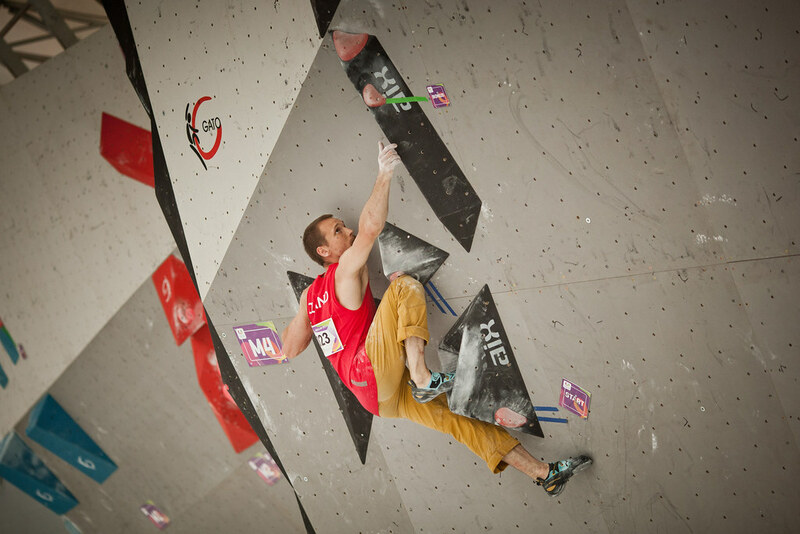 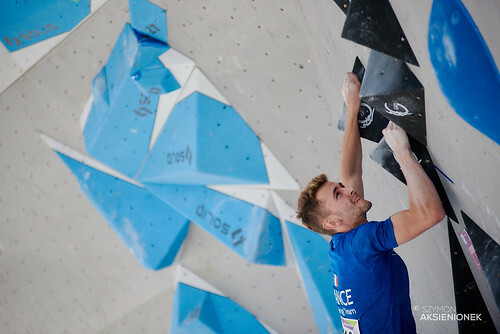 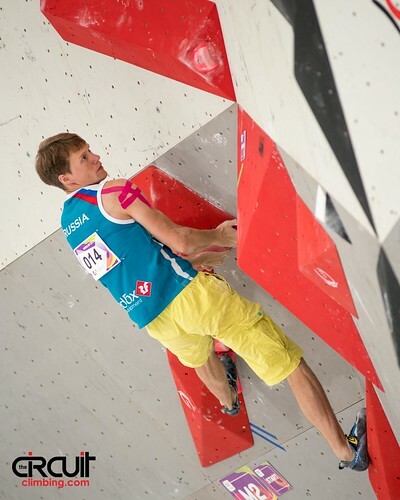 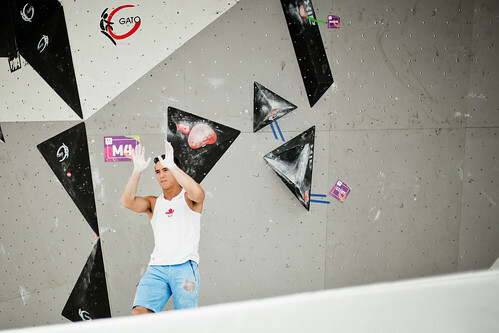 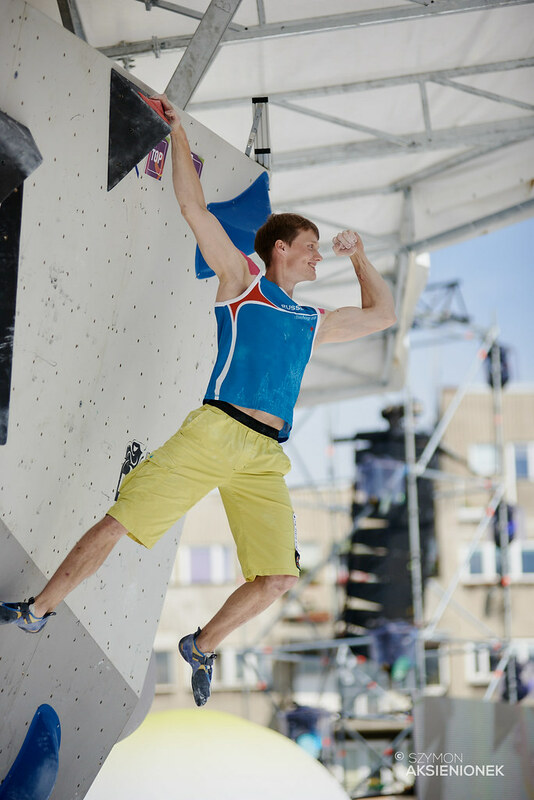 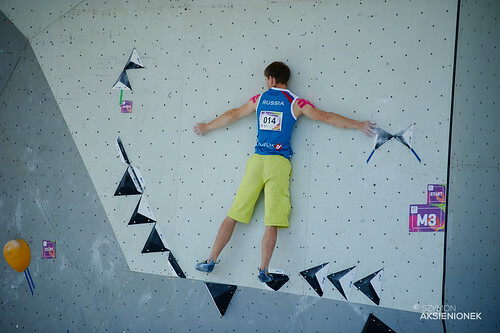 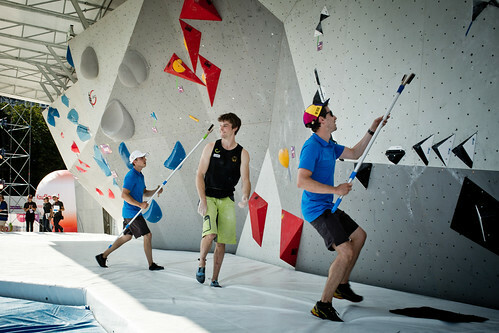 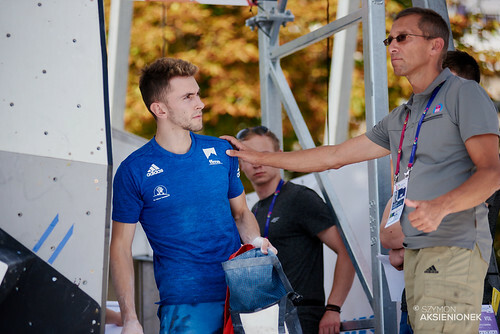 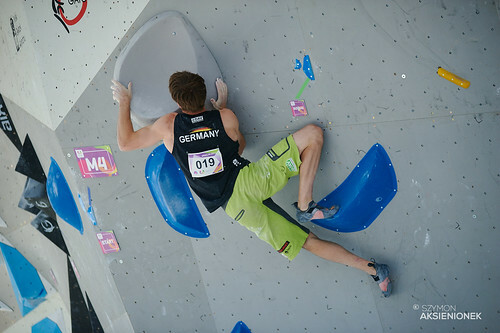 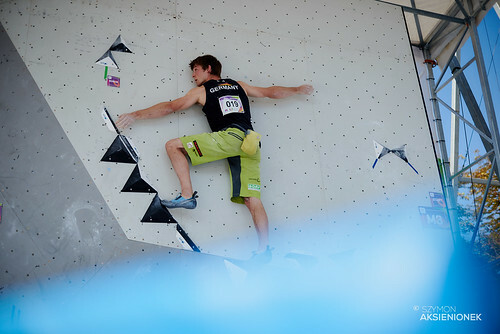 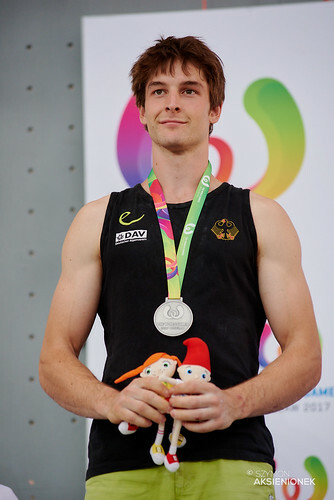 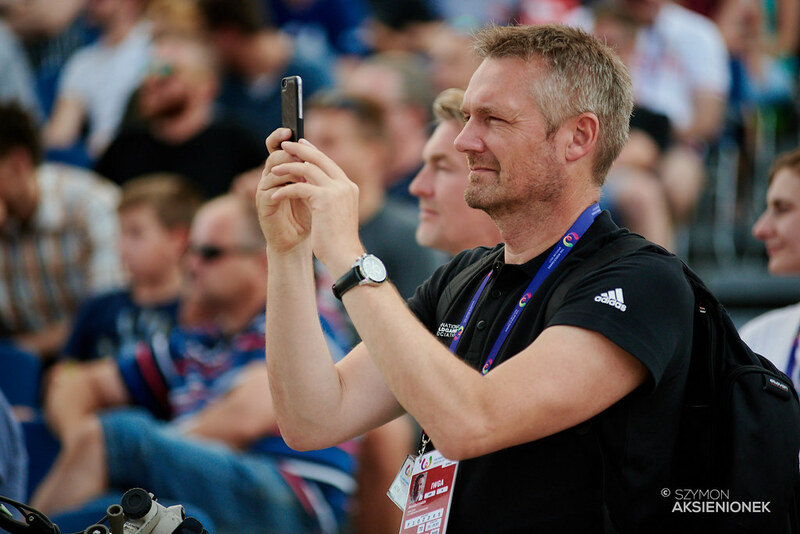 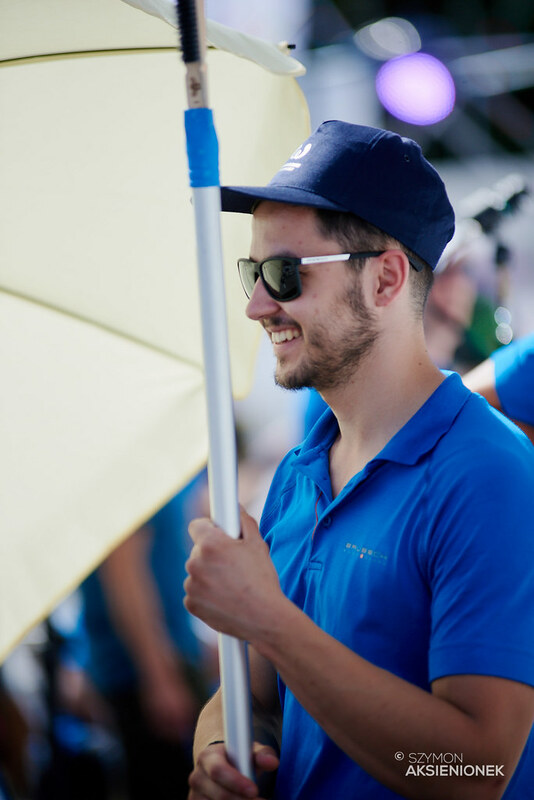 Most finalists topped M1 and M4, and Jan Hojer of Germany earned the Silver medal by adding a successful walk across the volumes of M3. Russian Aleksei Rubtsov completed the podium with two quick ascents, successfully wrestling with the spherical features of M4 in one less attempt than Mickael Mawem of France. 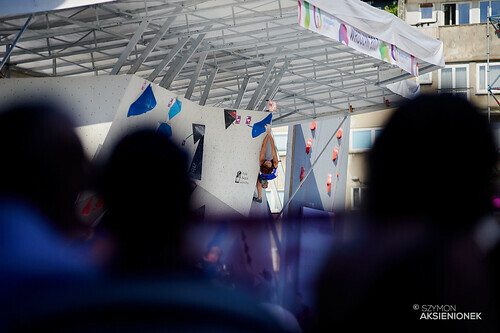 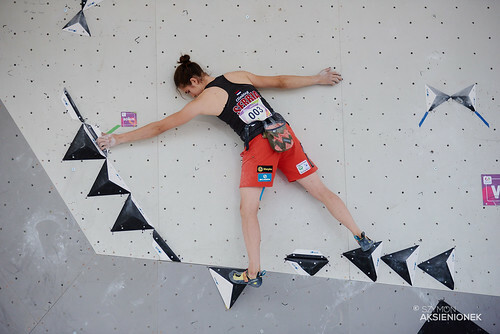 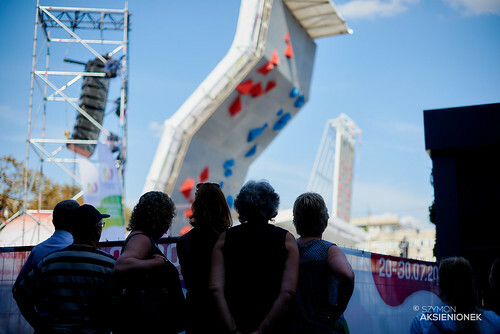 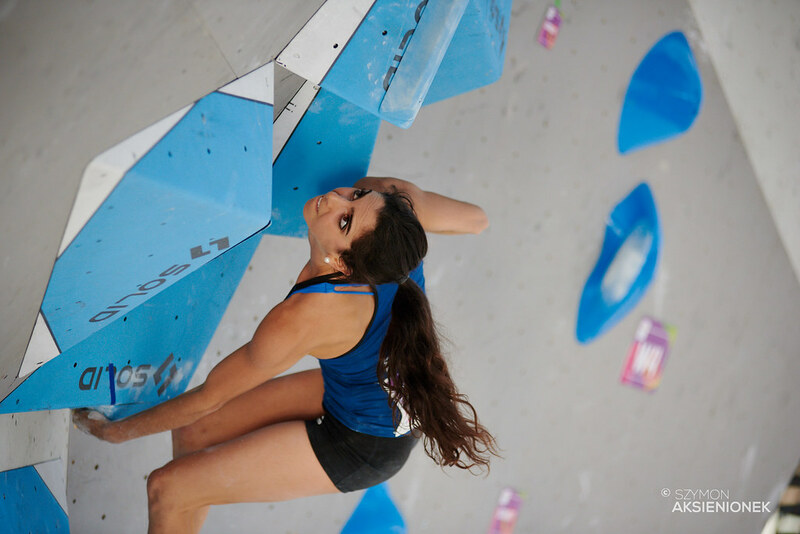 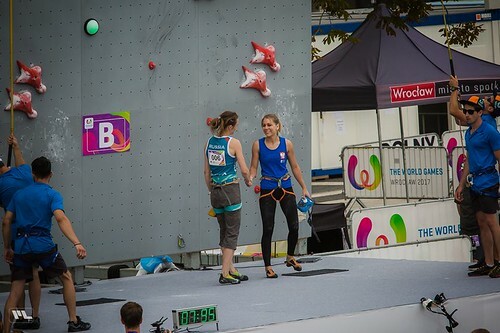 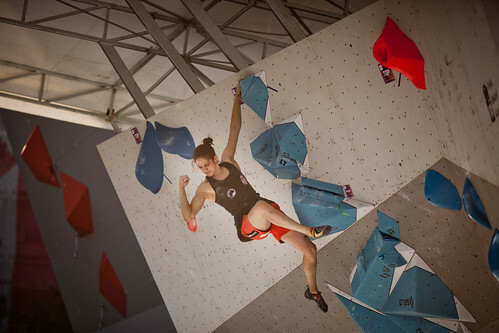 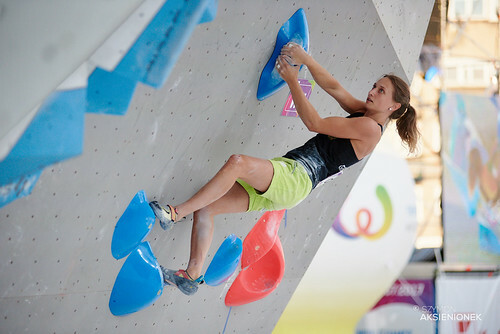 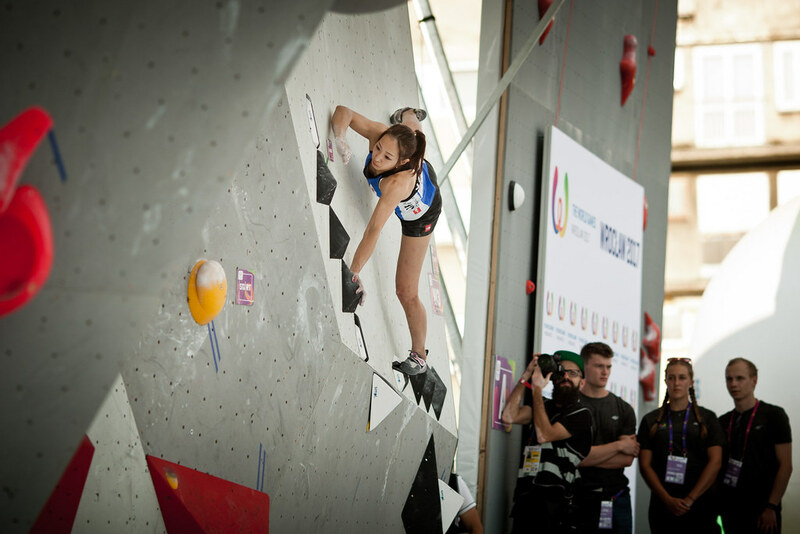 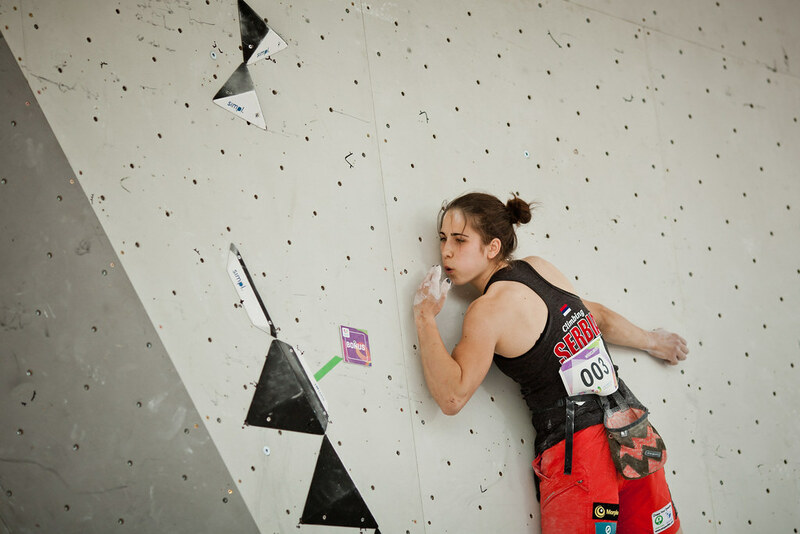 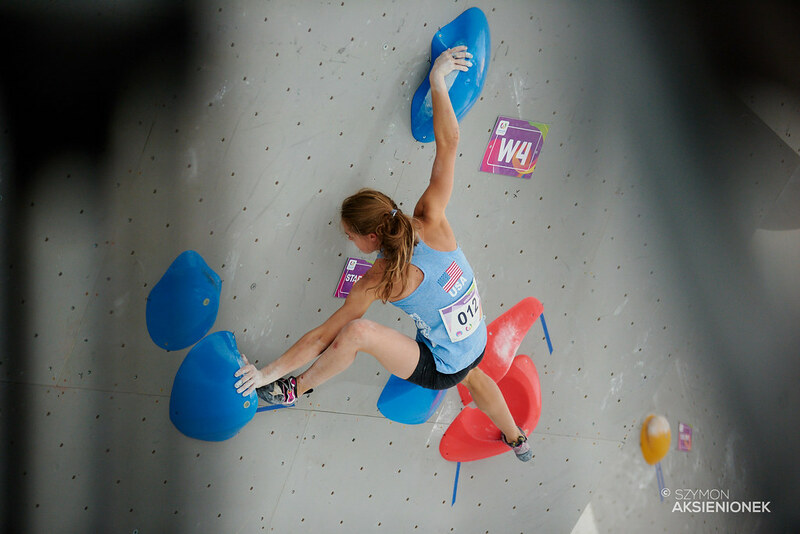 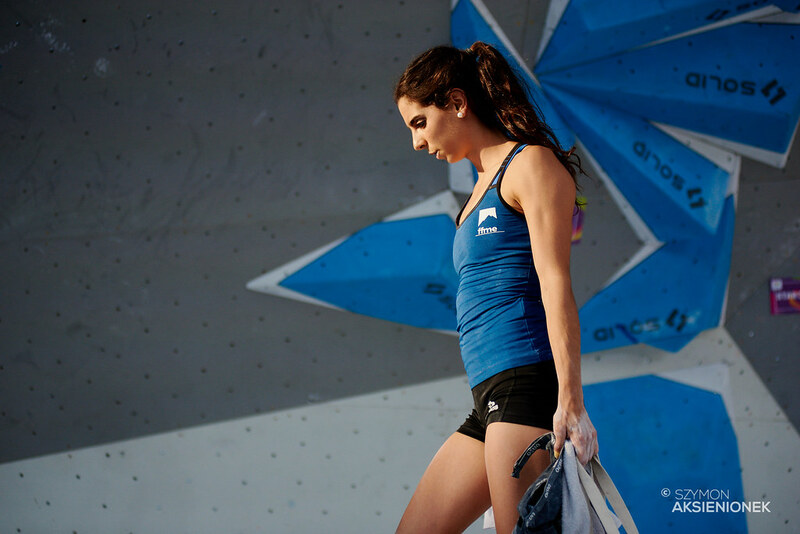 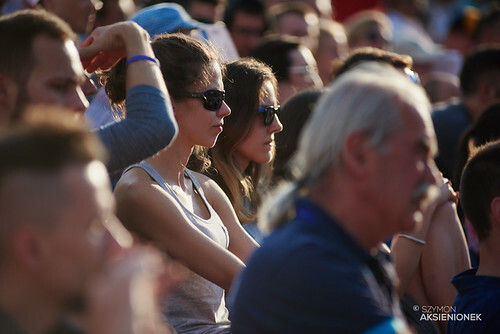 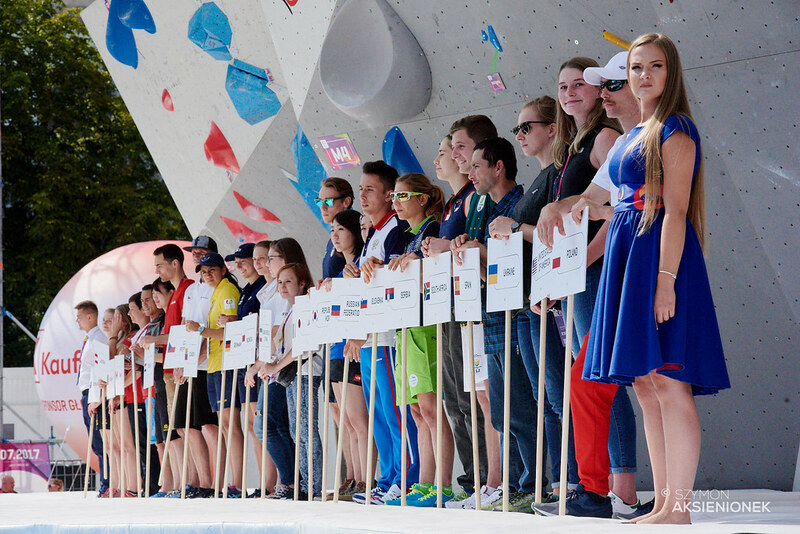 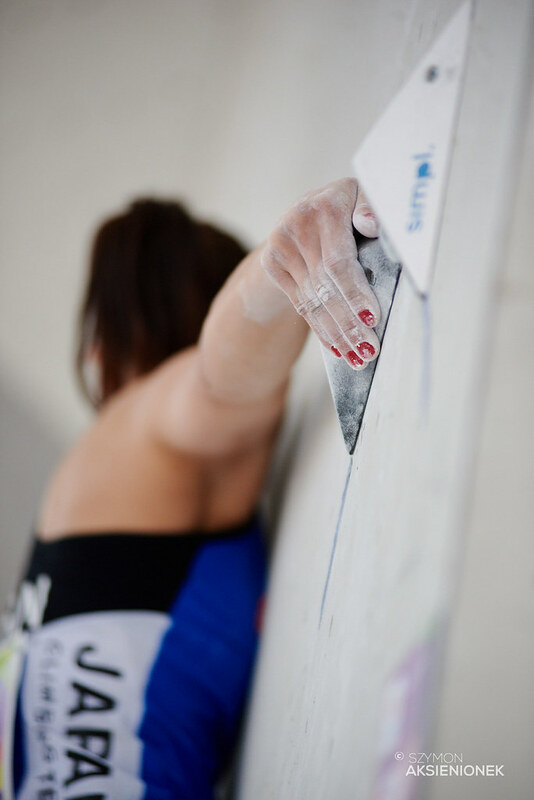 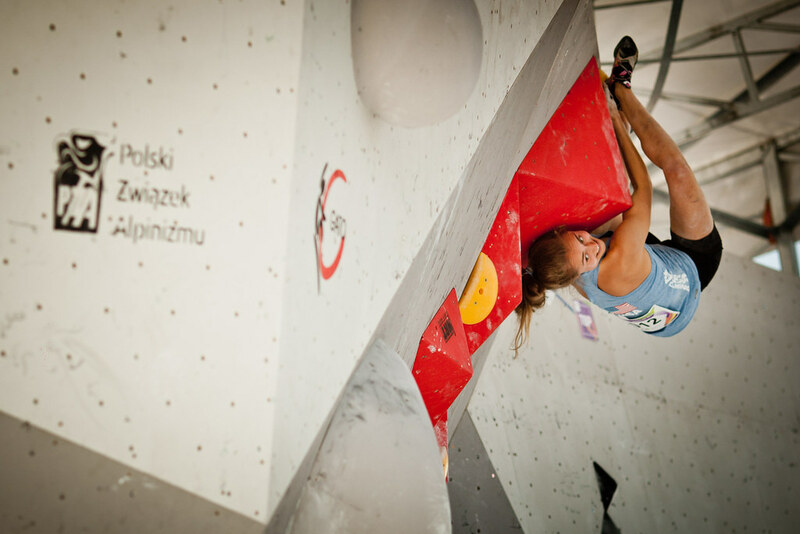 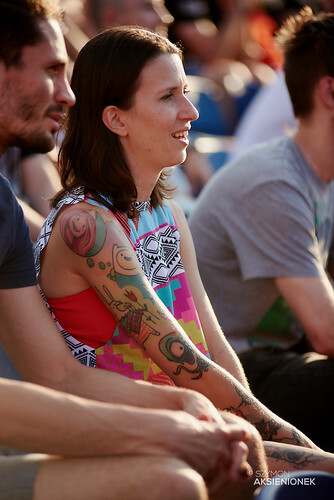 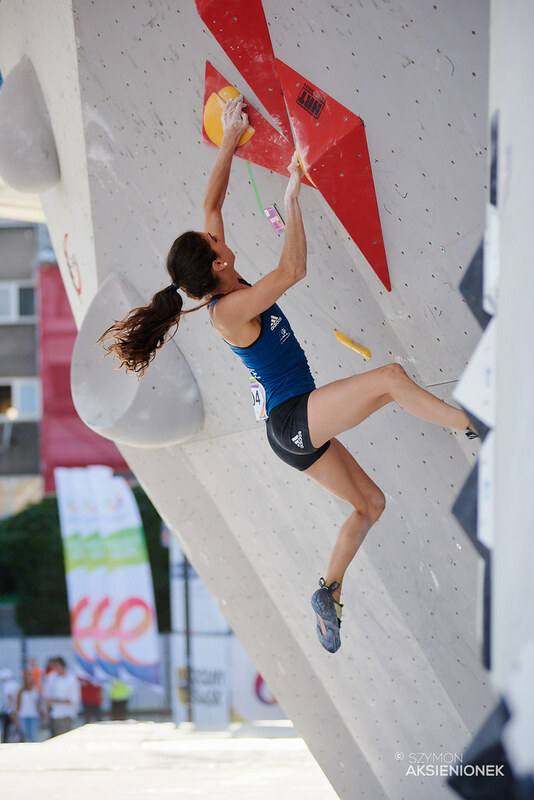 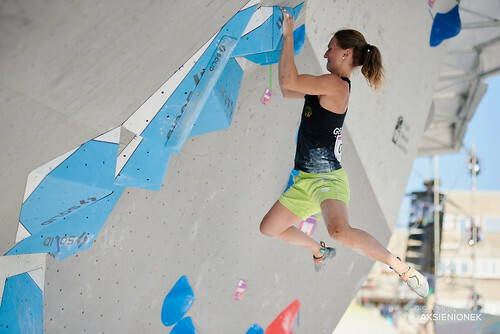 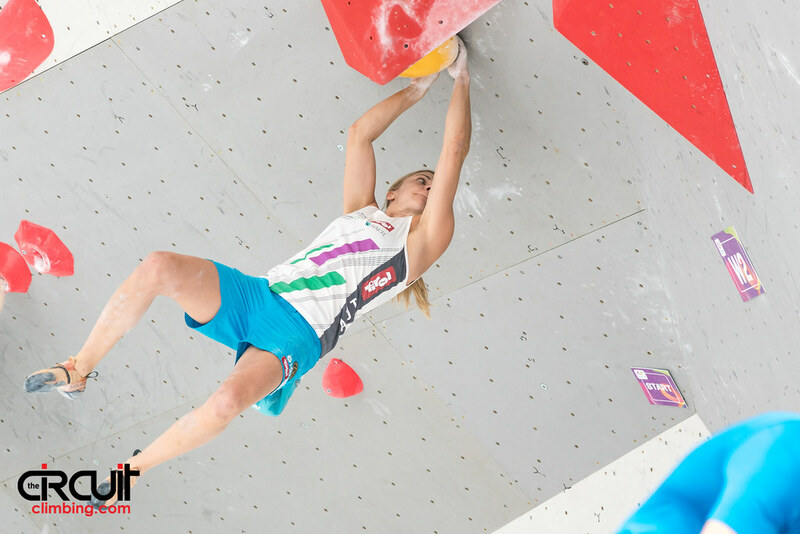 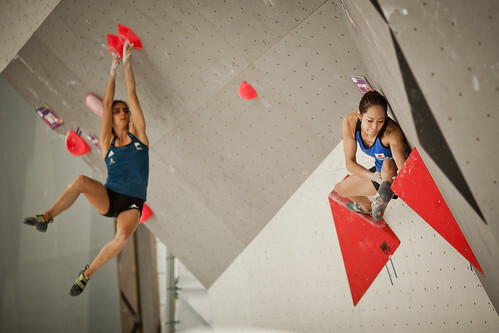 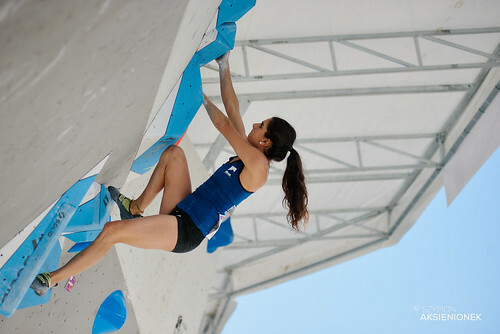 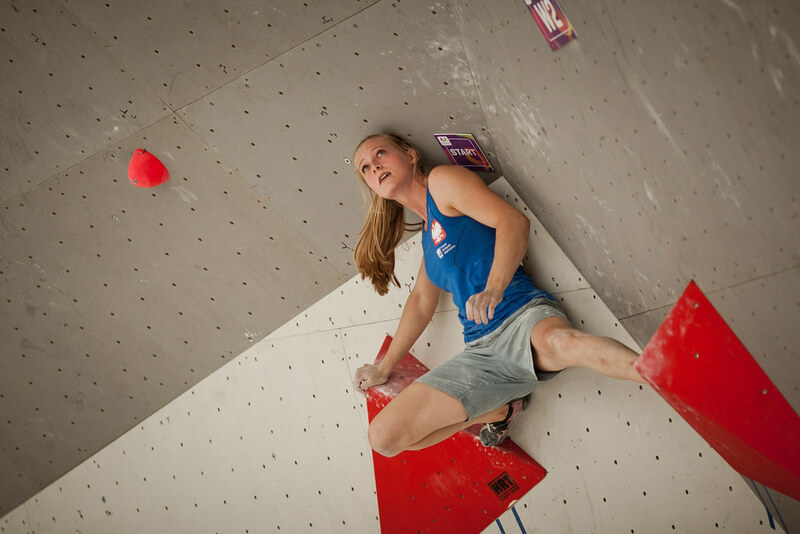 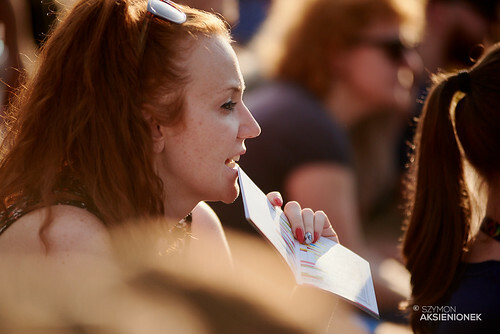 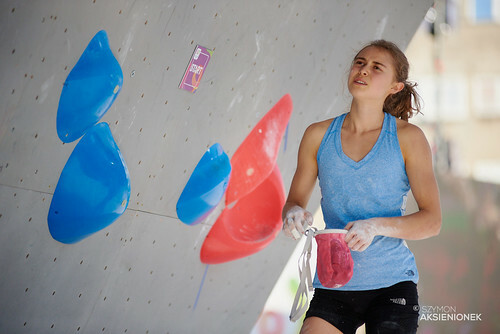 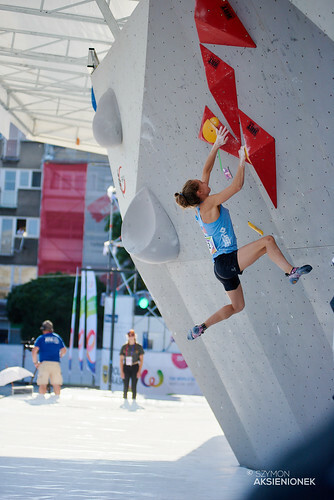 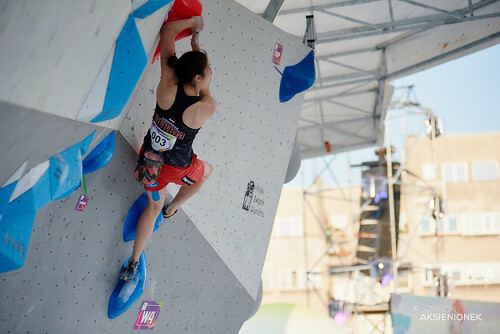 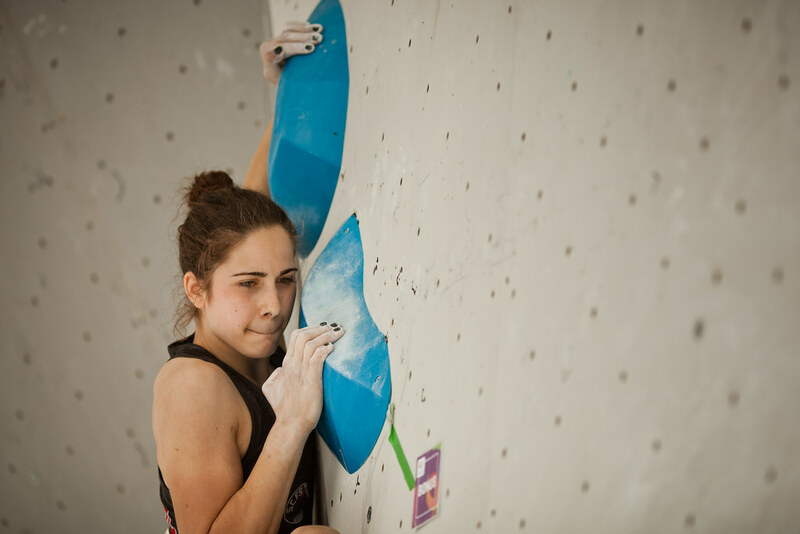 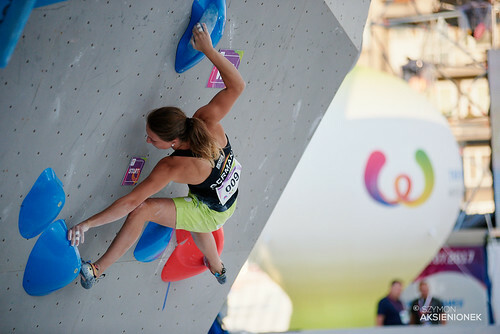 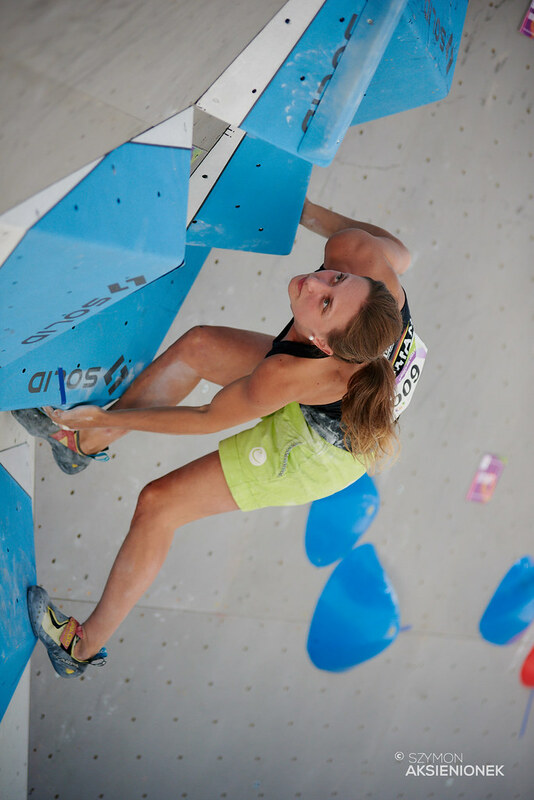 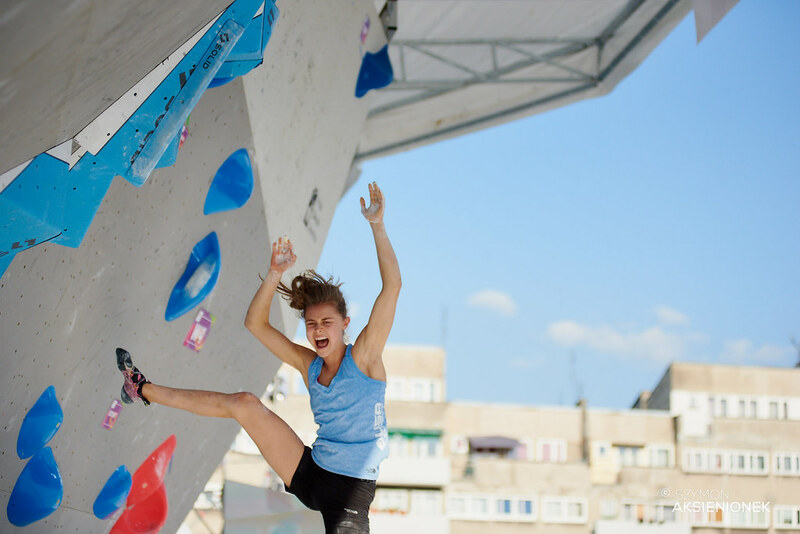 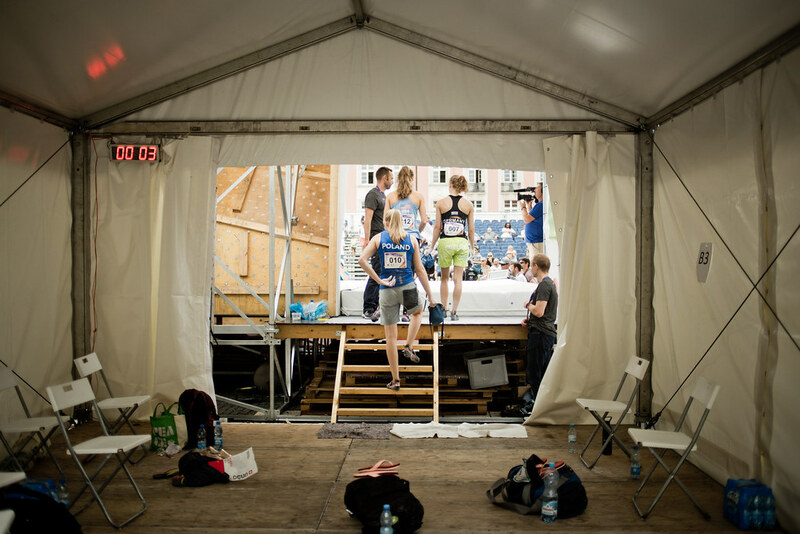 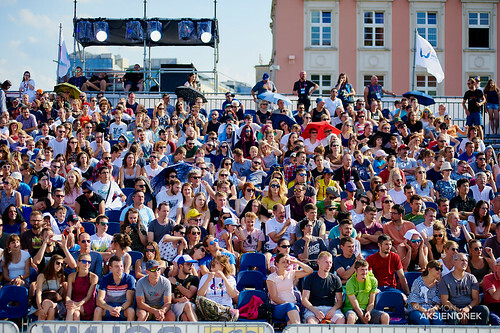 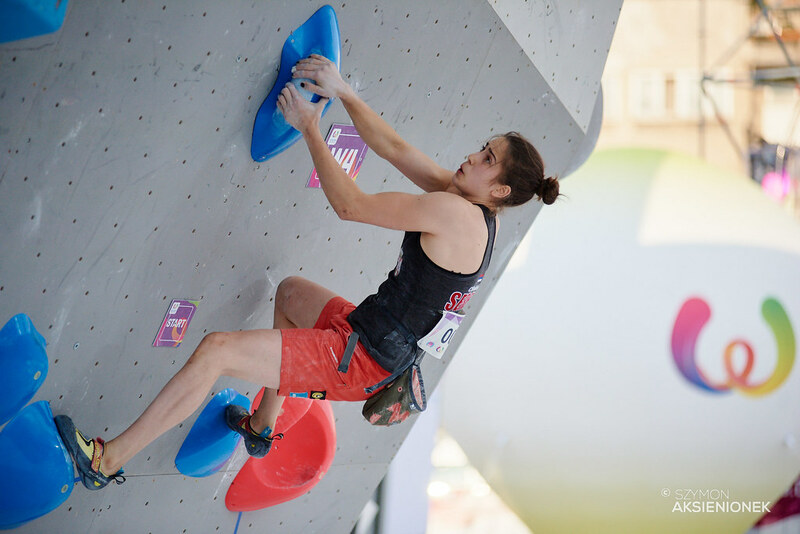 Stasa Gejo of Serbia stole the show in the women’s Bouldering final. 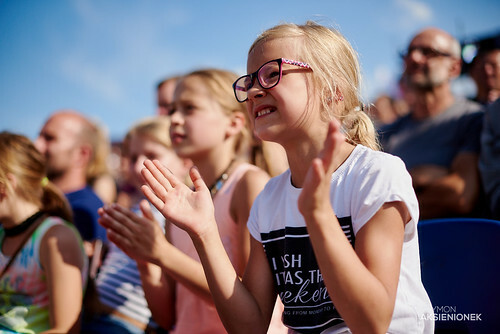 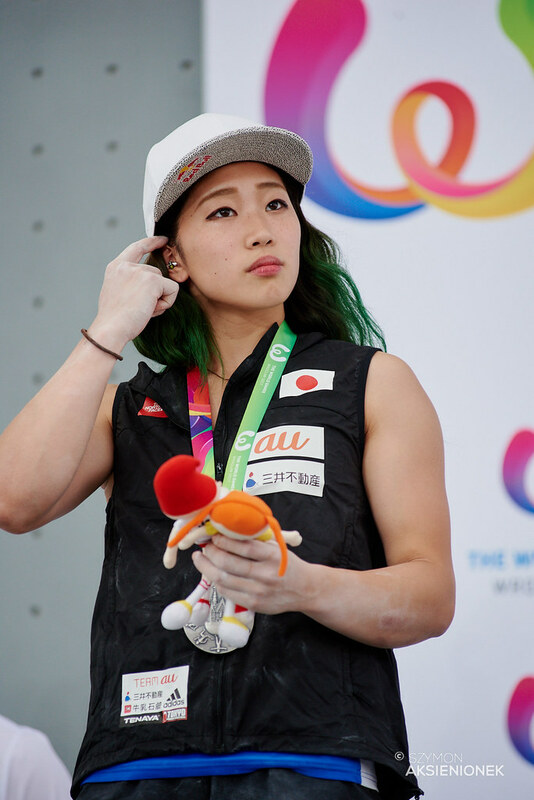 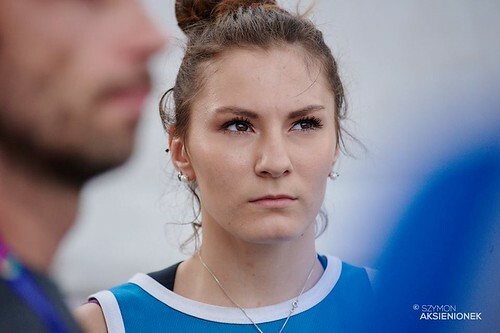 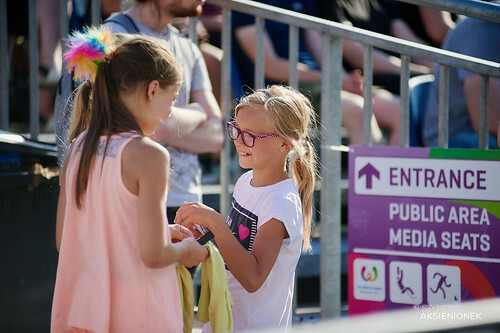 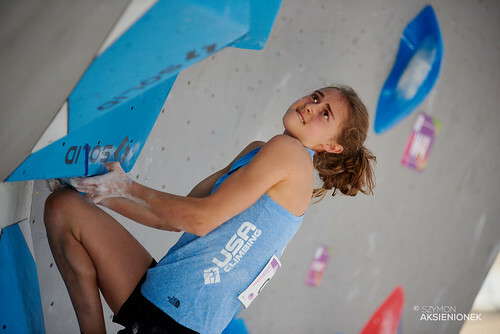 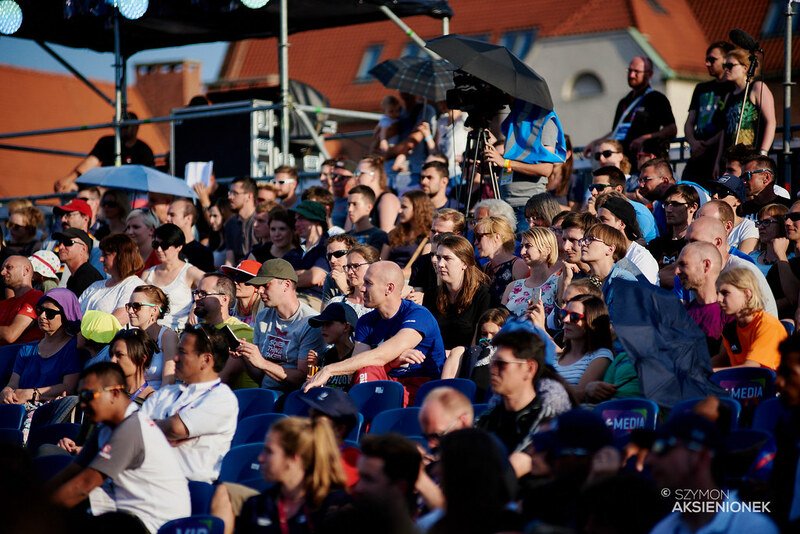 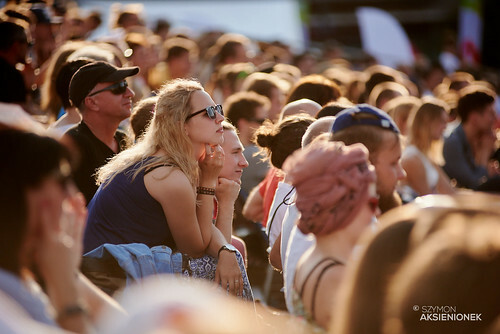 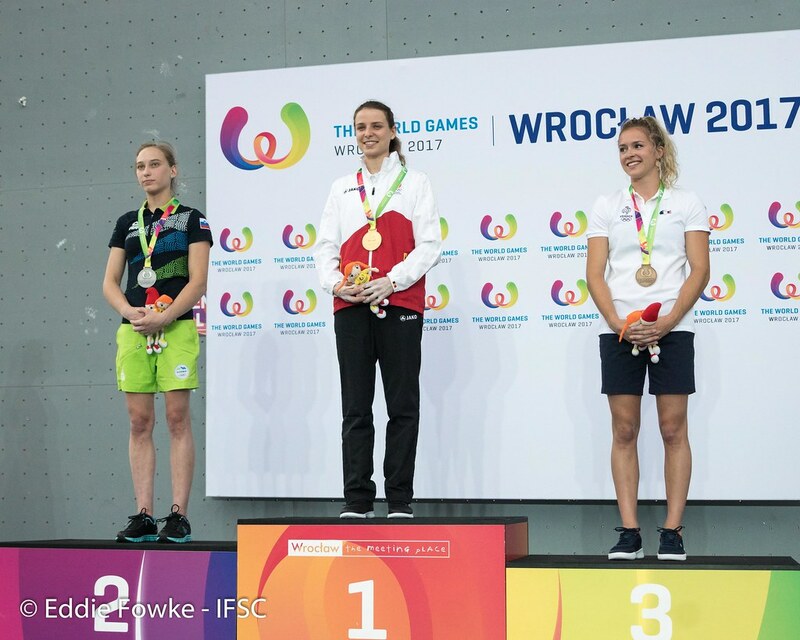 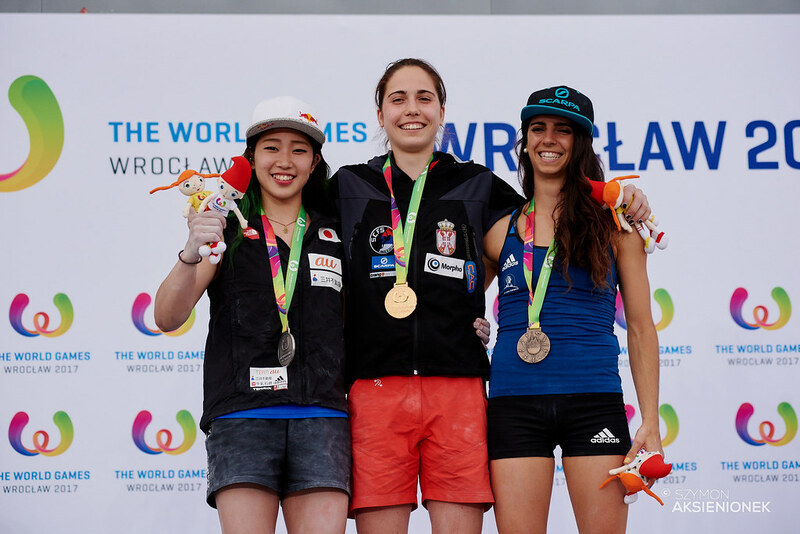 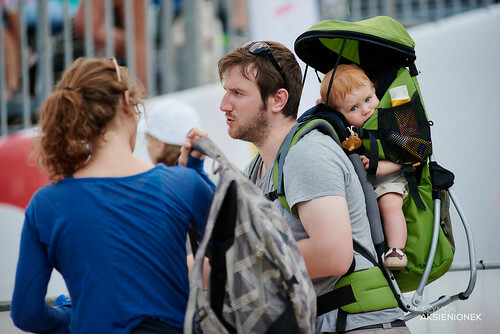 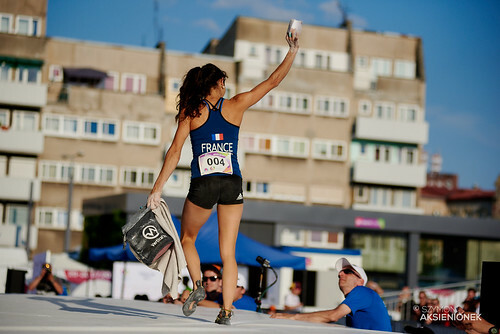 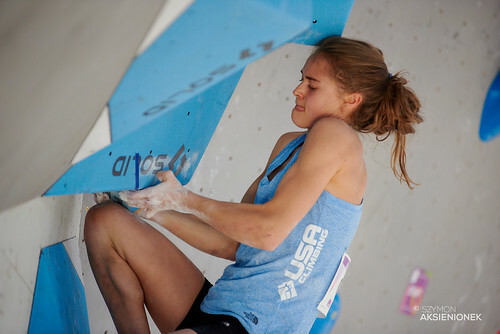 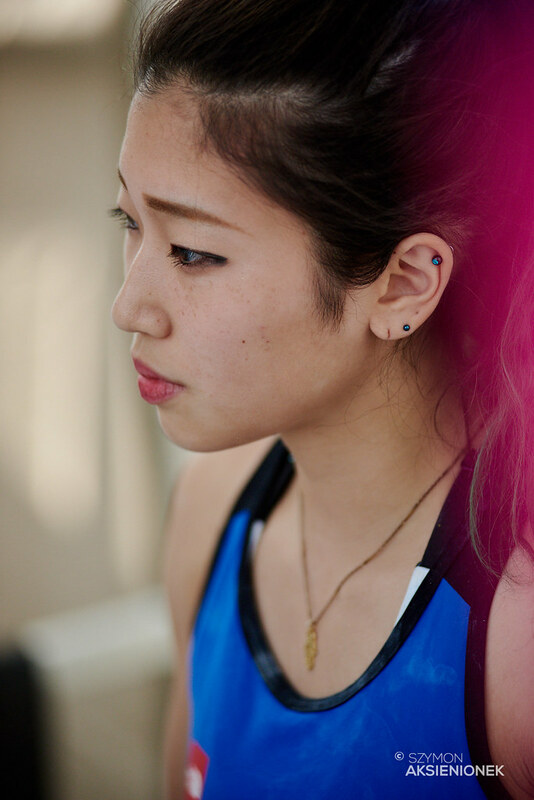 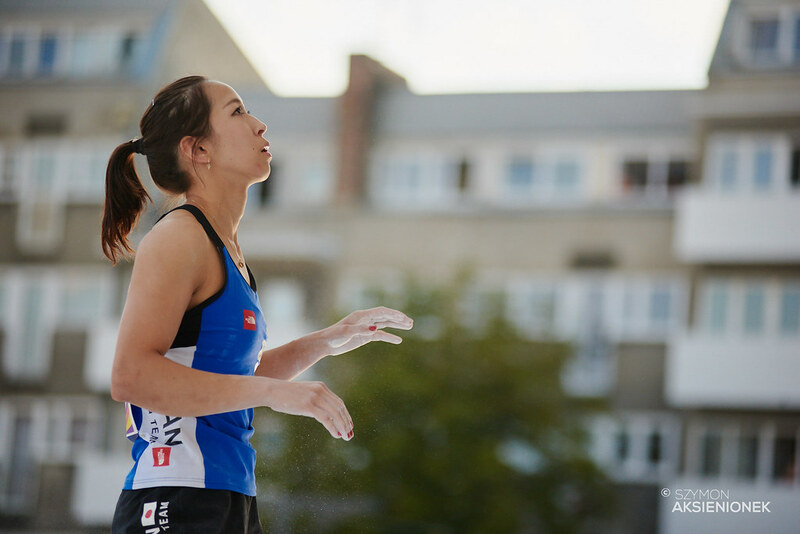 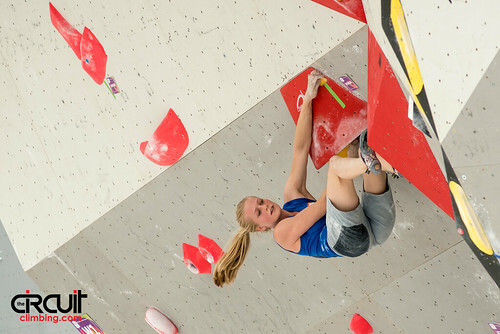 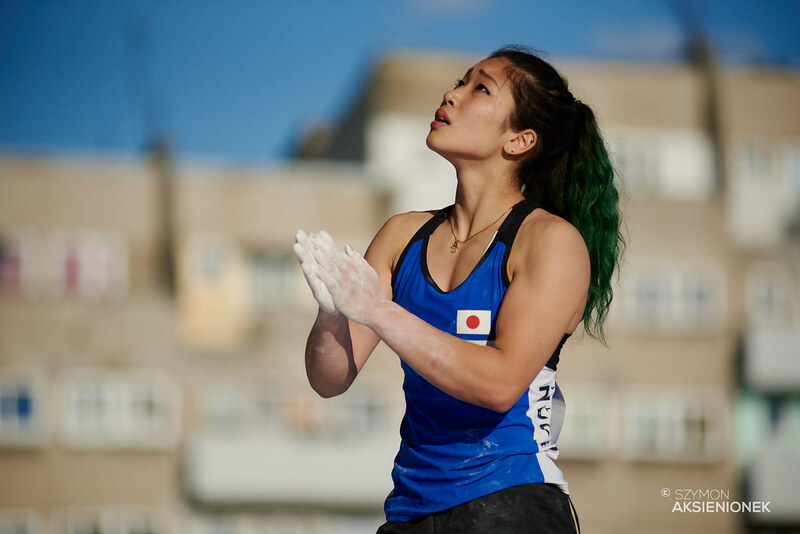 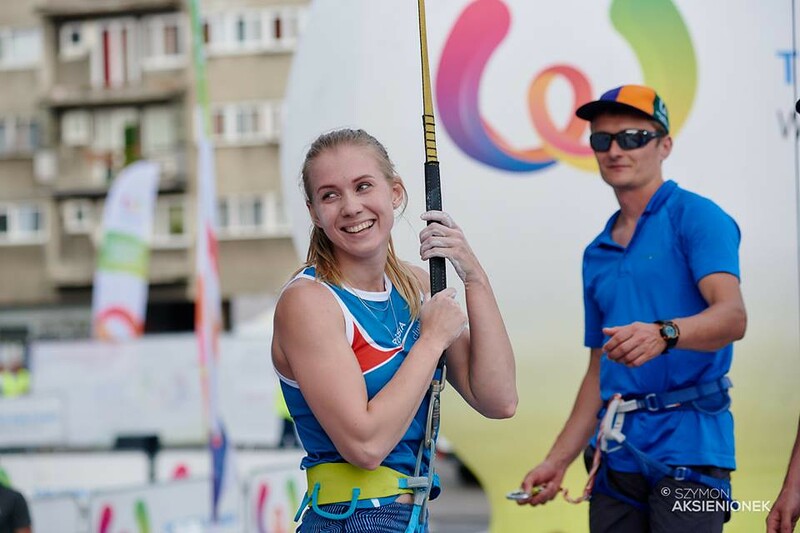 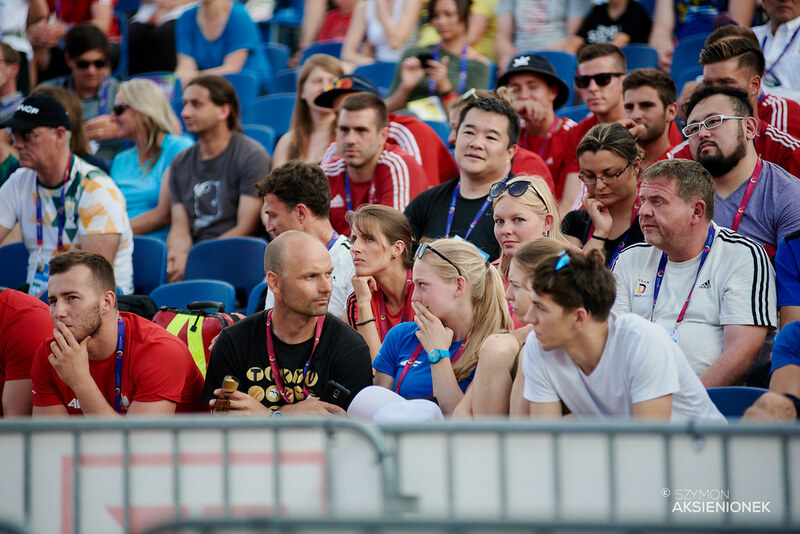 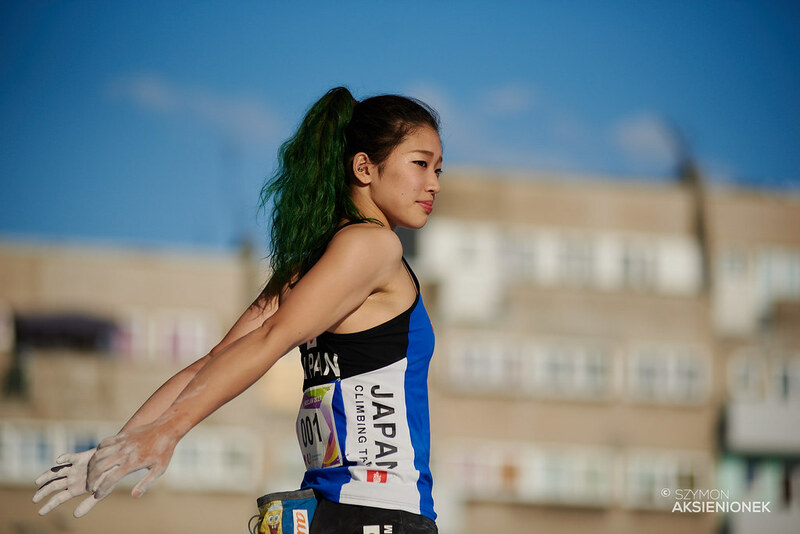 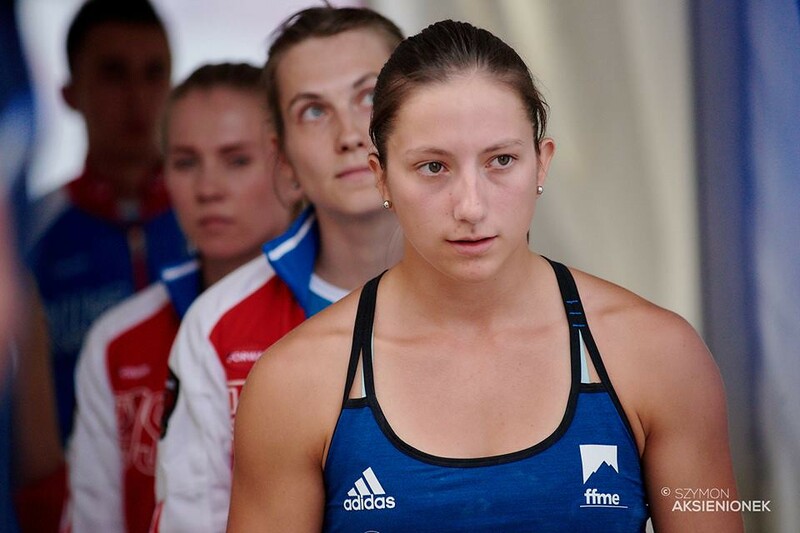 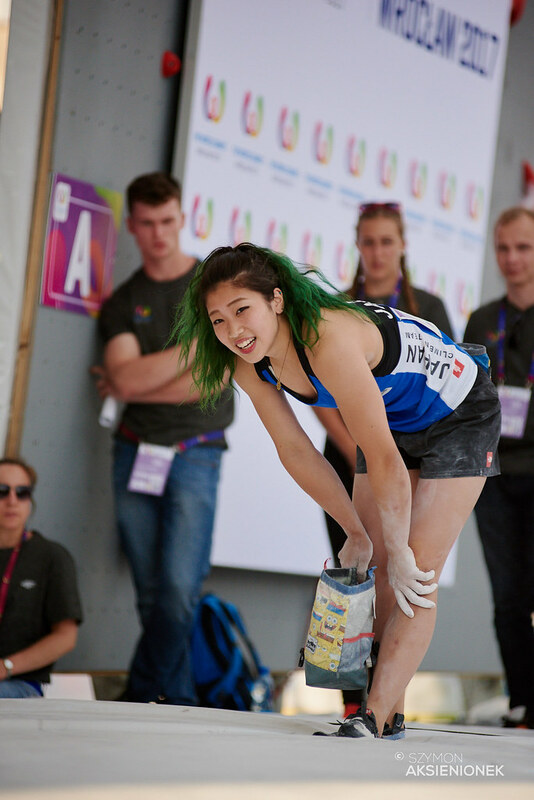 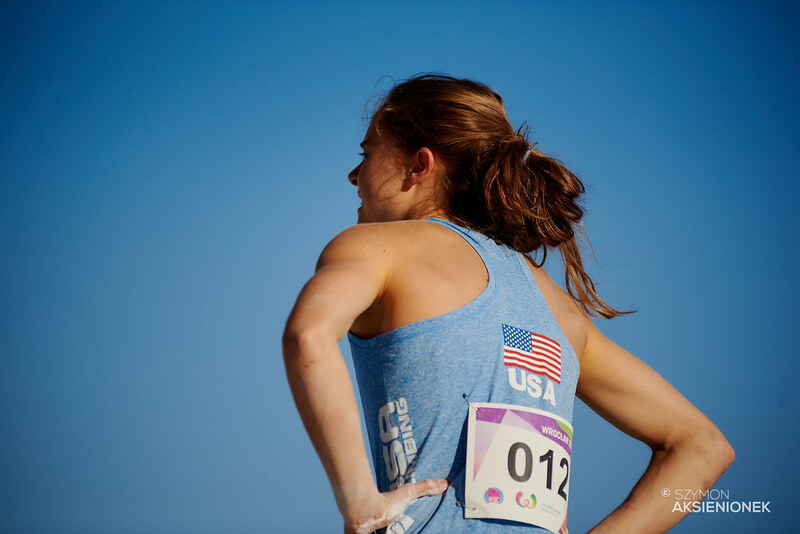 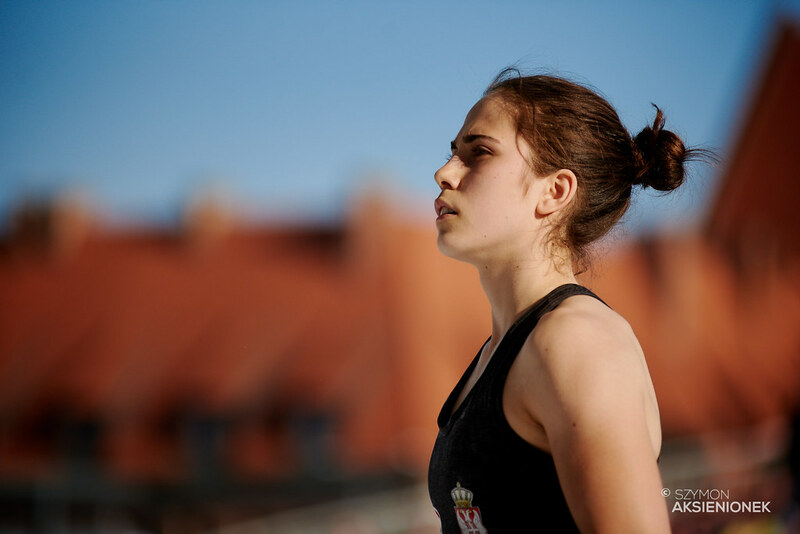 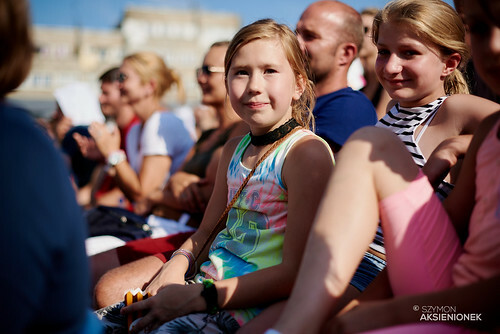 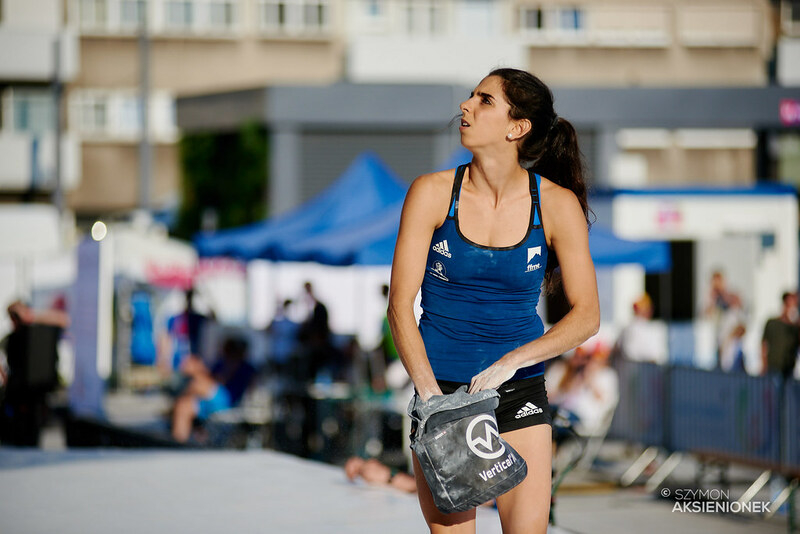 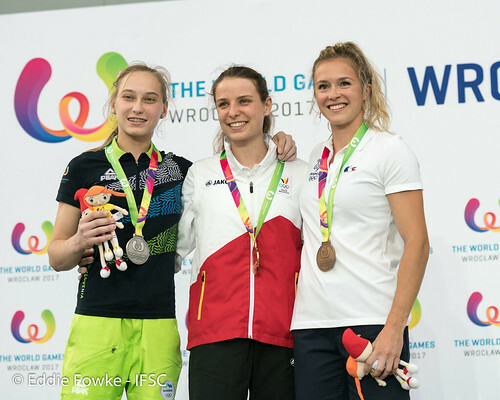 Qualifying with her strong performance at the IFSC World Championships Paris 2016 and also 19 years old, Gejo claimed her first Gold medal outside of youth events. 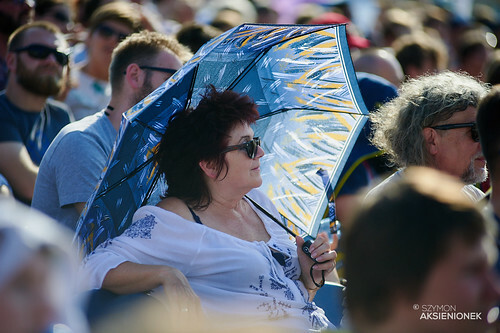 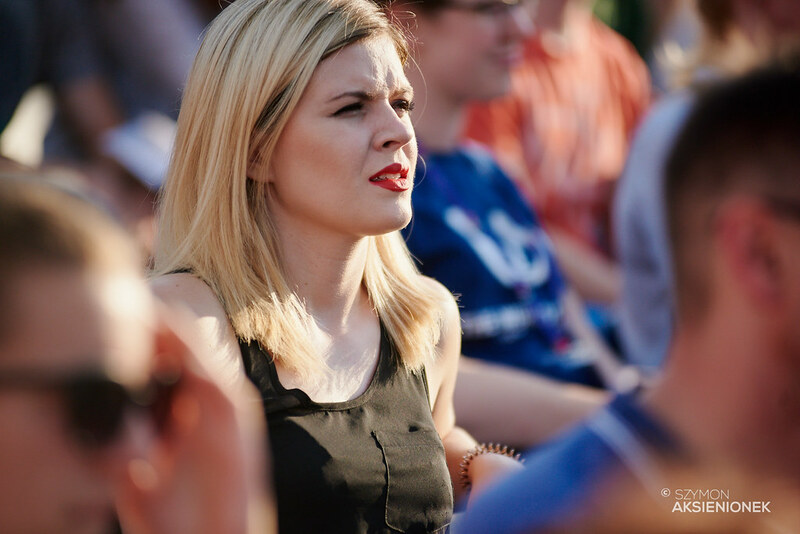 She also topped every problem, including a flash of W3. Miho Nonaka of Japan came in second with three tops, and Fanny Gibert of France placed 3rd with two flashes, one attempt less than Akiyo Noguchi of Japan. 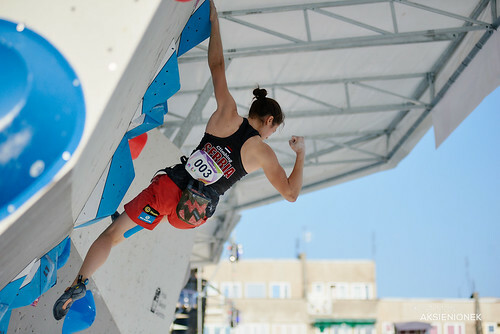 Iuliia Kaplina of Russia continues to lower the women’s Speed world record. 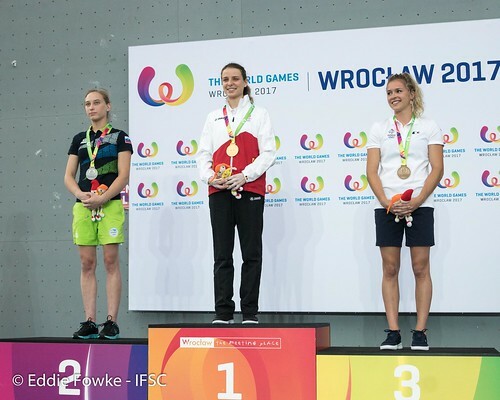 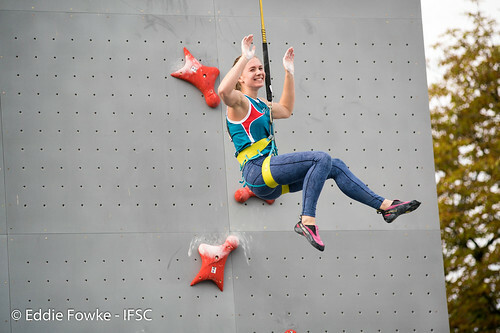 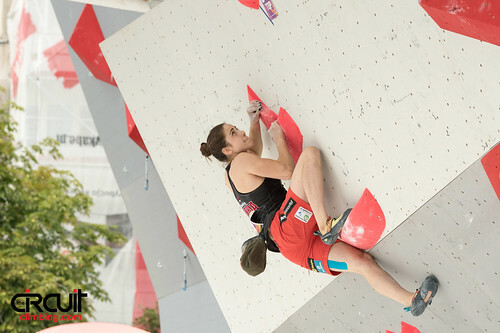 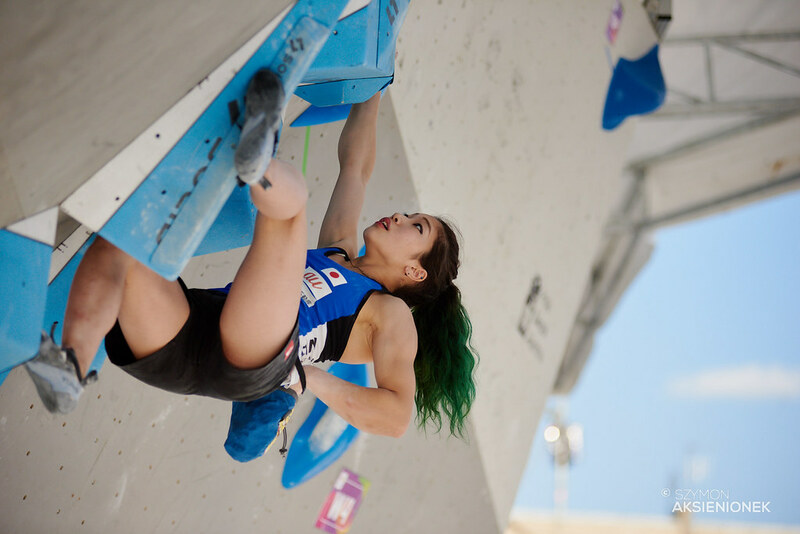 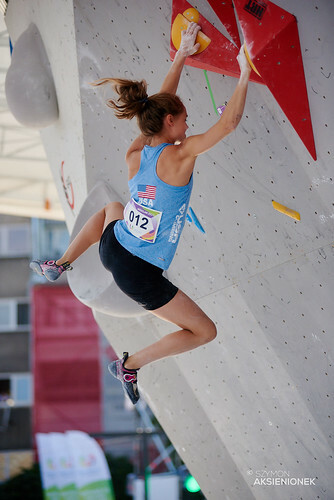 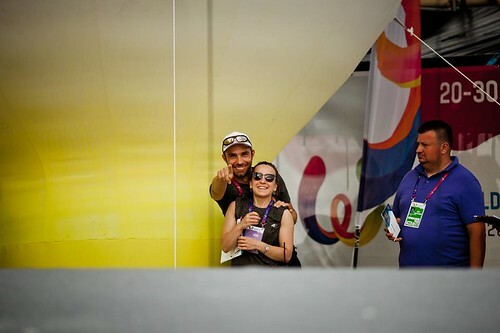 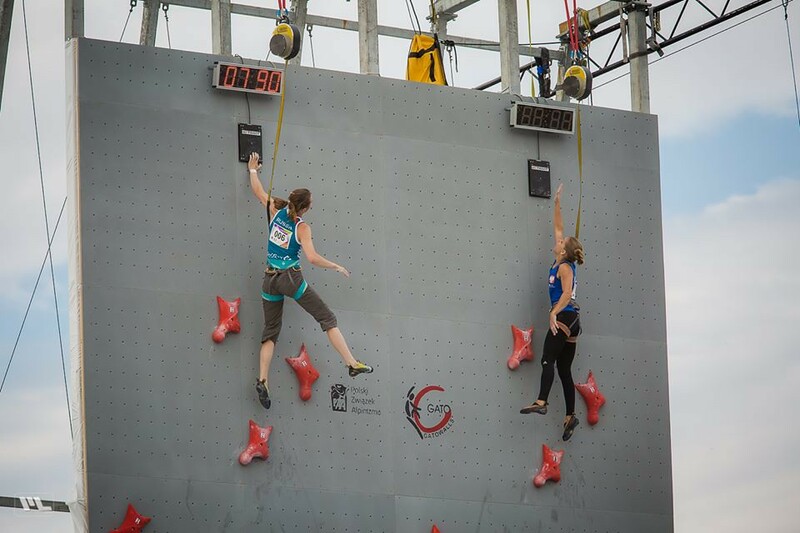 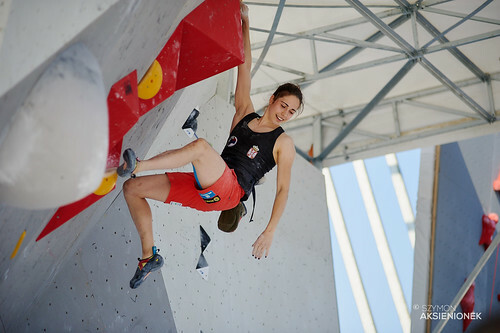 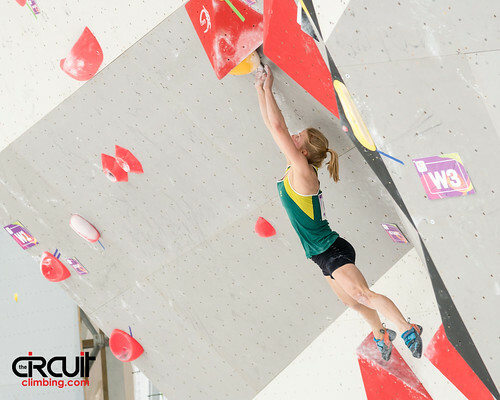 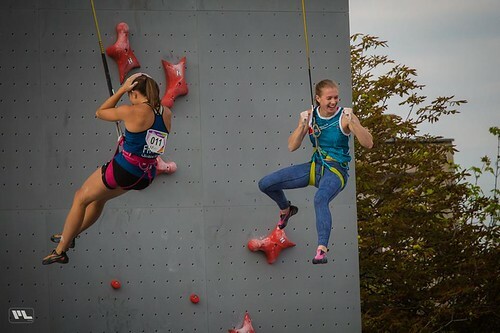 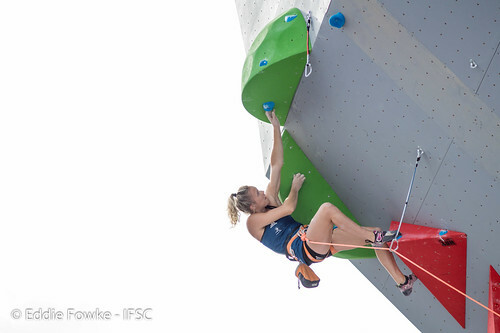 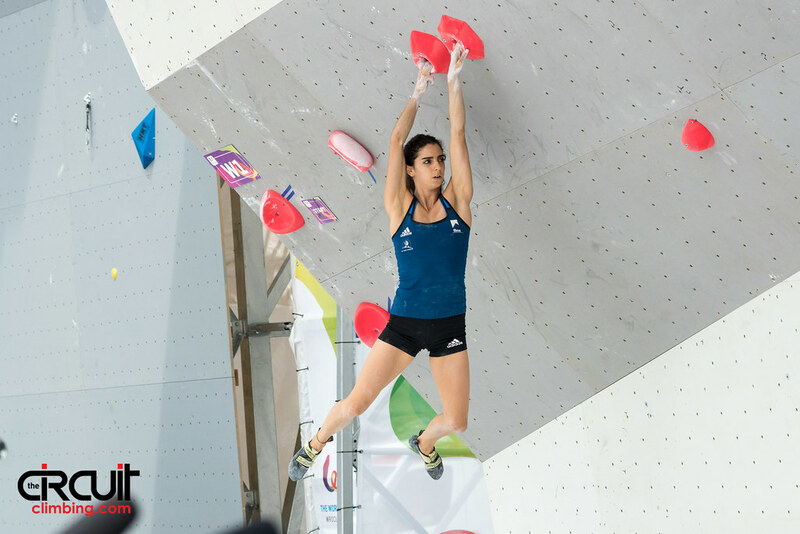 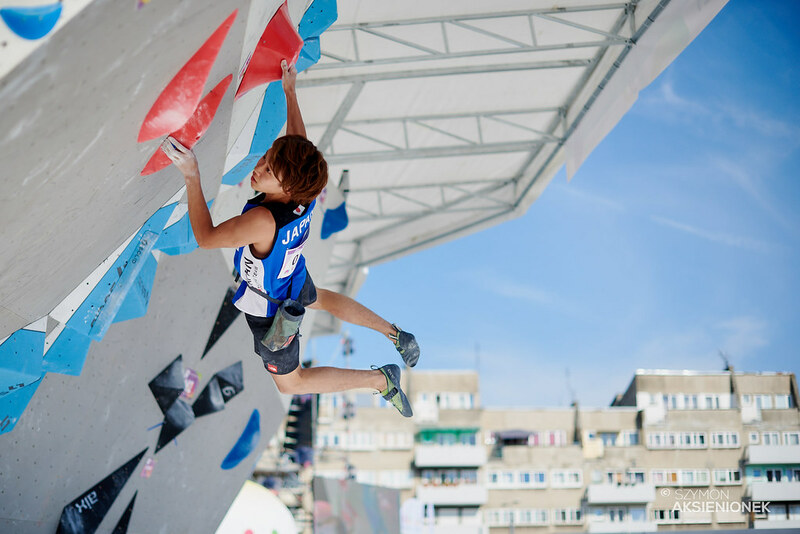 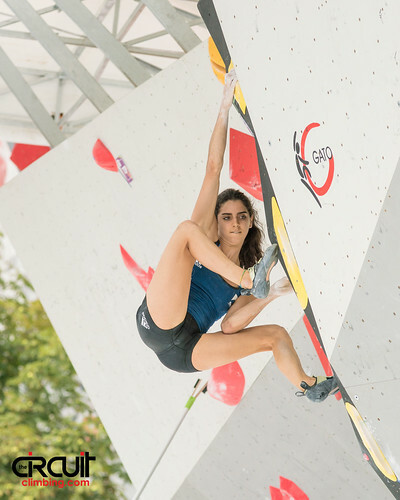 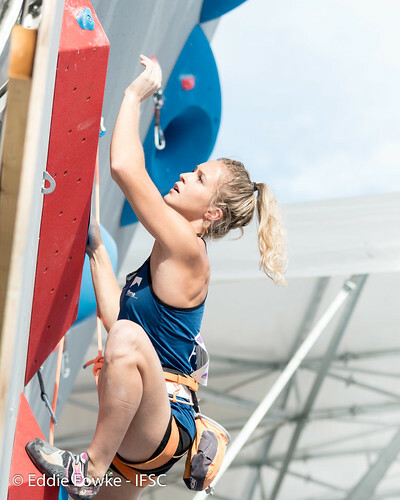 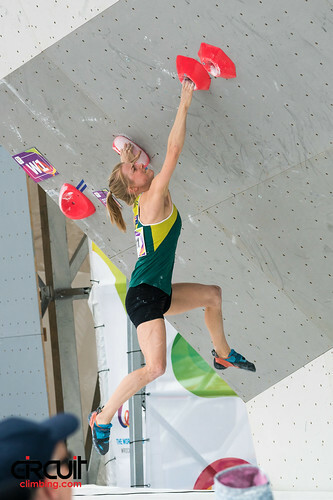 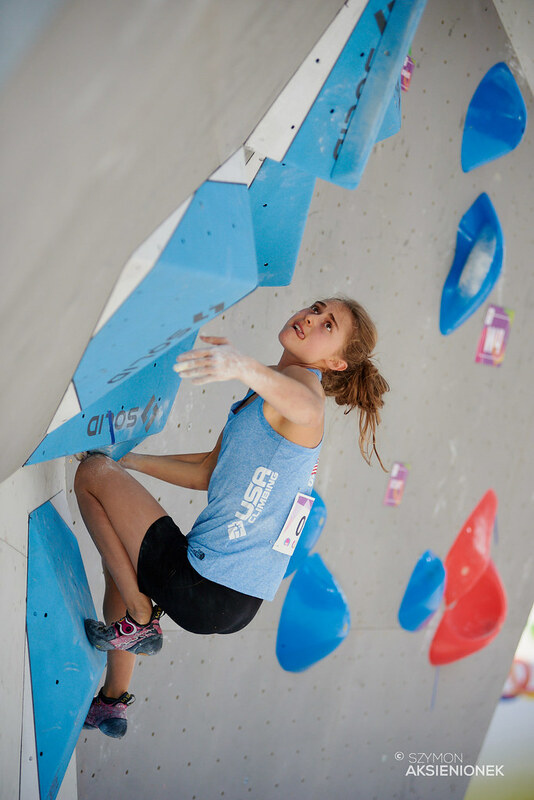 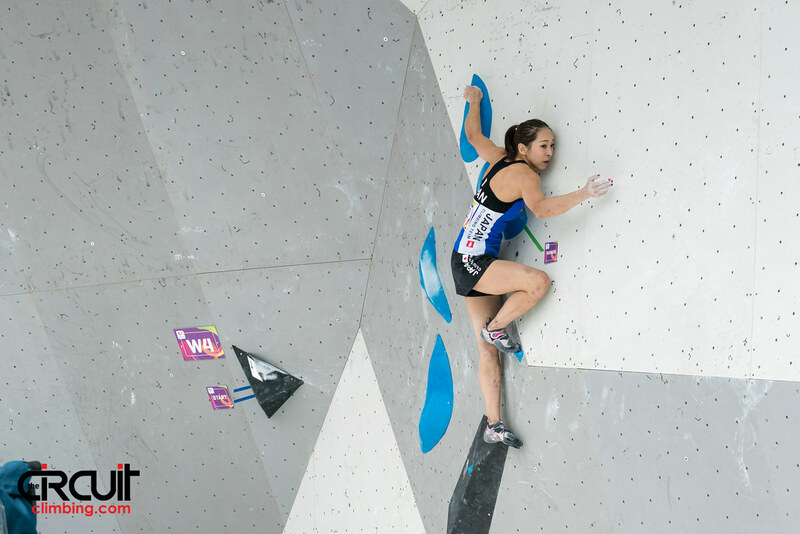 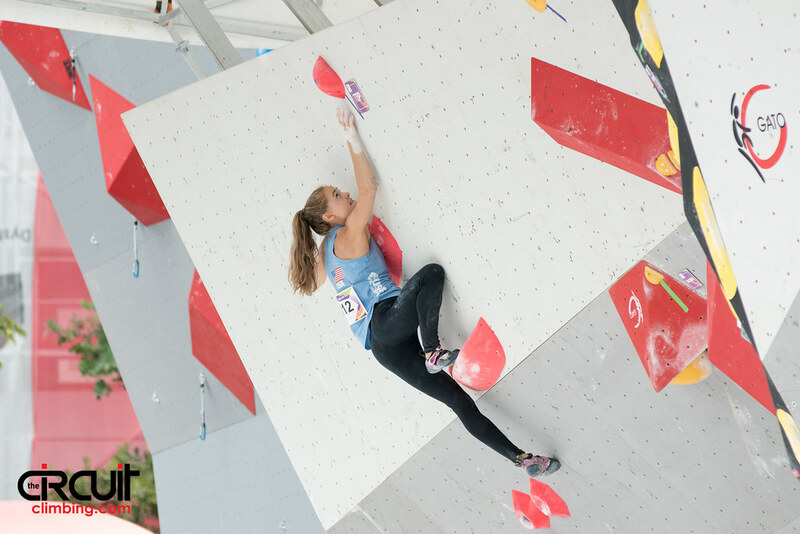 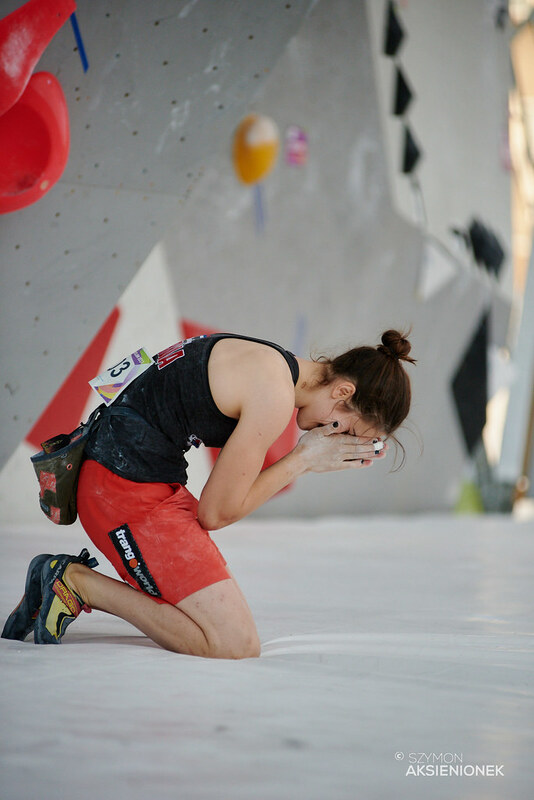 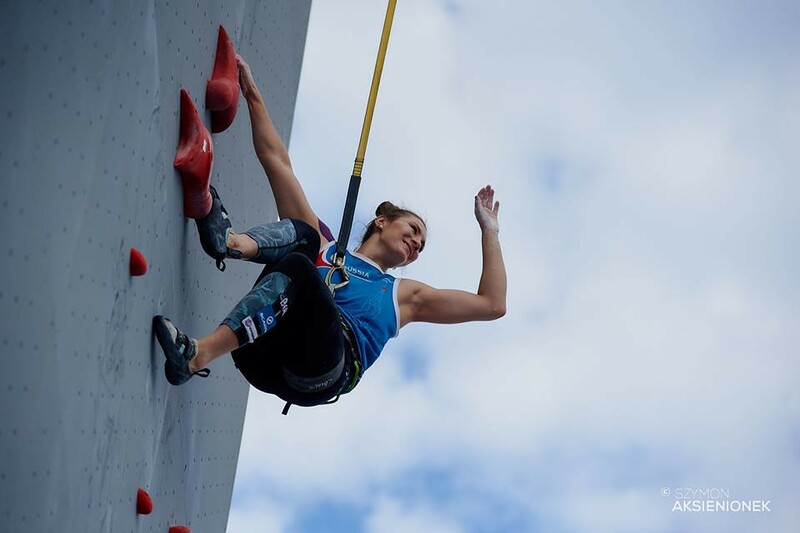 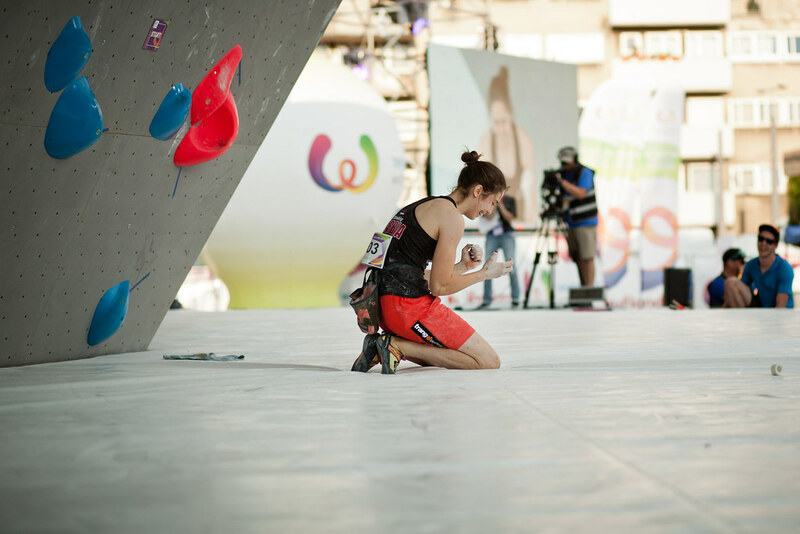 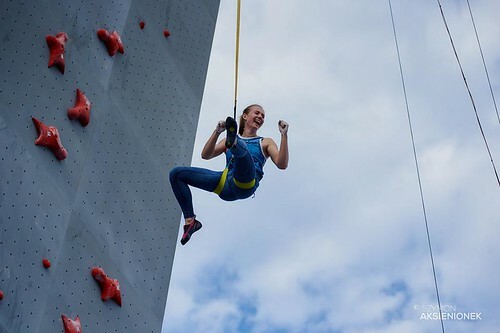 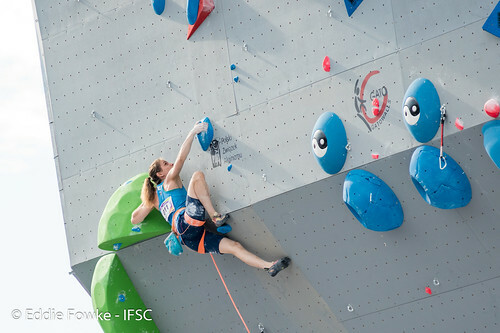 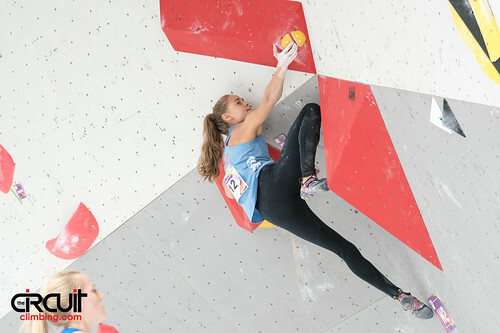 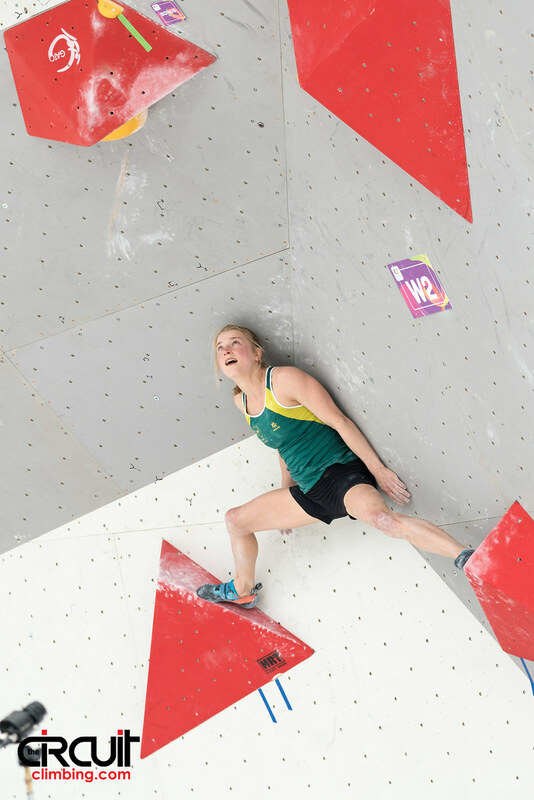 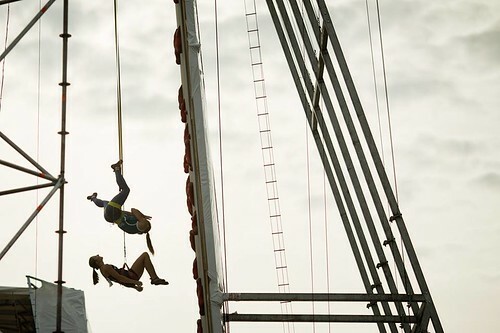 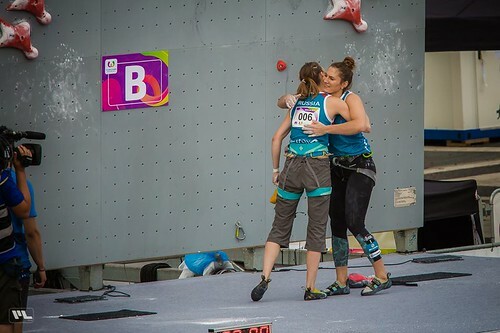 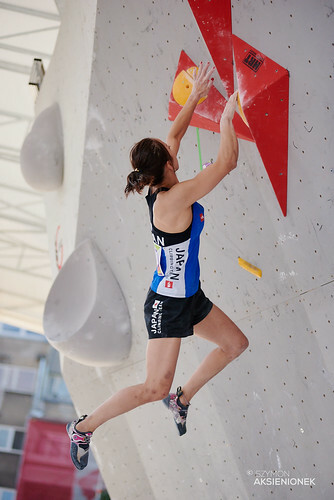 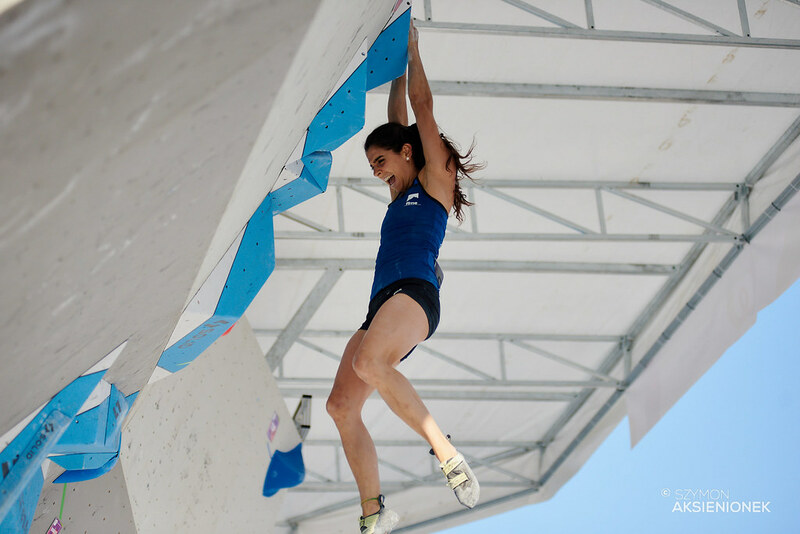 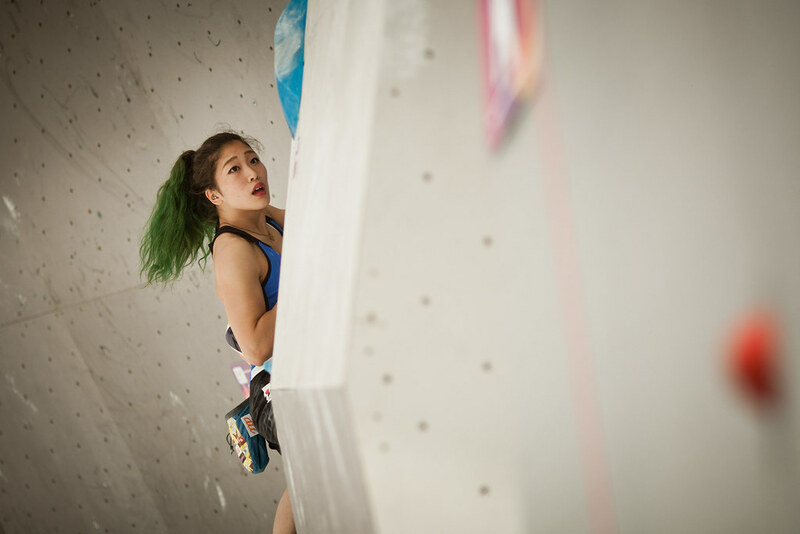 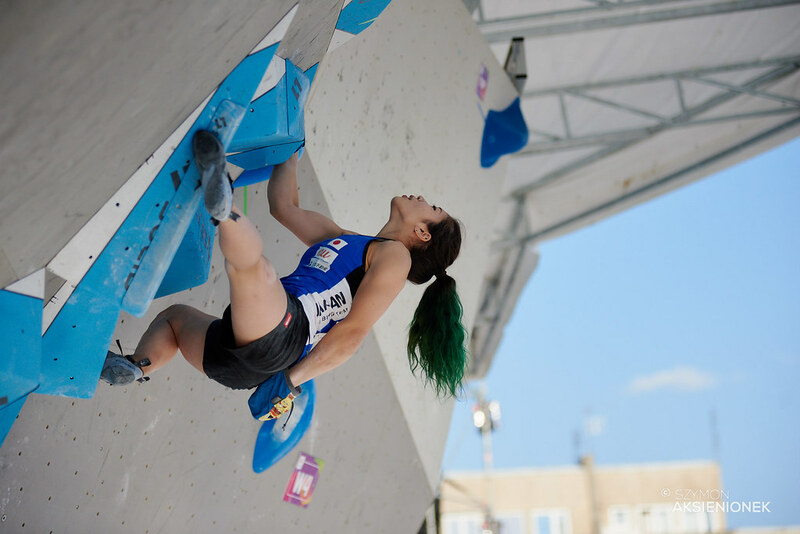 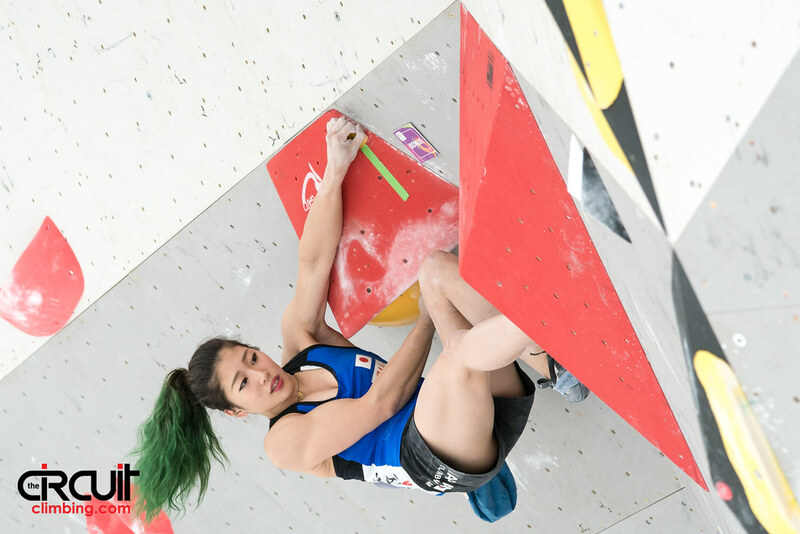 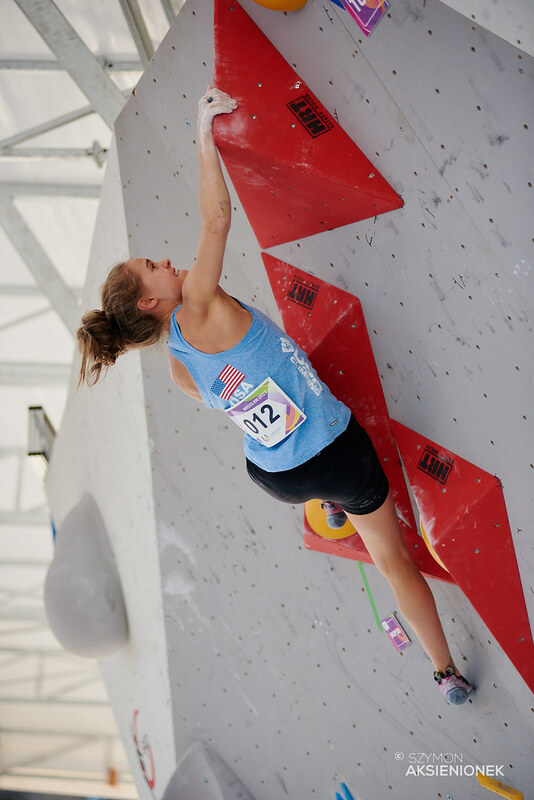 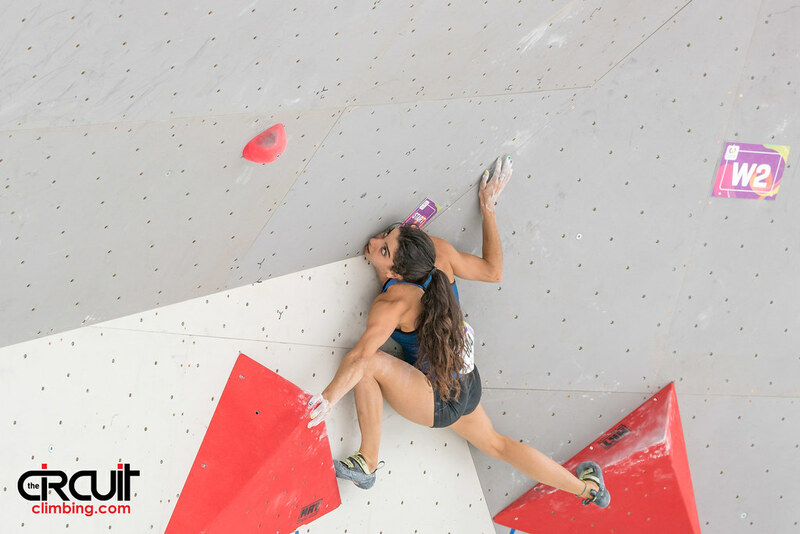 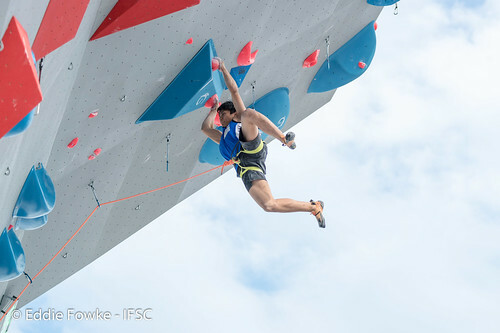 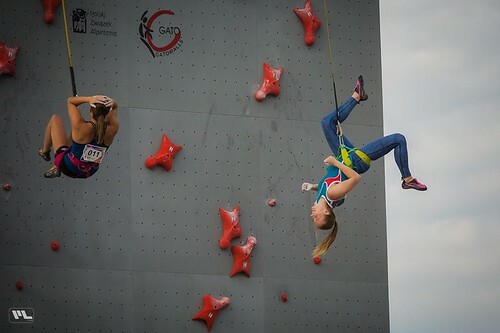 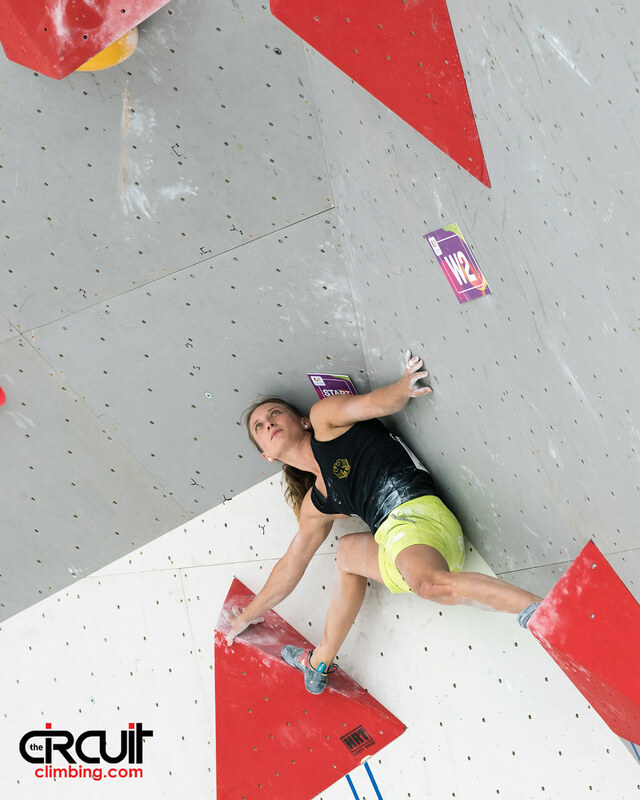 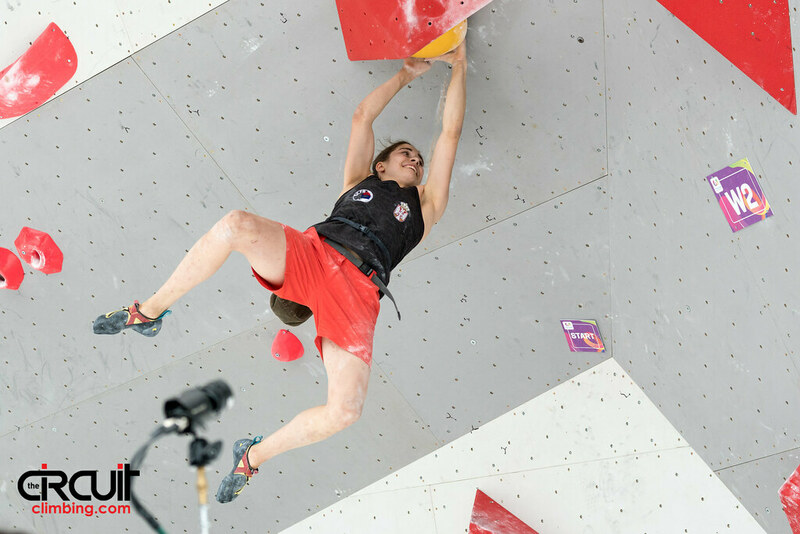 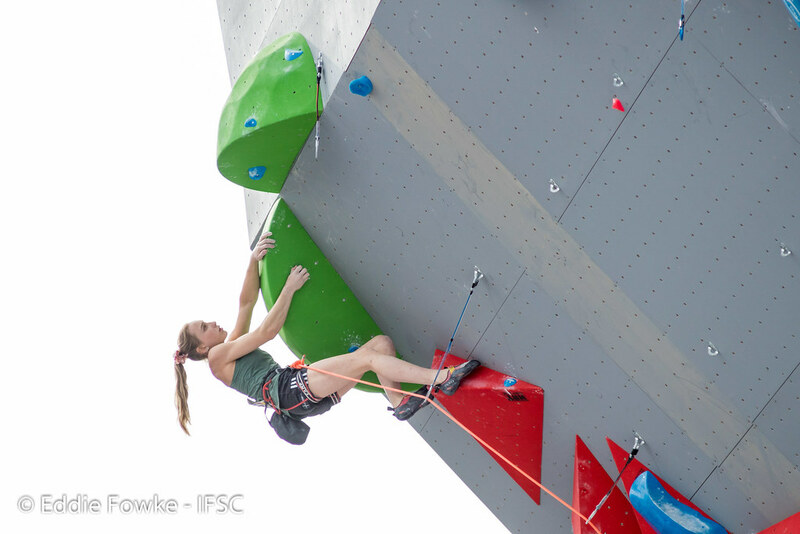 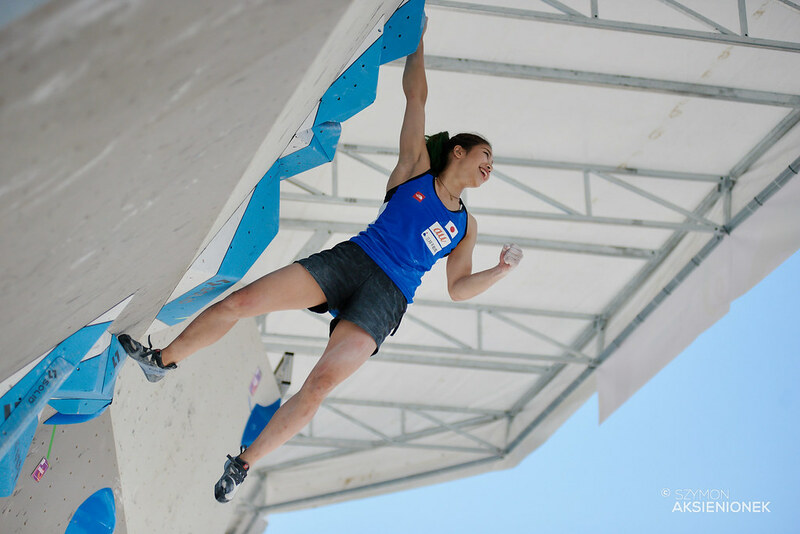 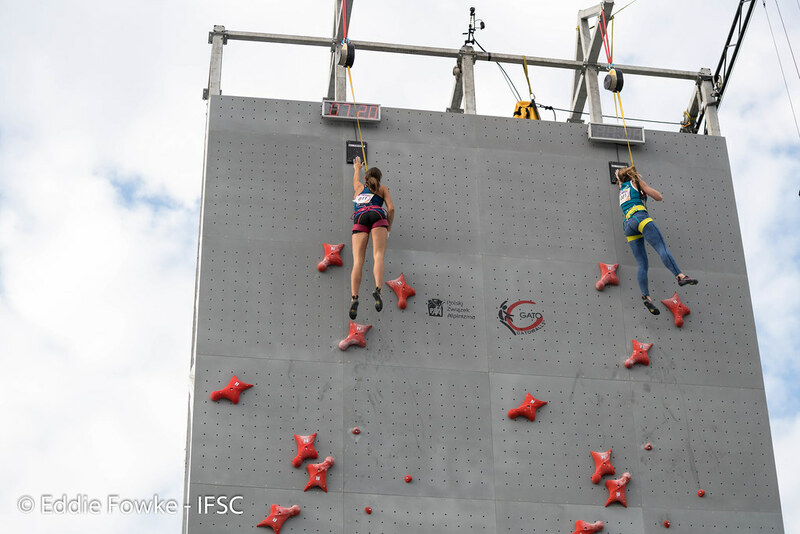 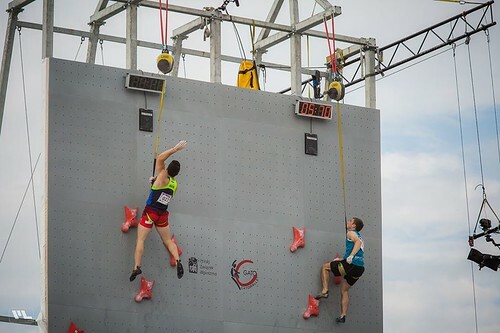 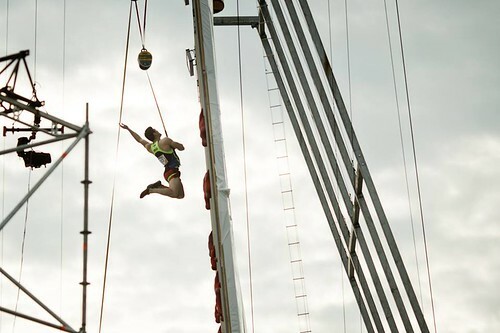 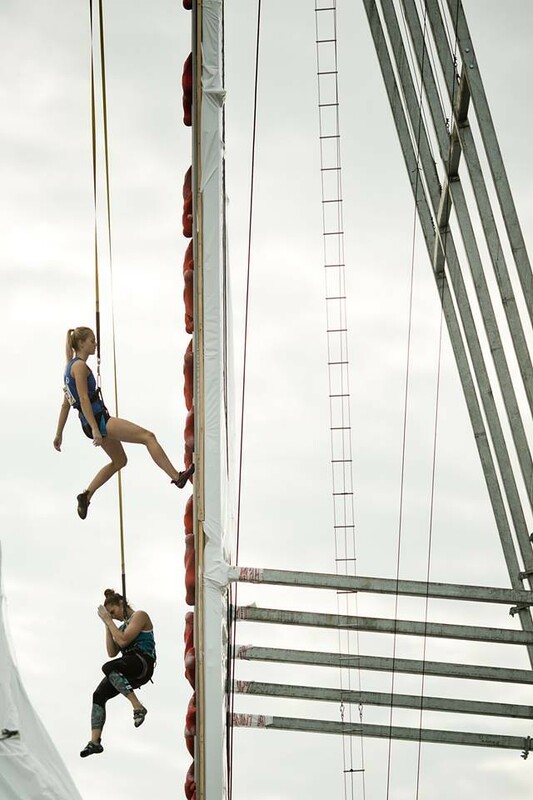 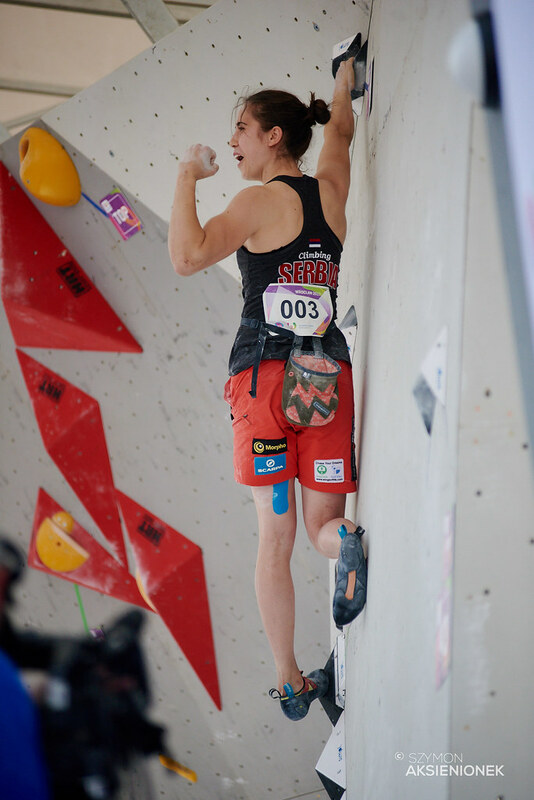 She erased her own mark at the first IFSC World Cup of the Speed season in Chongqing, then made it two records in one week at IFSC World Cup Nanjing. 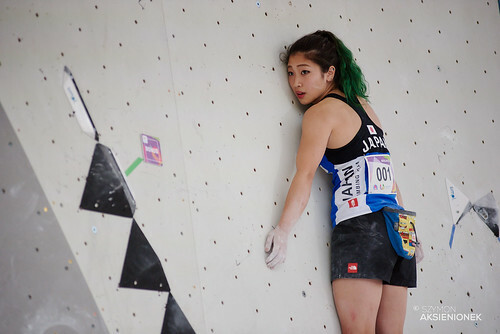 Now, she dropped the mark again when it mattered most. Racing against 2016 and 2017 rival Anouck Jaubert of France in the final match, both athletes put together flawless ascents. 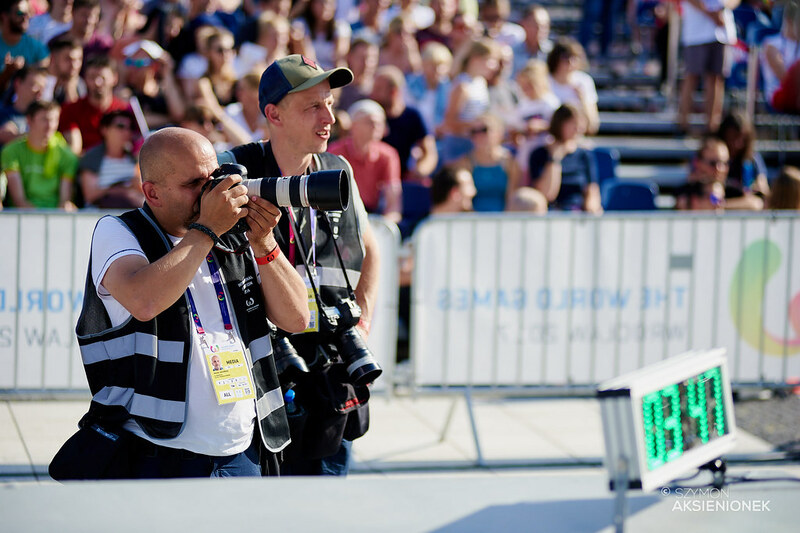 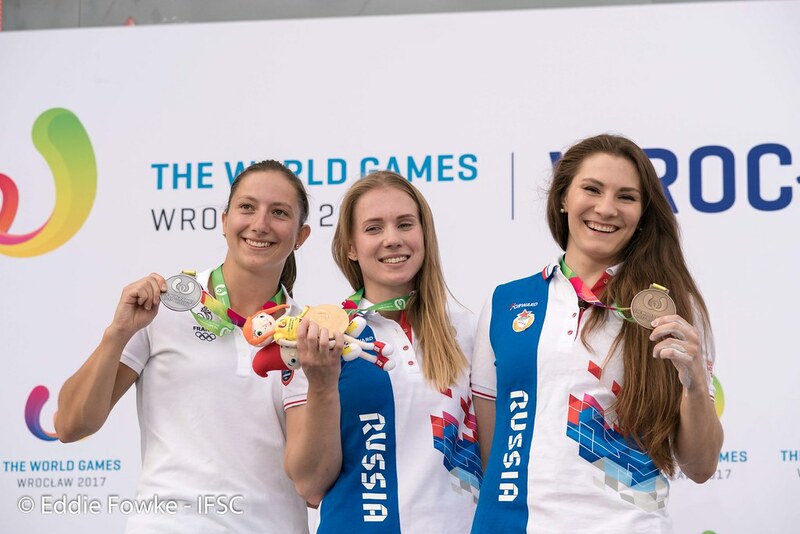 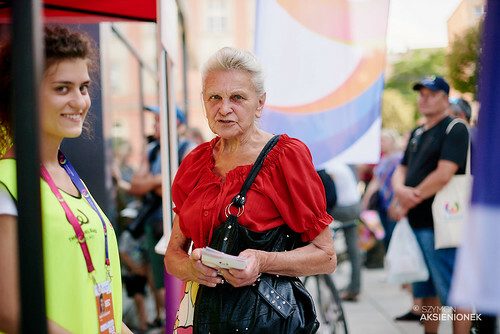 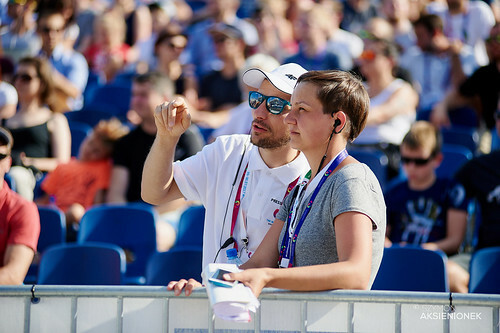 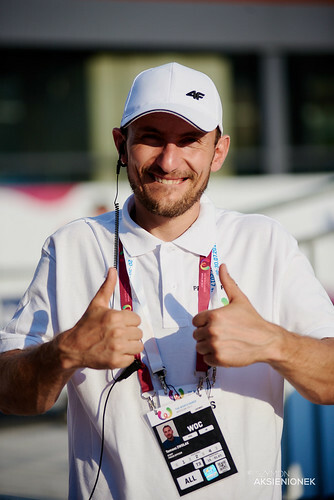 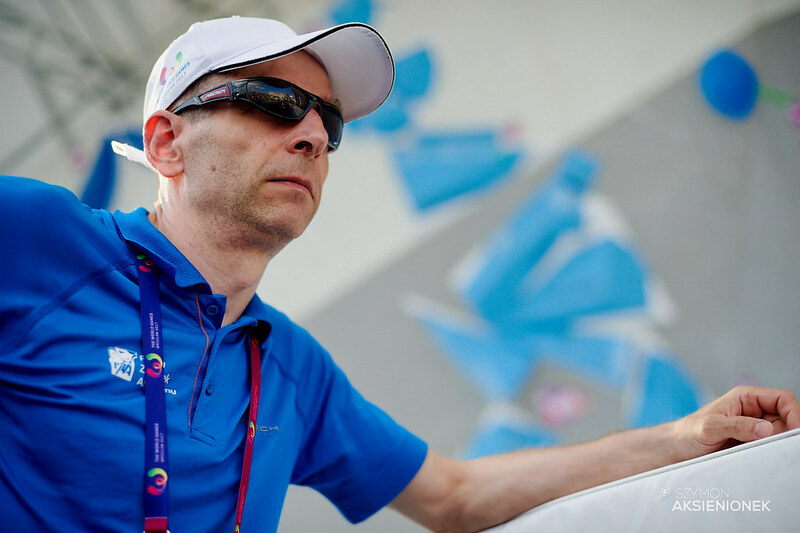 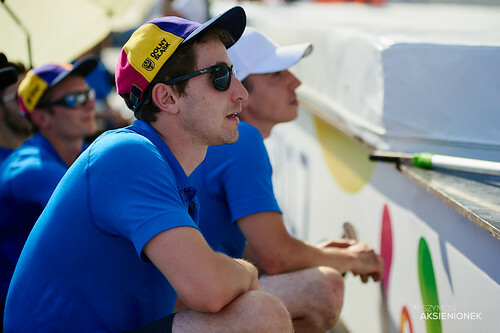 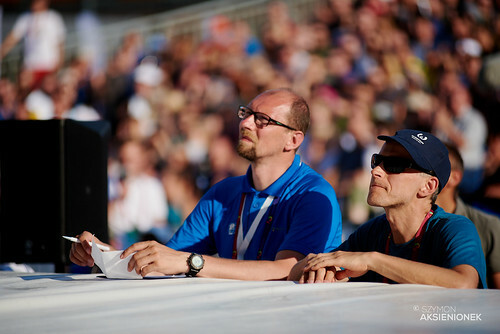 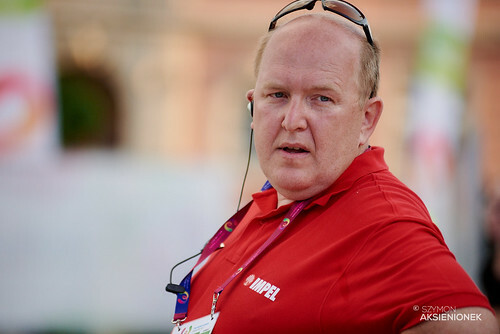 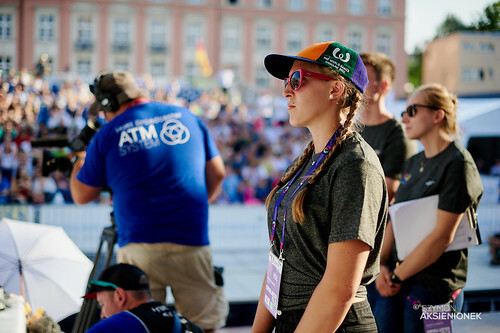 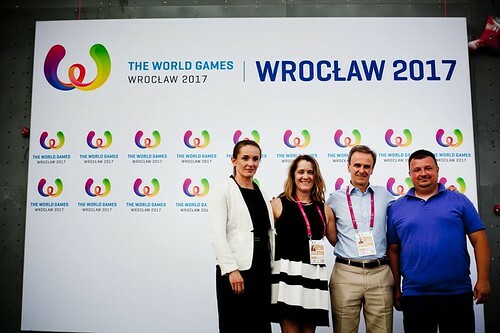 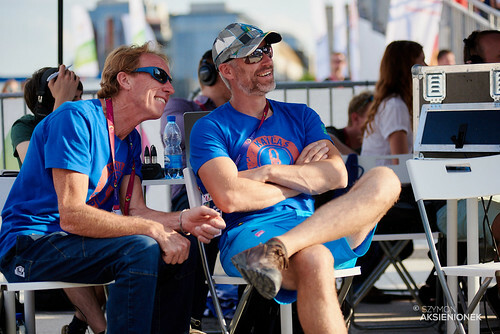 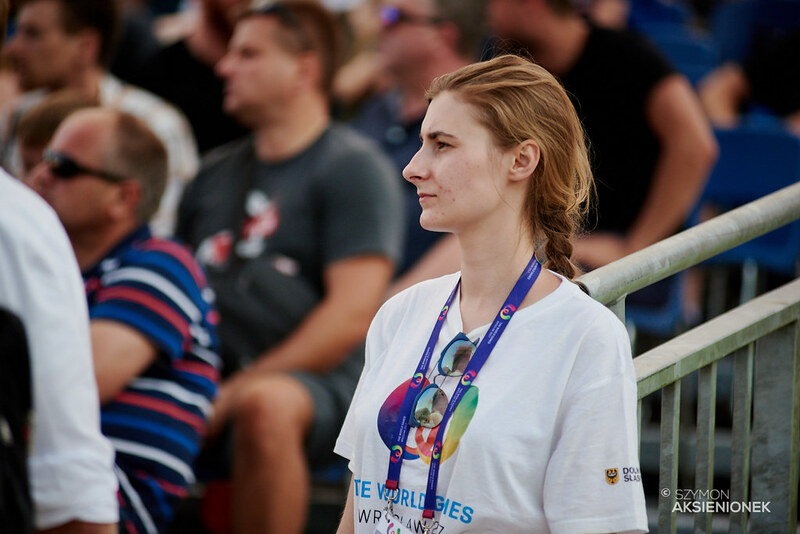 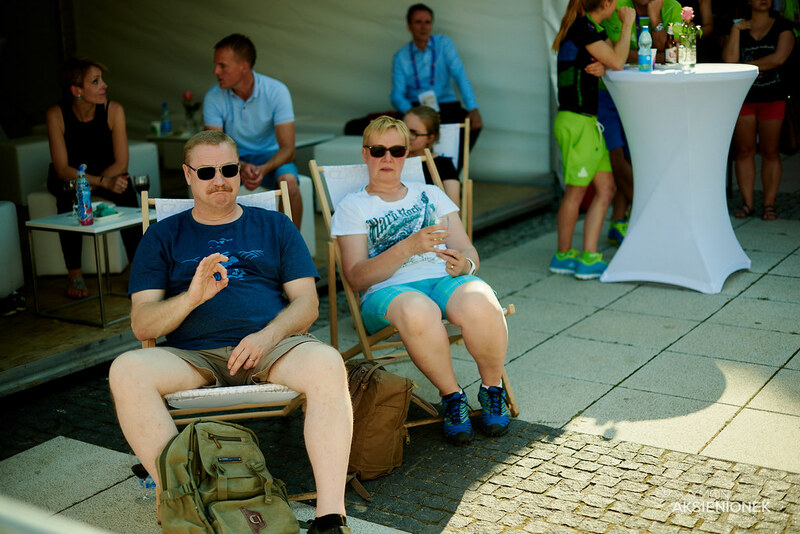 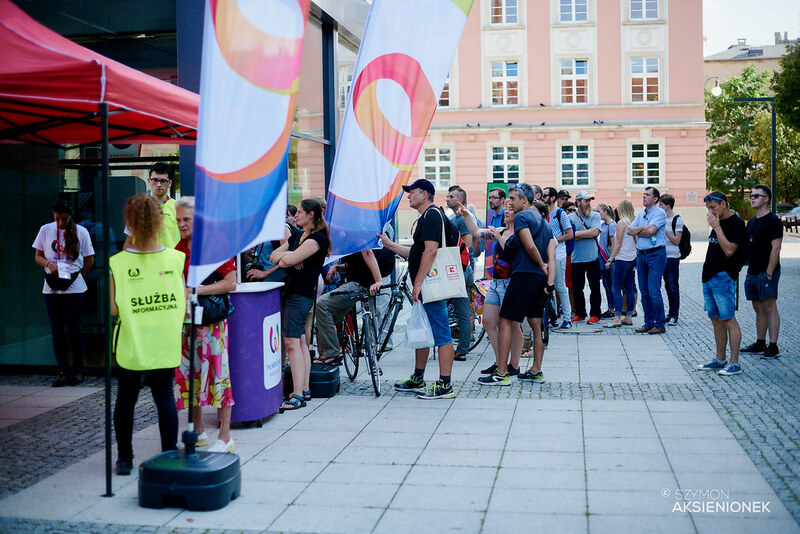 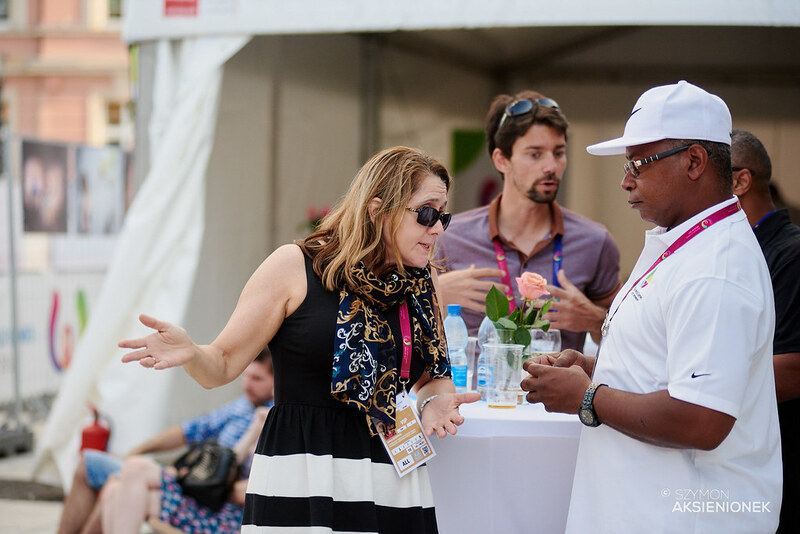 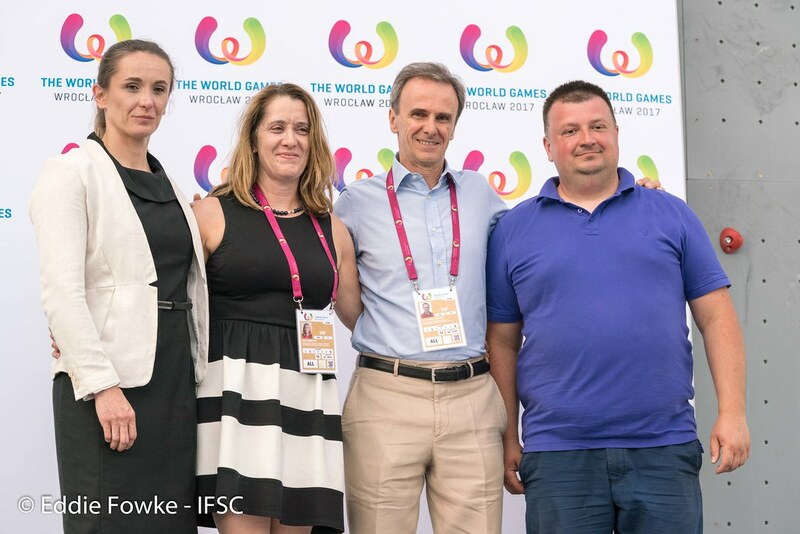 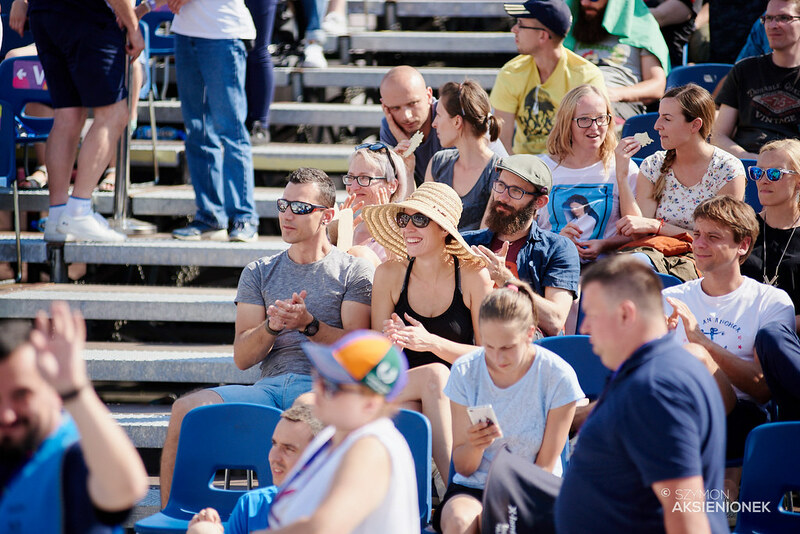 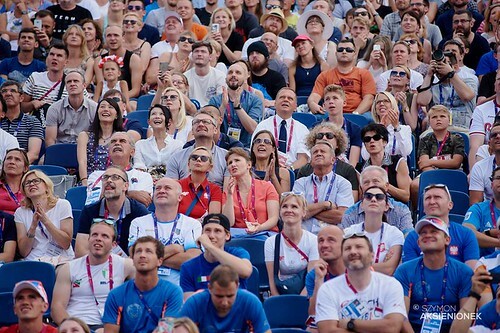 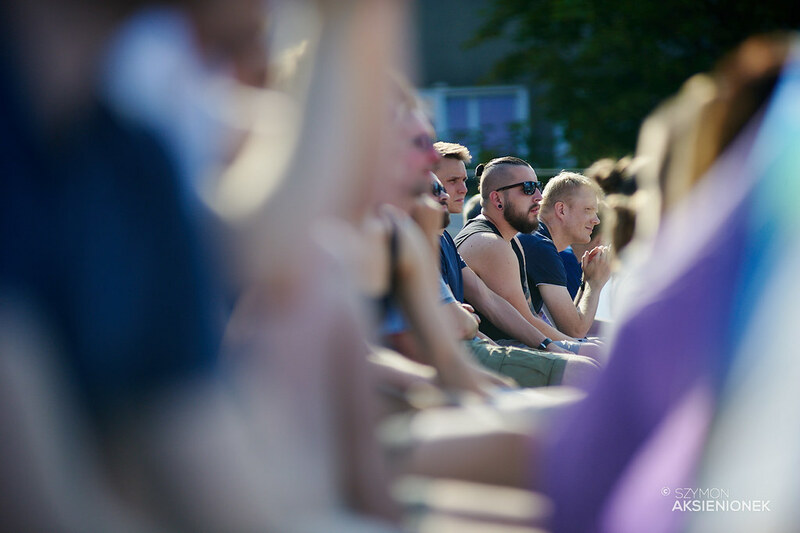 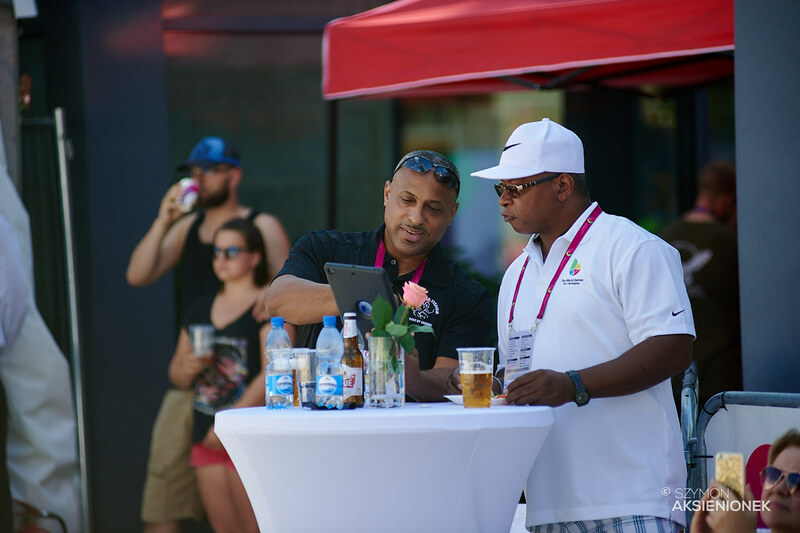 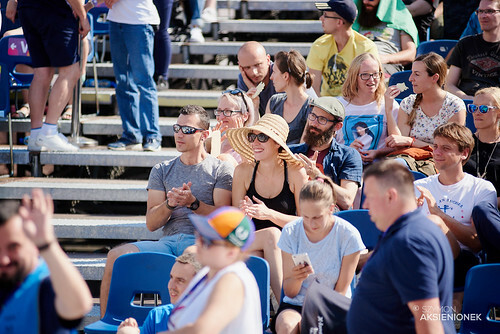 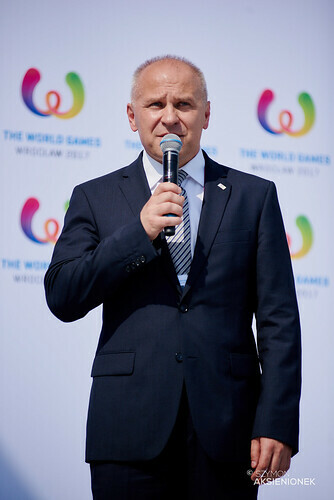 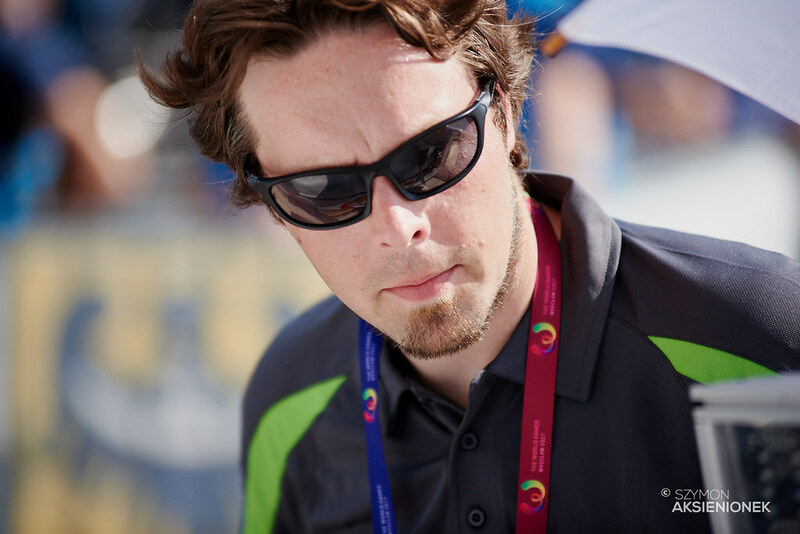 Jaubert was quick all day and approached the previous world record of 7.38 seconds (7.42), but Kaplina won Gold by setting the new women’s Speed world record of 7.32 seconds. 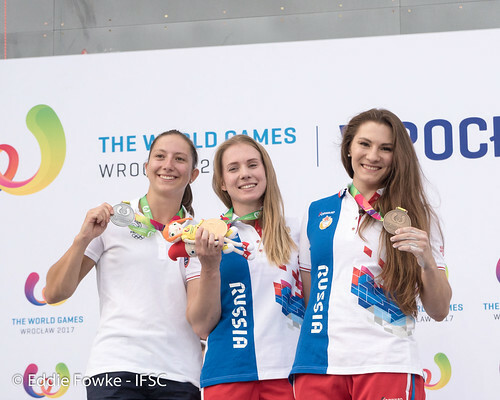 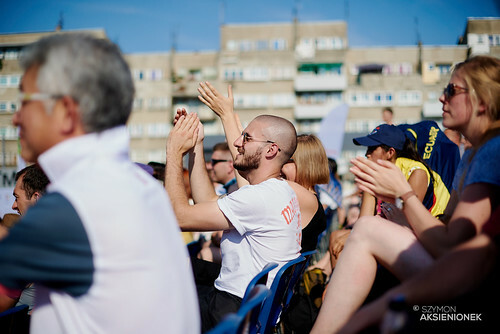 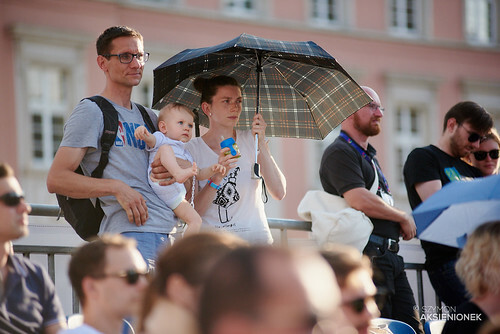 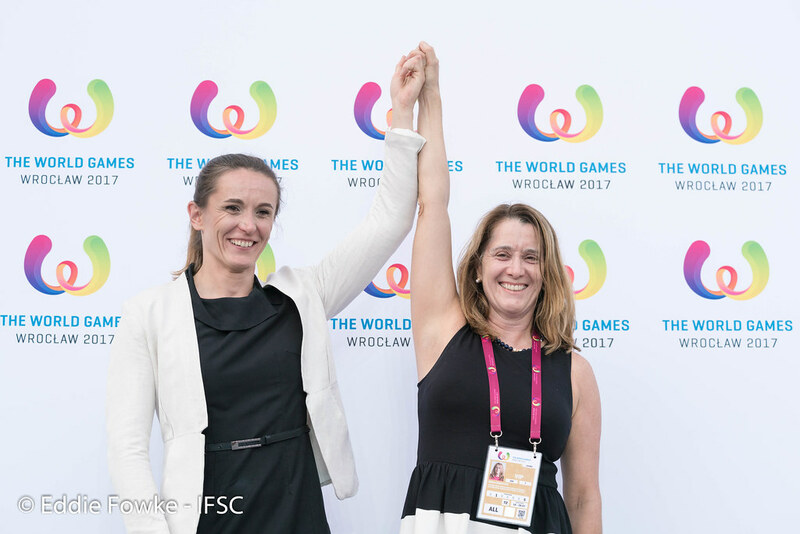 In the small final, Anna Tsyganova earned the last spot on the podium by besting Russian teammate and former season champion Mariia Krasavina. 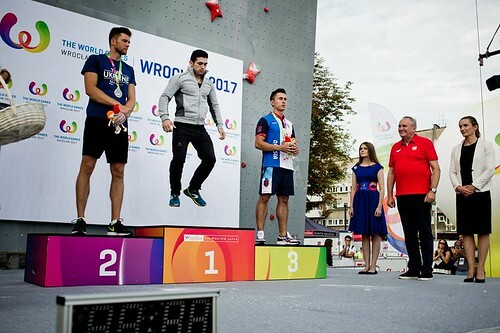 Reza Alipourshenazandifar has been one of the fastest Speed athletes at IFSC World Cup events in 2017. 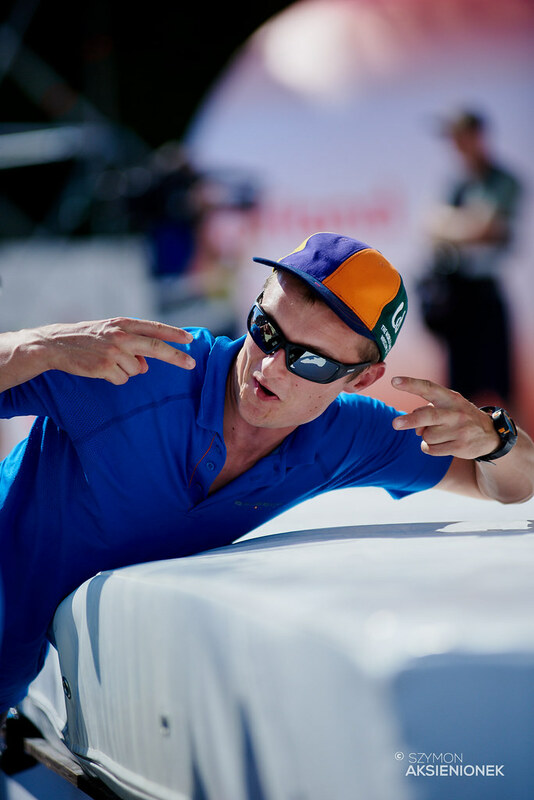 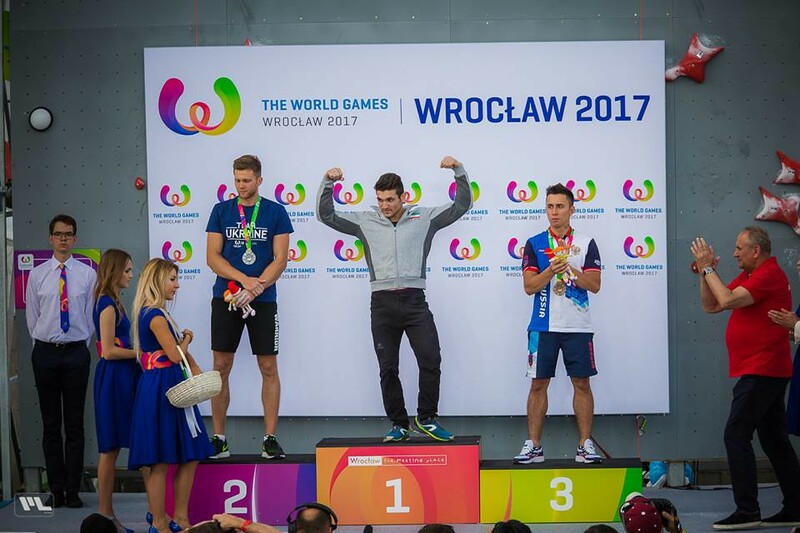 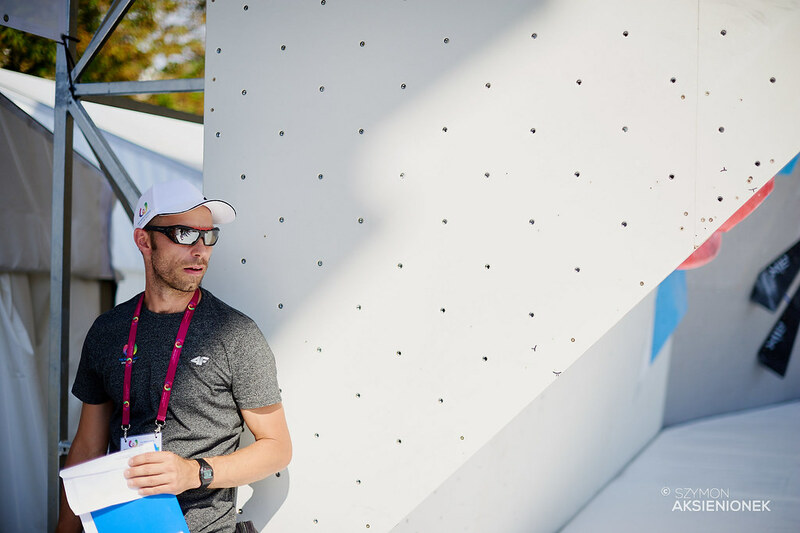 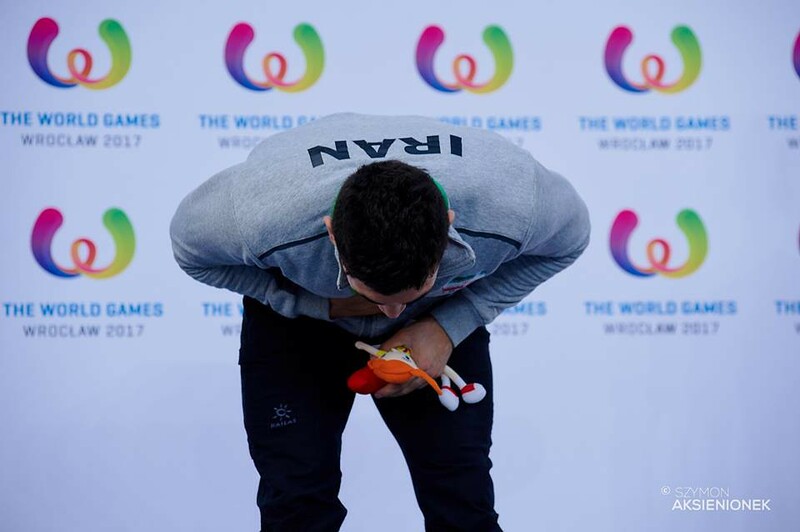 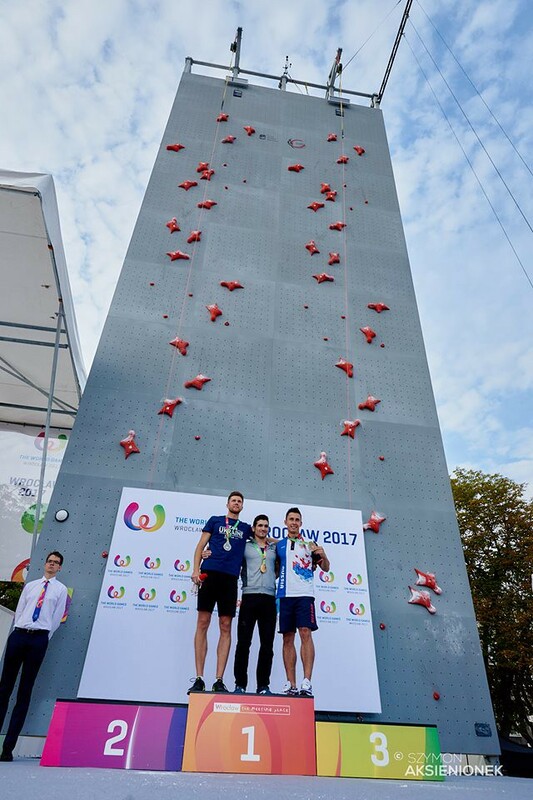 He set the latest men’s Speed world record at Nanjing (5.48), and the leader of the IFSC World Cup rankings was again a top performer. 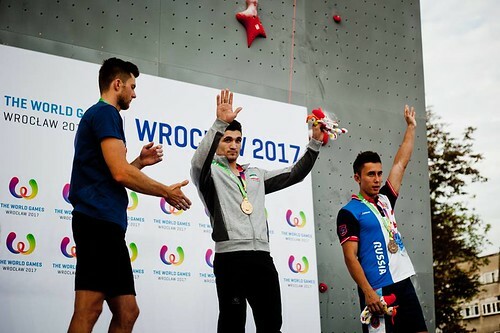 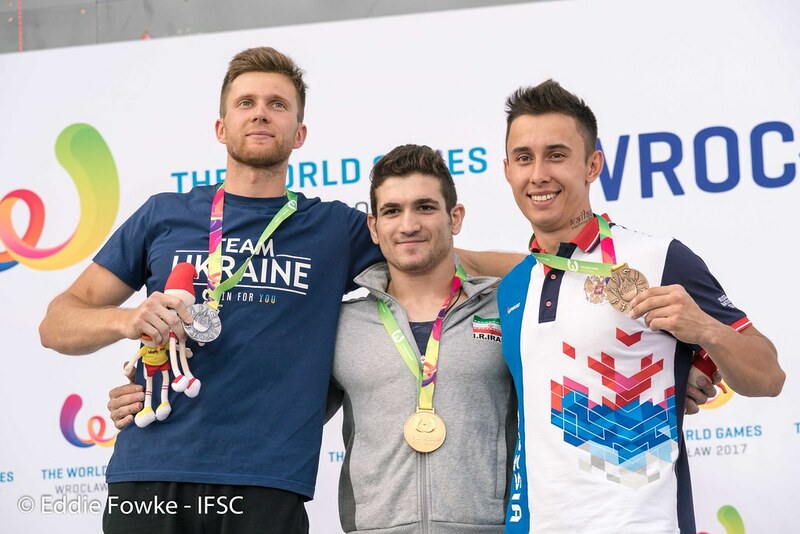 The Iranian registered no times above 5.80 seconds, and he won the first Gold medal for his home country at The World Games. 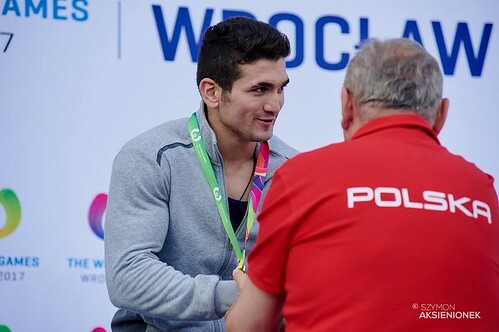 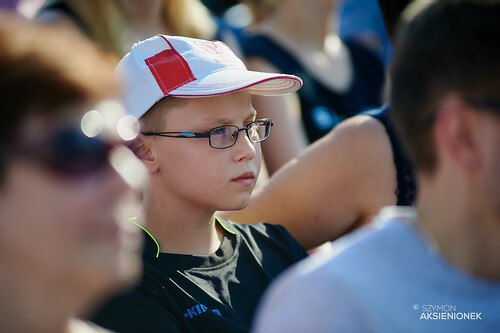 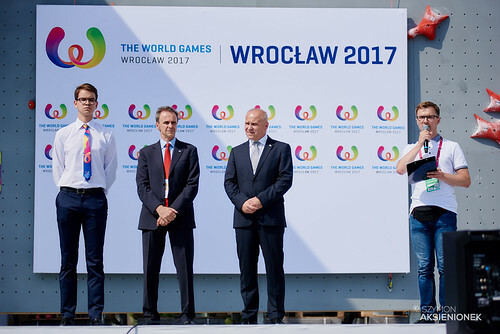 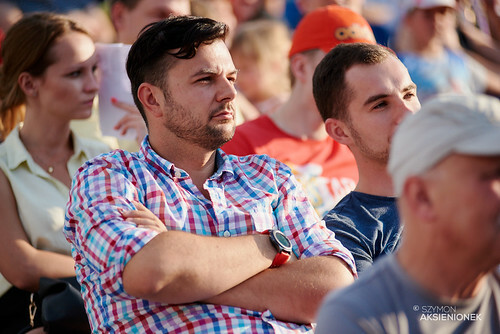 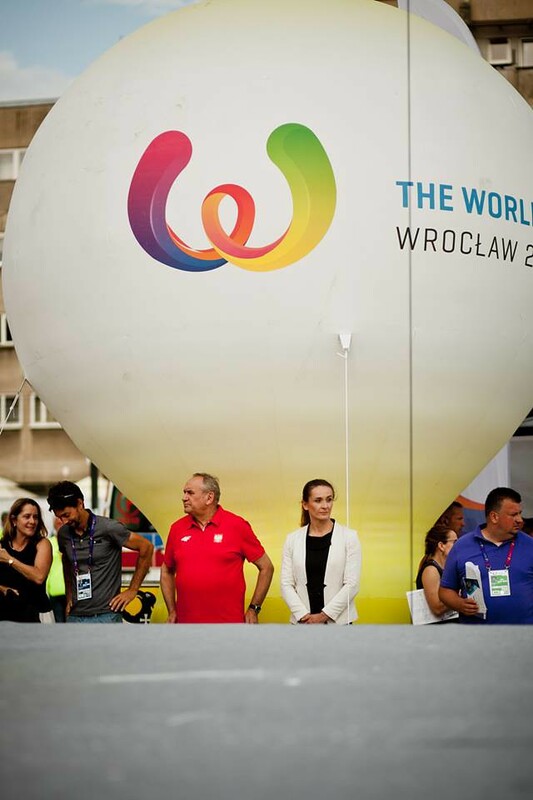 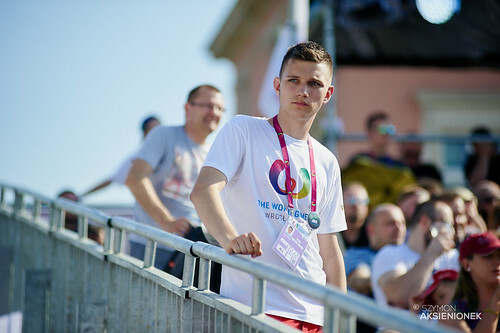 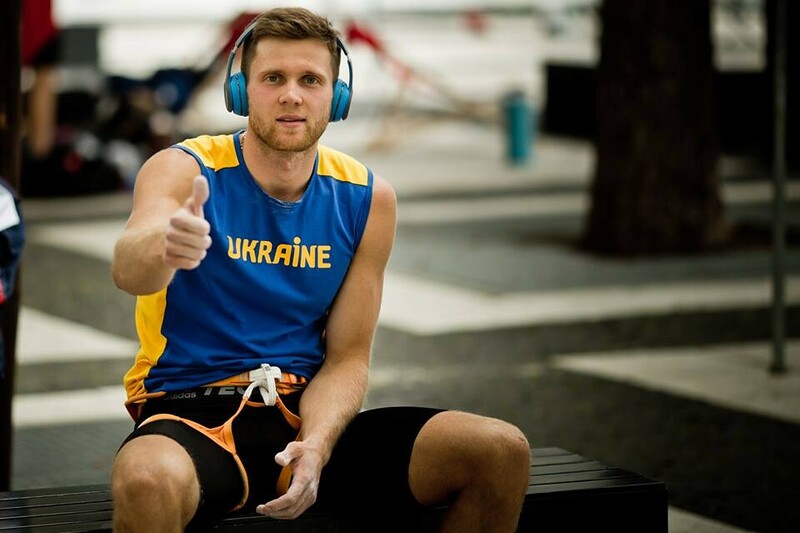 Ukranian Danyil Boldyrev was also fast in Wroclaw and placed second after a fall in the last match. 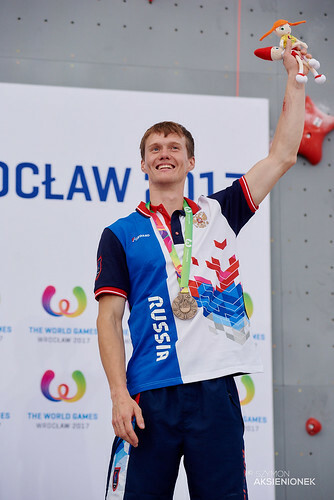 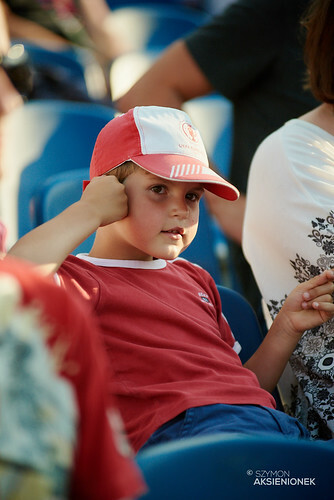 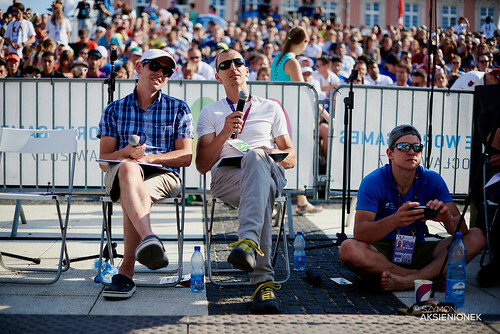 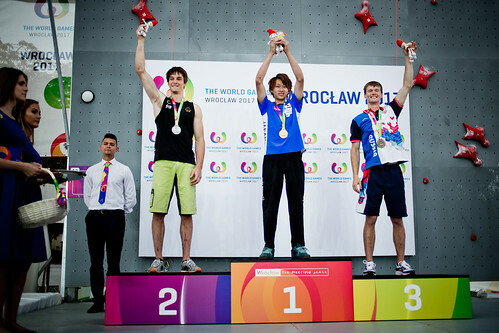 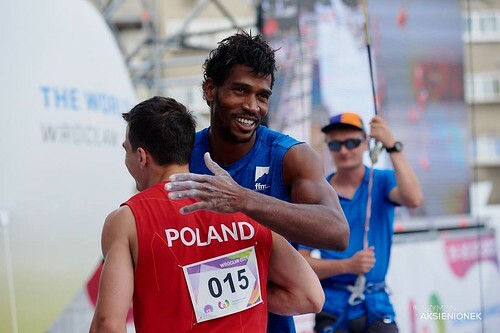 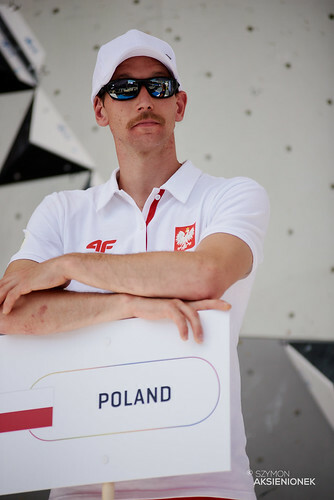 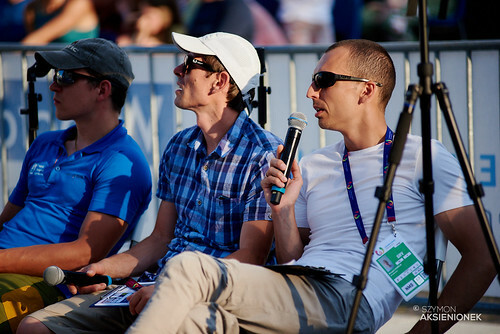 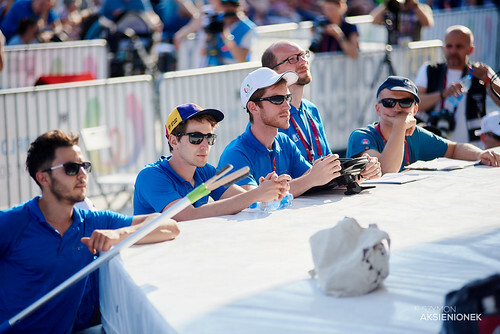 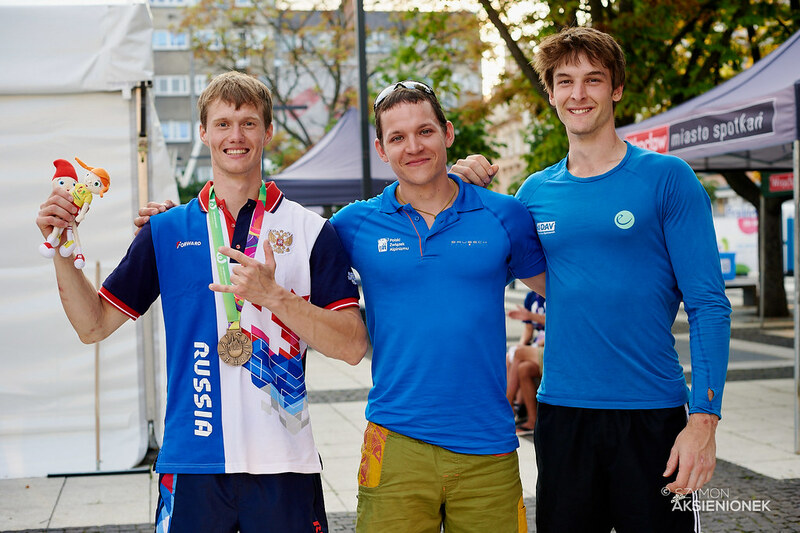 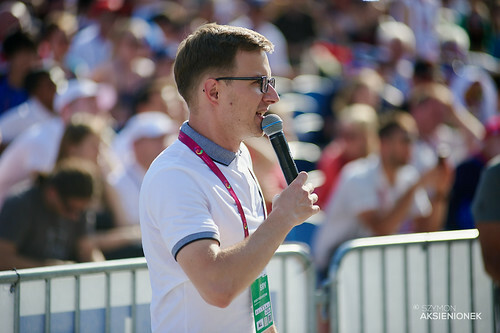 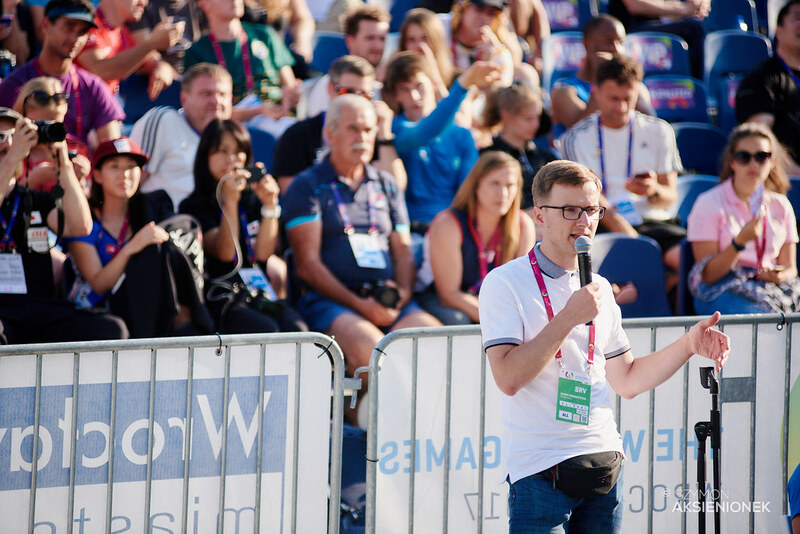 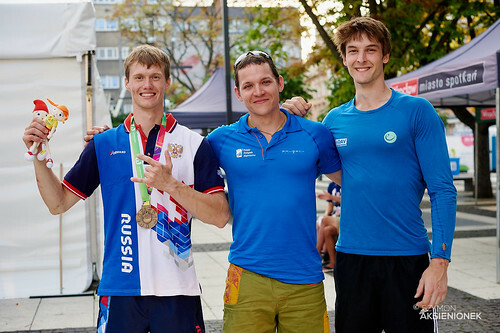 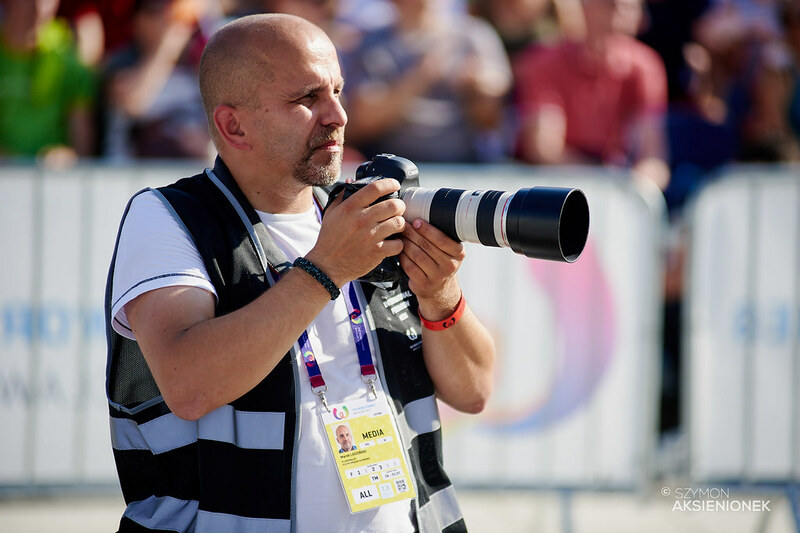 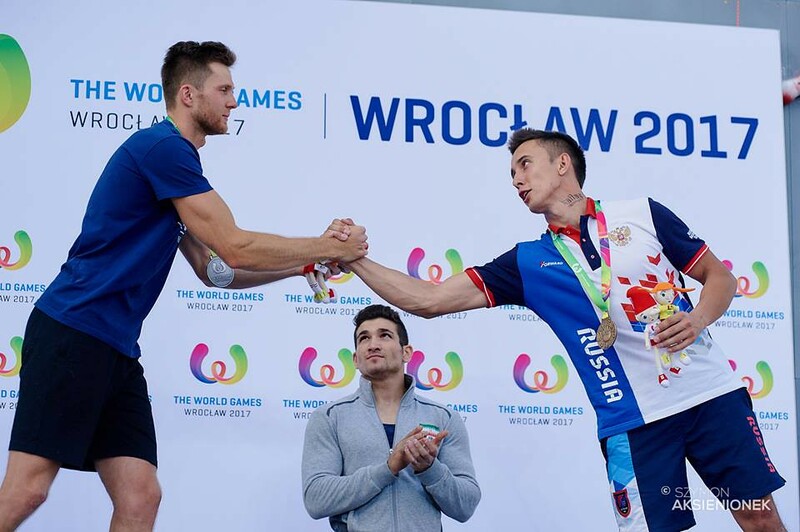 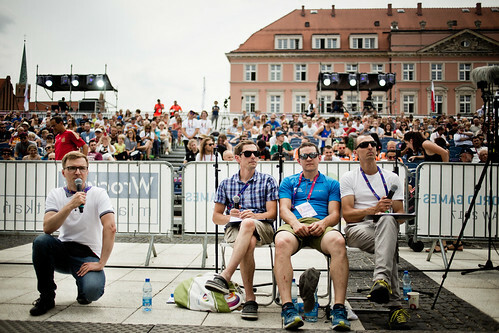 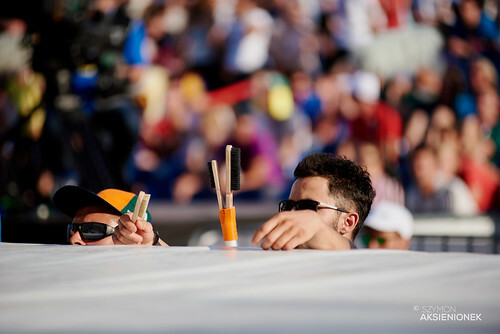 Stanislav Kokorin of Russia joined them on the podium, edging Marcin Dzienski in a close small final. 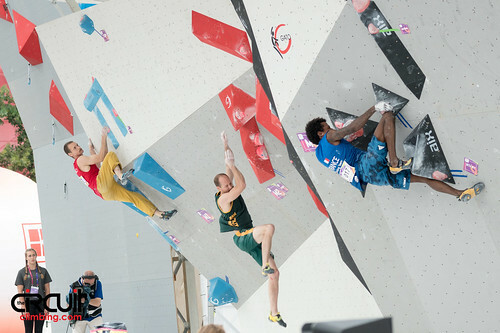 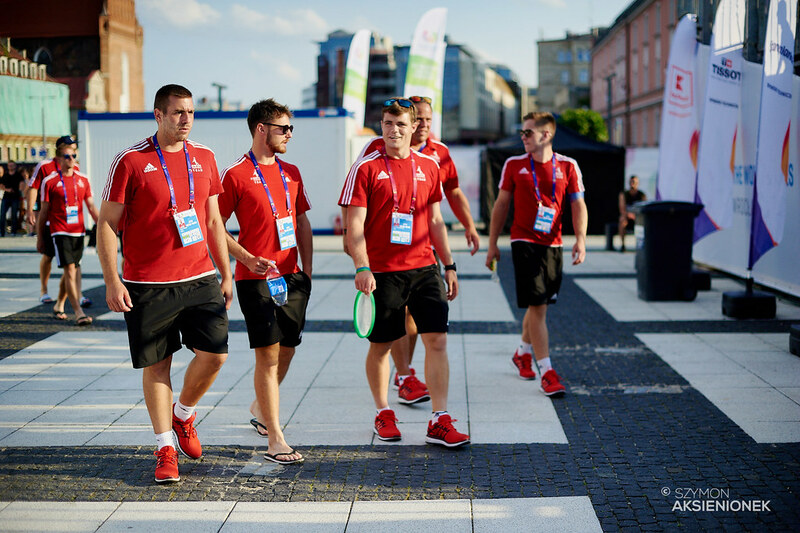 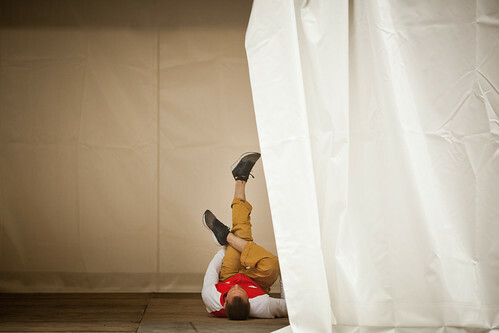 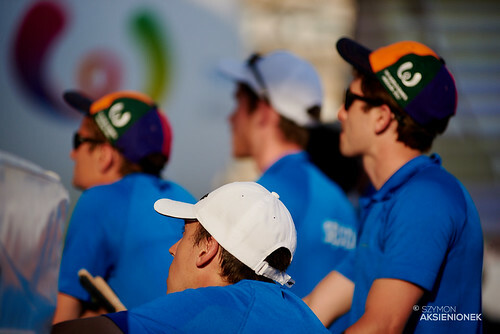 There were several early falls in Lead finals for the men, with most athletes falling near 22 moves. Yuki Hada of Japan was one of the athletes who broke the barrier, setting the high point at 39+. 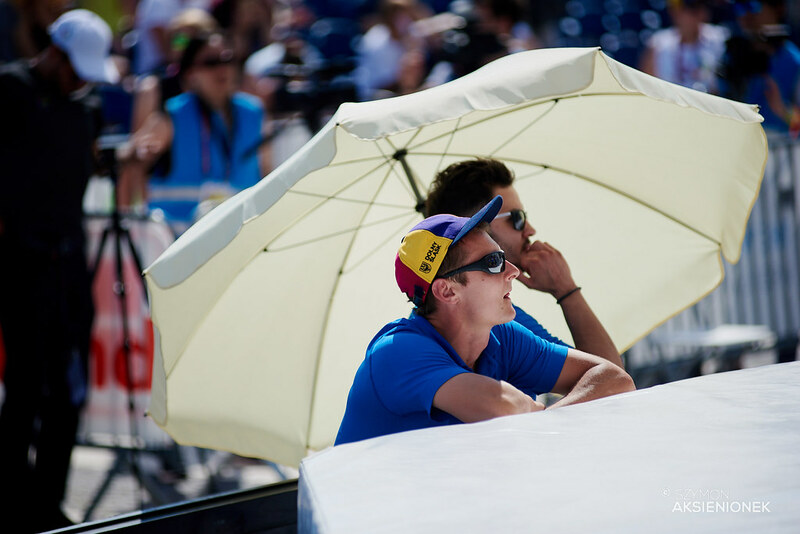 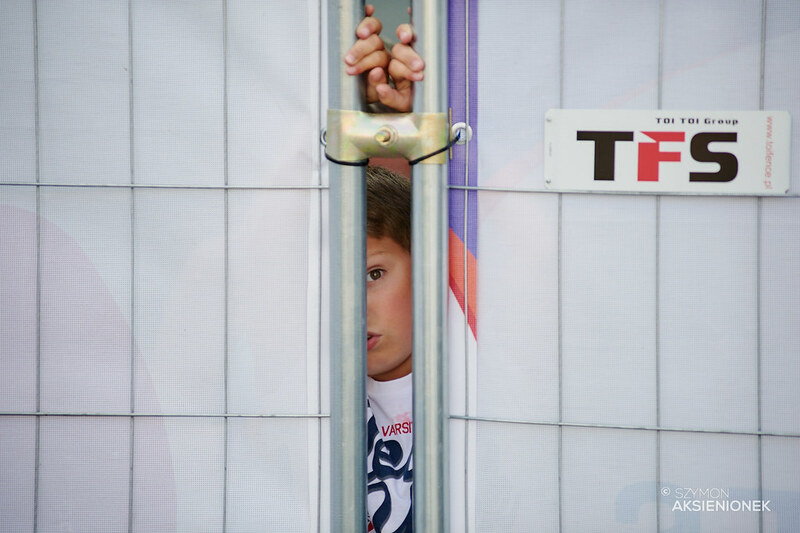 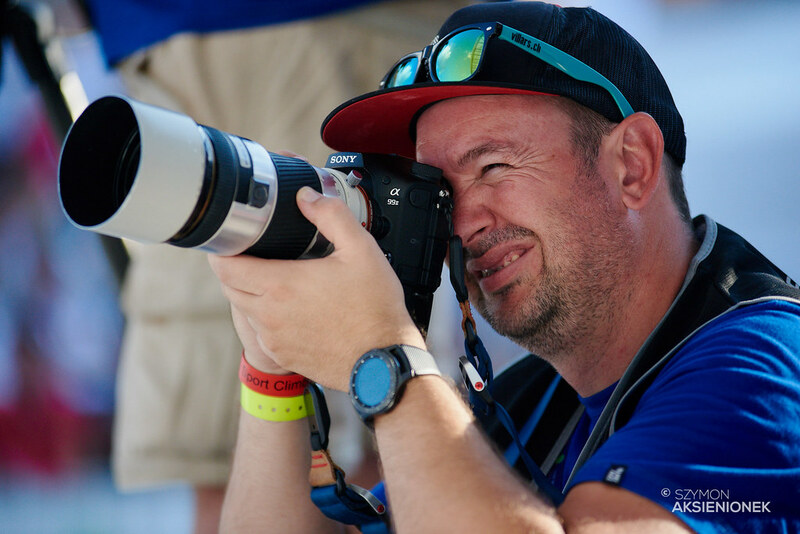 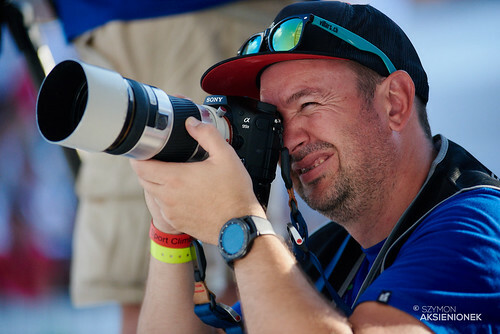 His teammate Keiichiro Korenaga followed in kind, leaving only Romain Desgranges left to climb. The Frenchman also fell on the 23rd move, crowning Korenaga the victor on countback to qualifications earlier in the day when he climbed two moves higher than Hada. 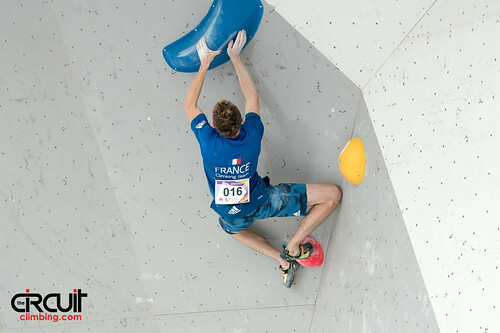 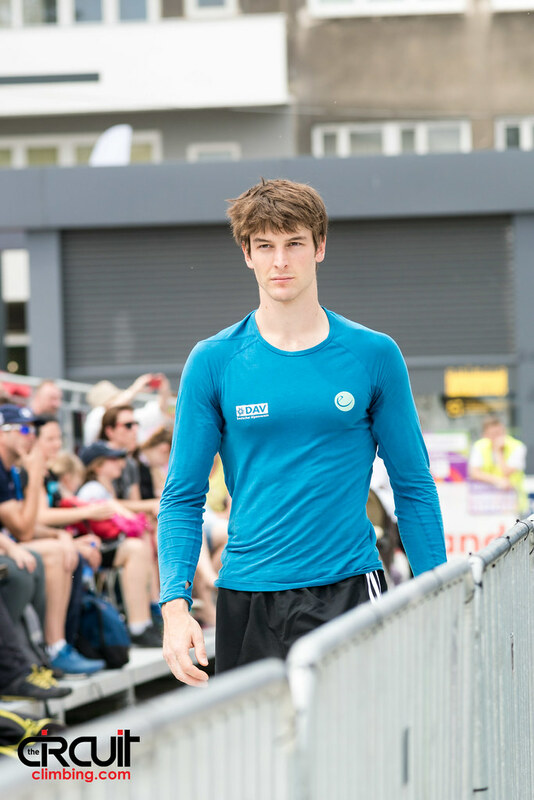 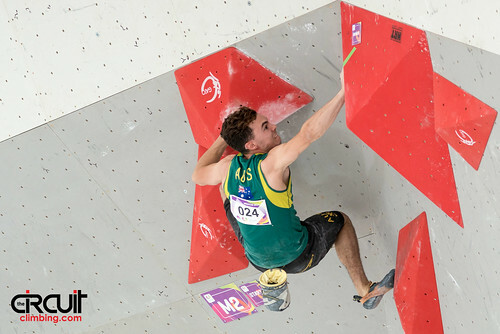 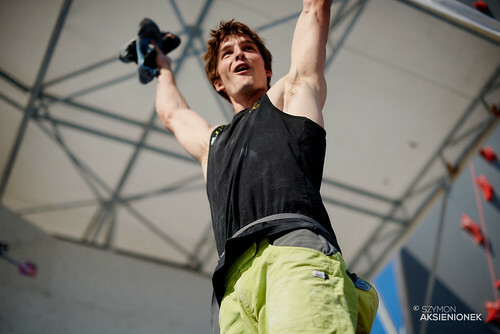 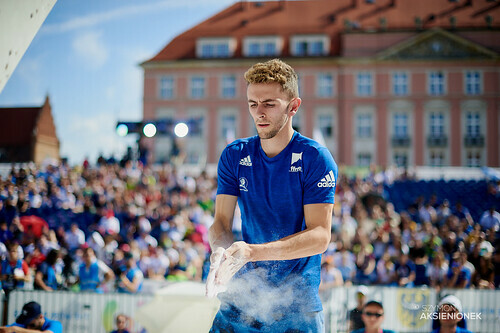 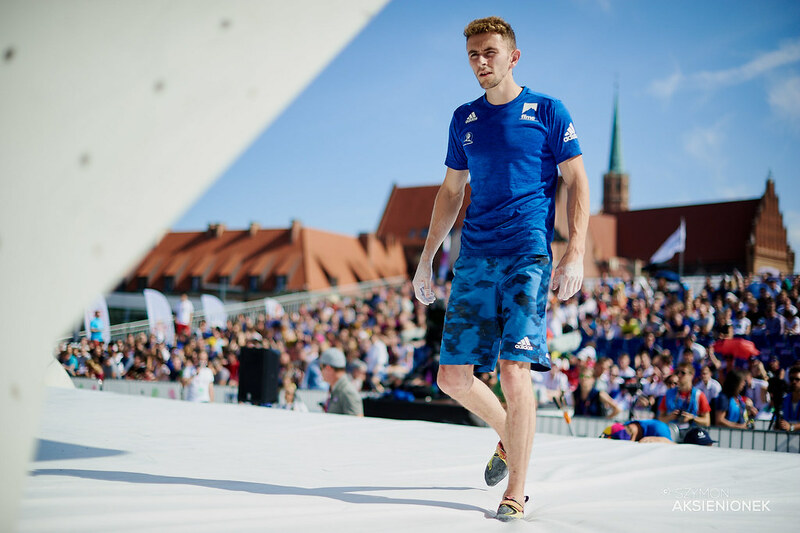 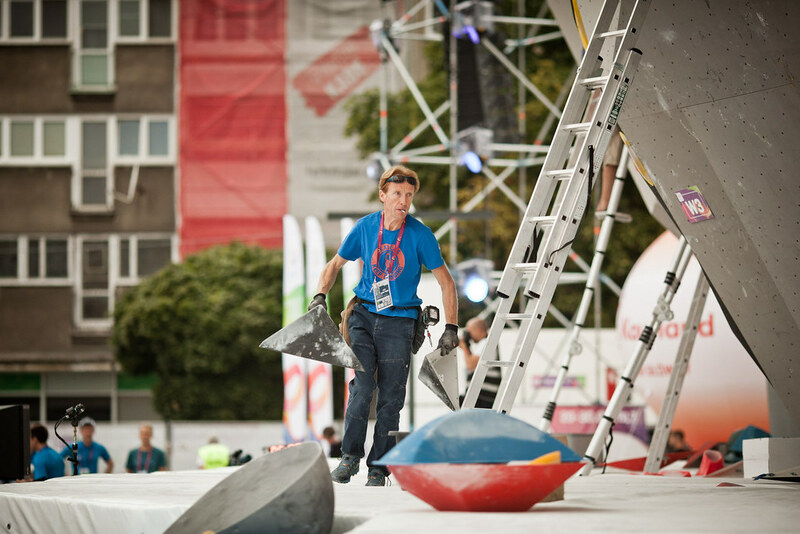 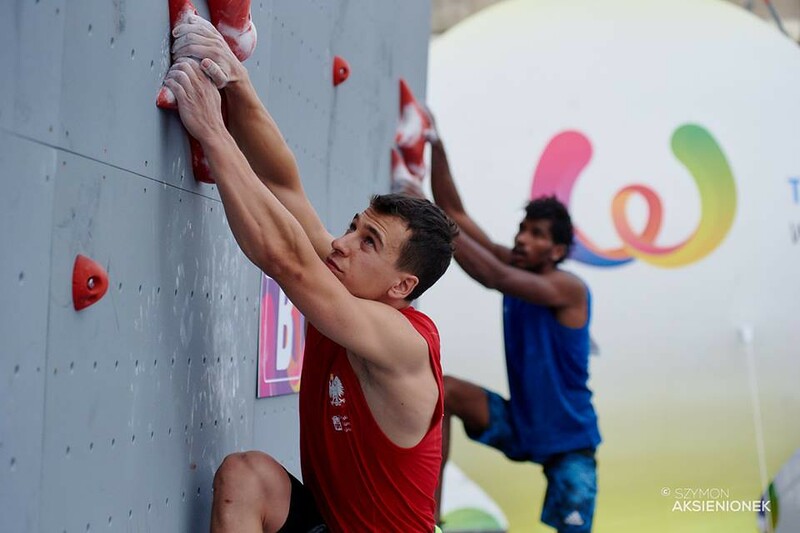 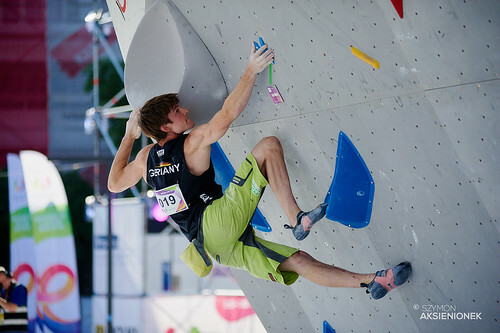 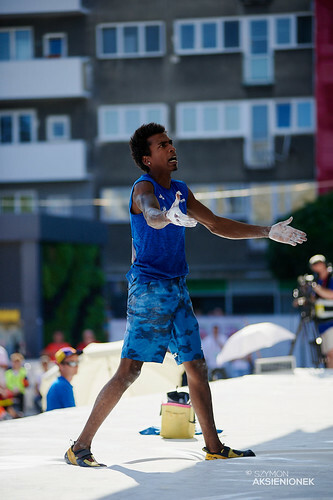 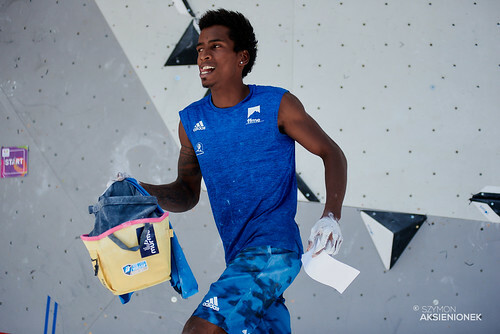 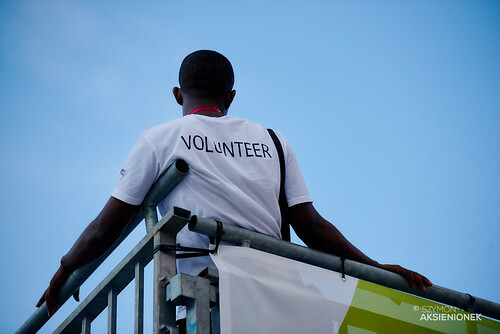 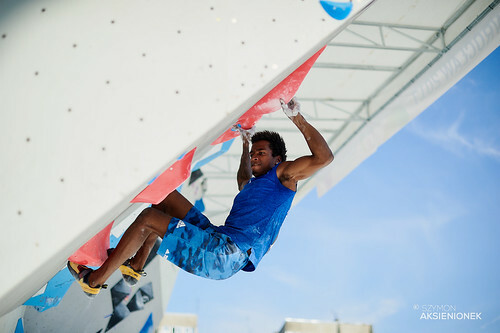 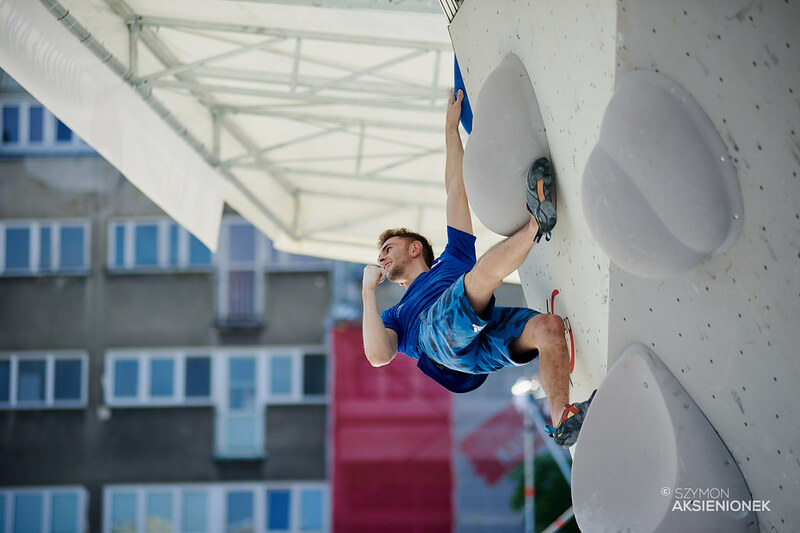 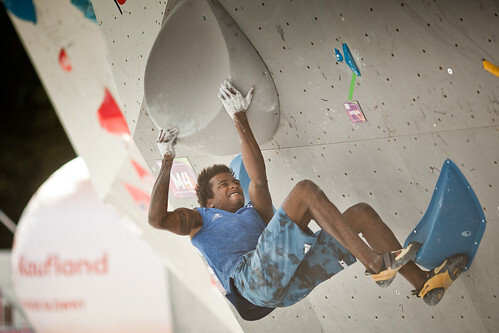 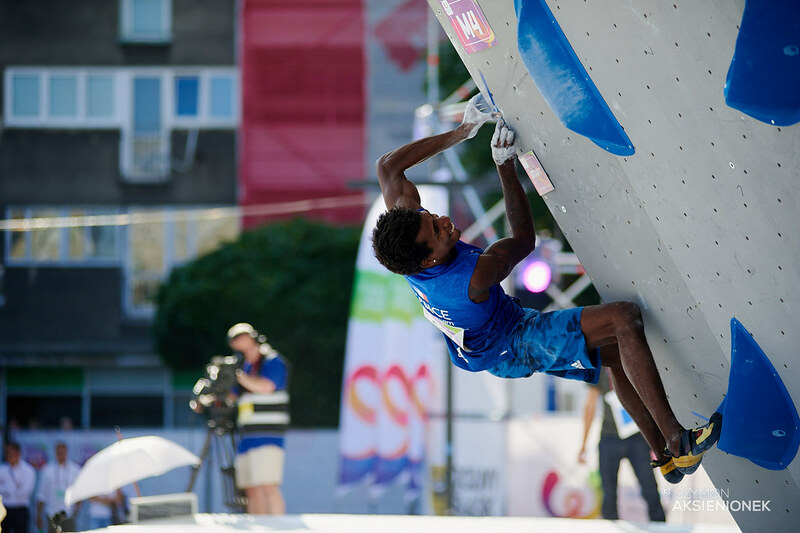 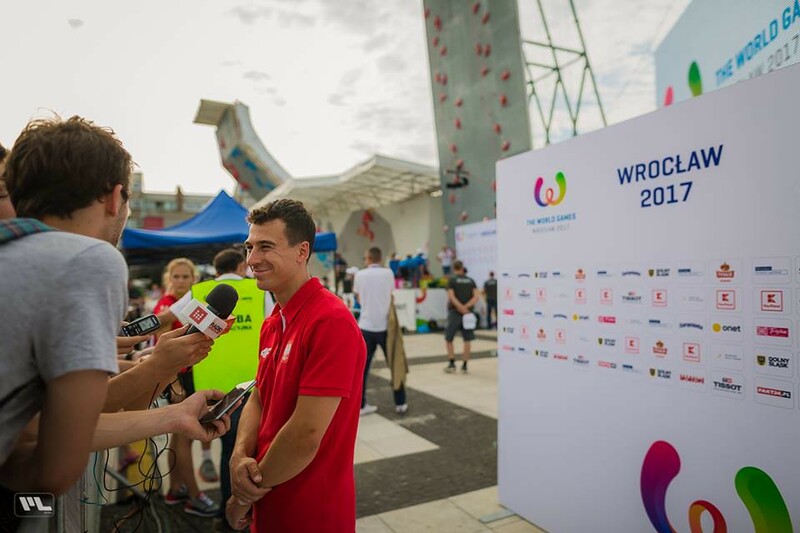 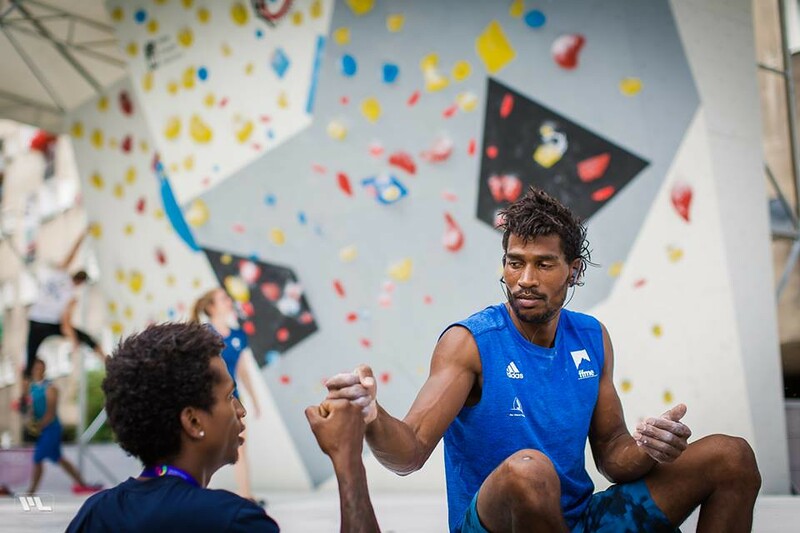 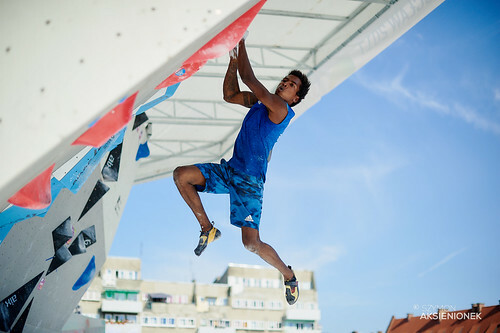 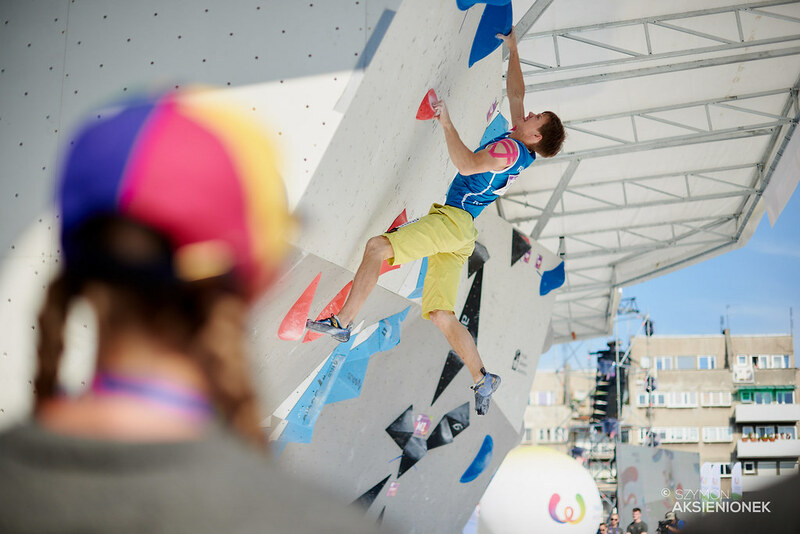 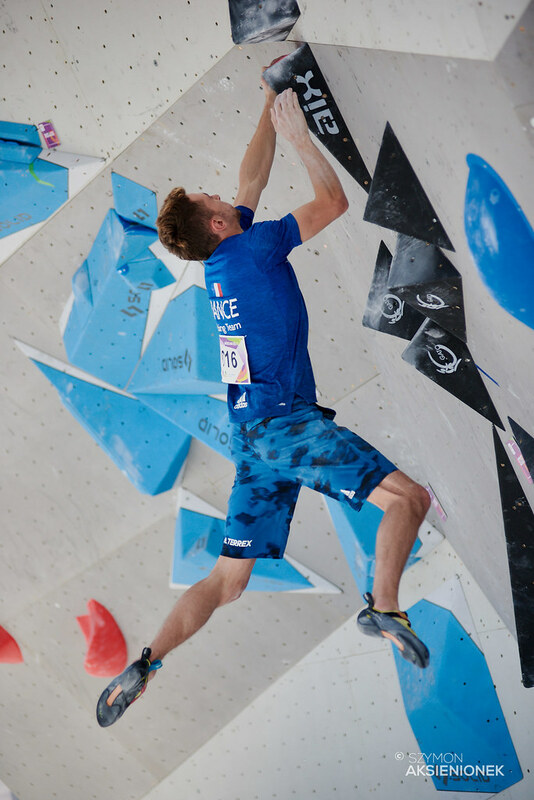 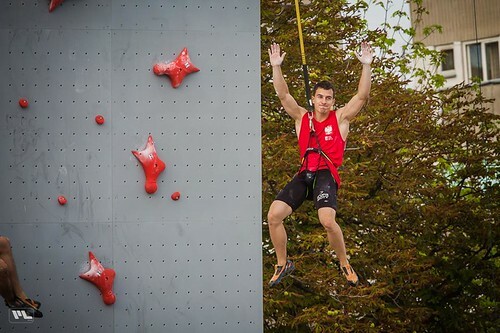 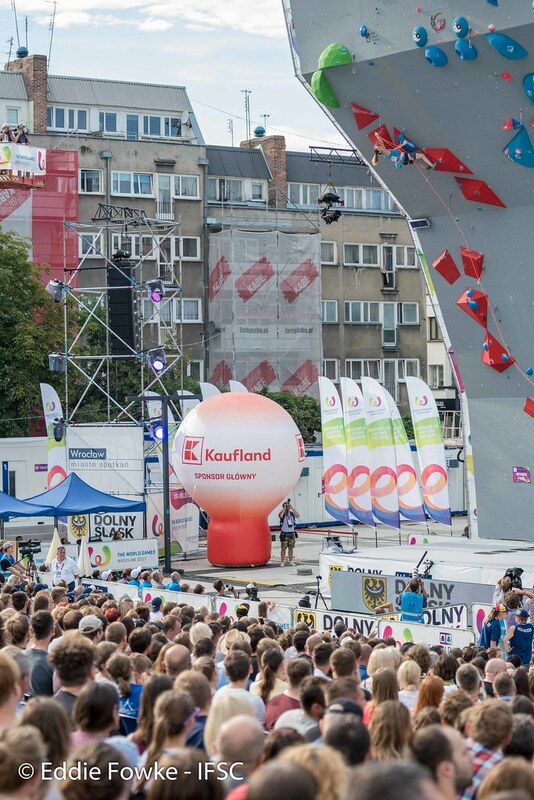 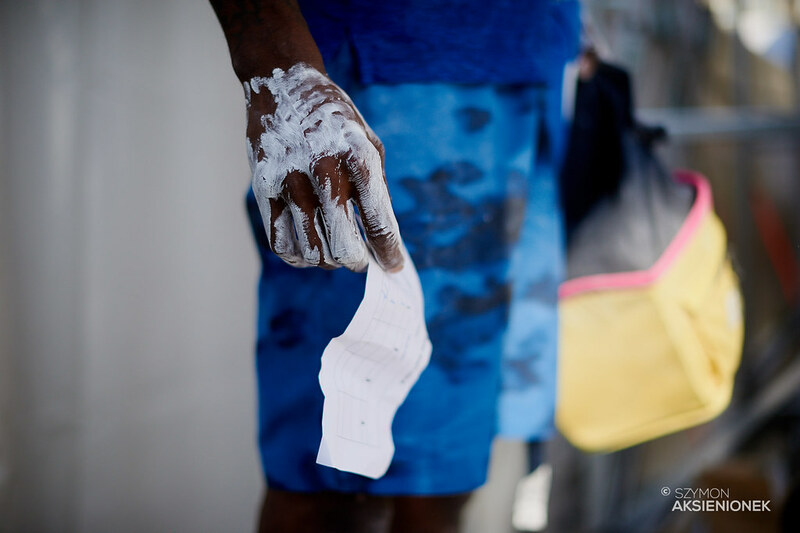 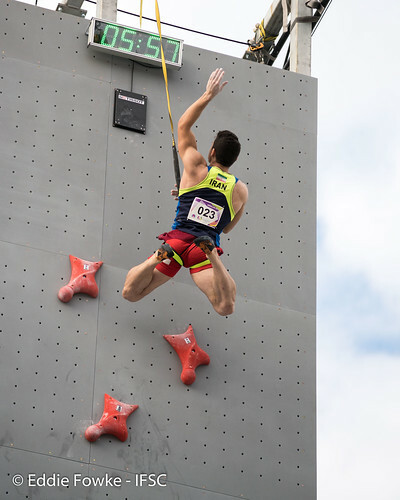 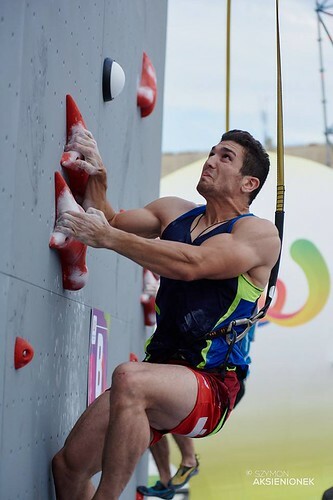 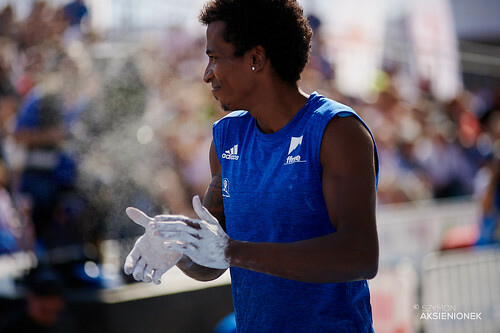 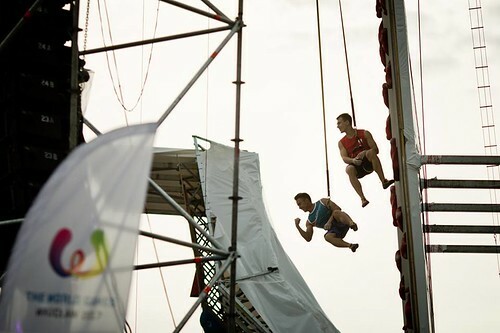 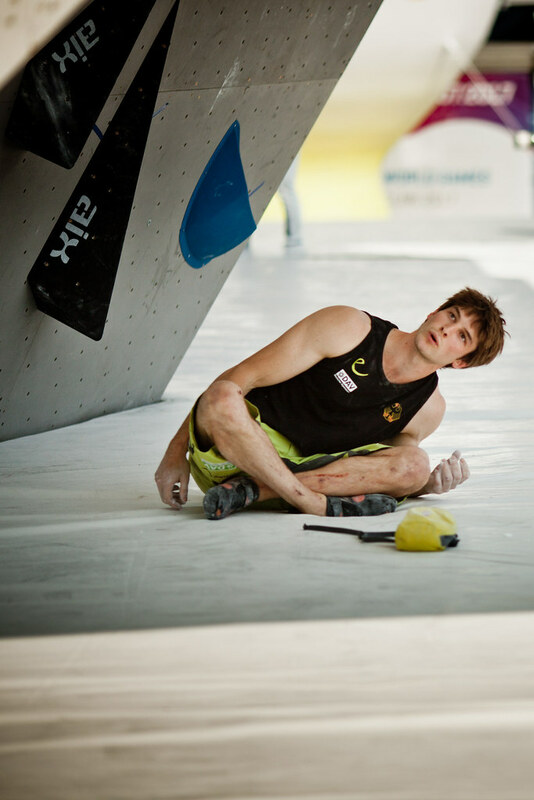 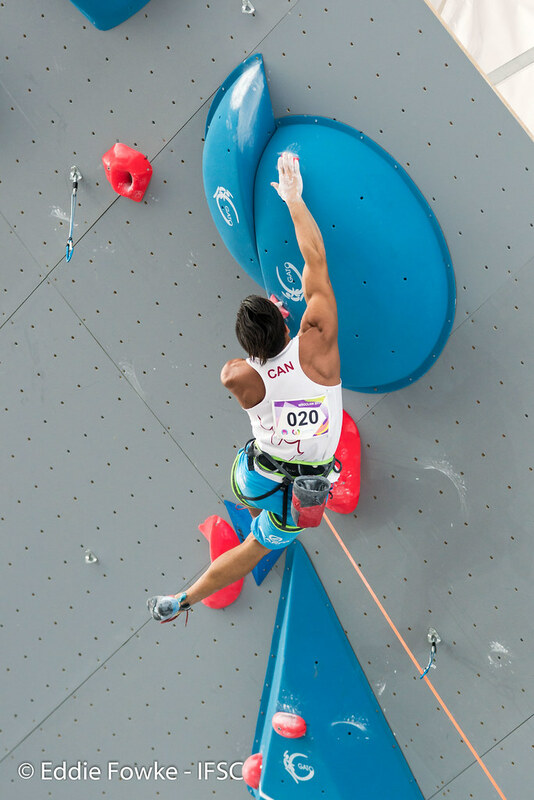 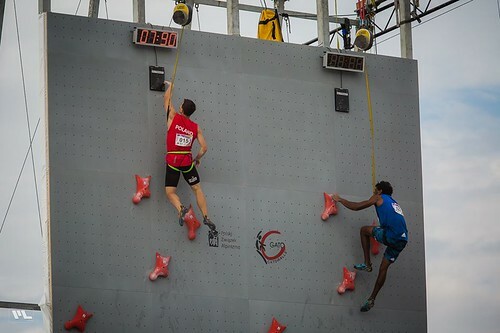 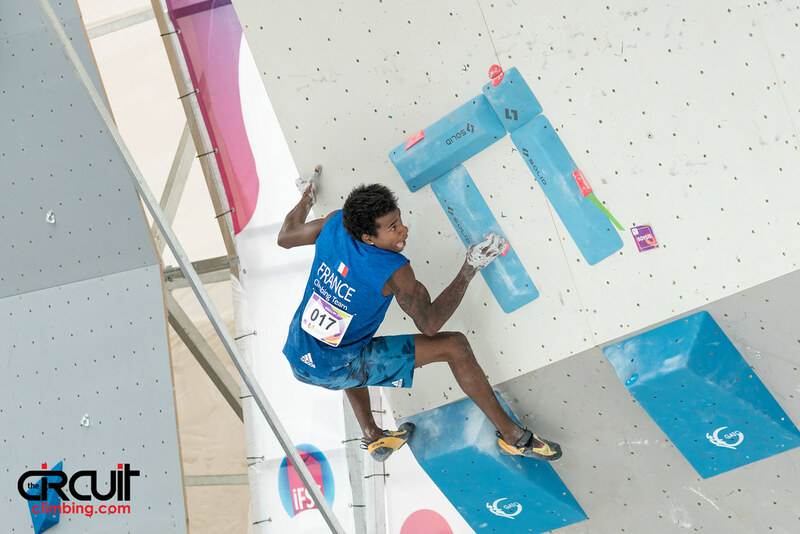 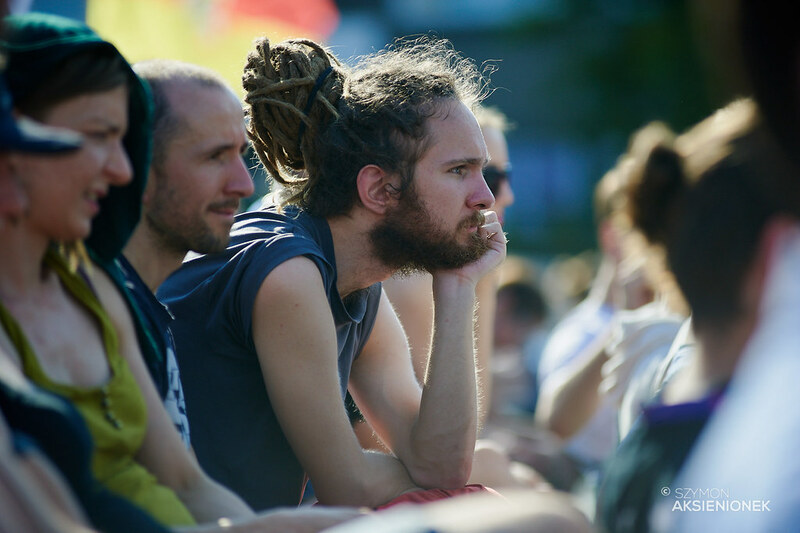 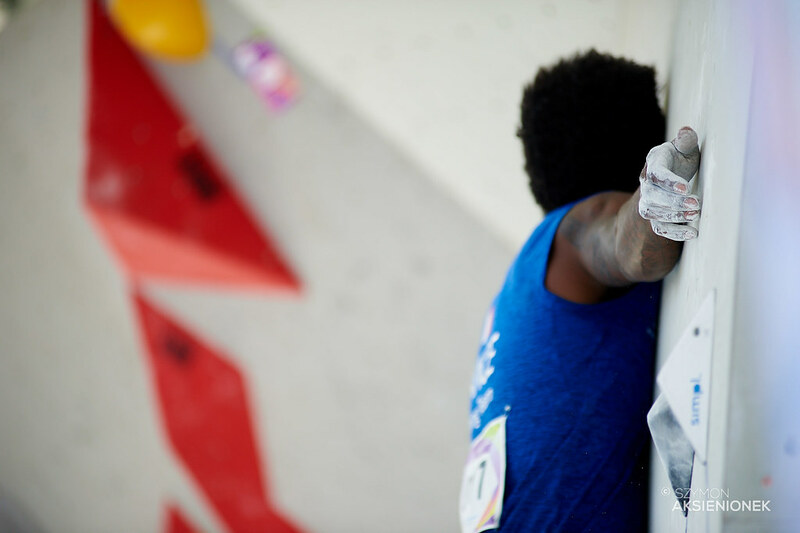 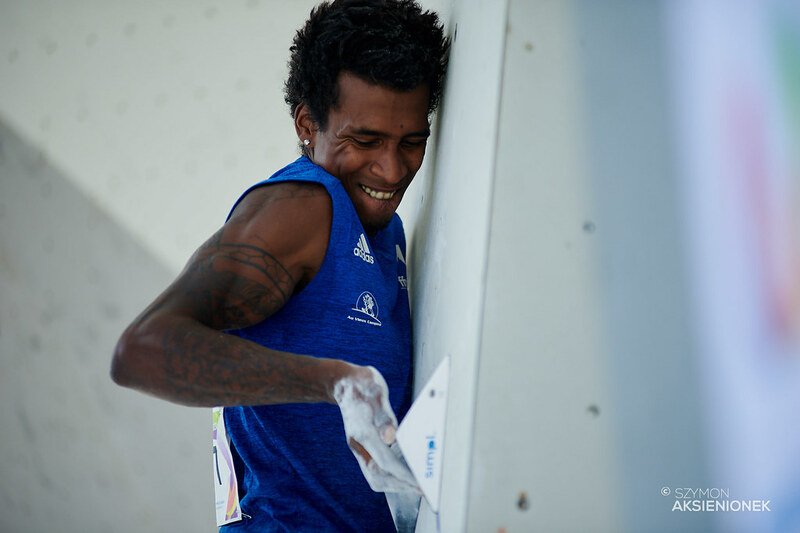 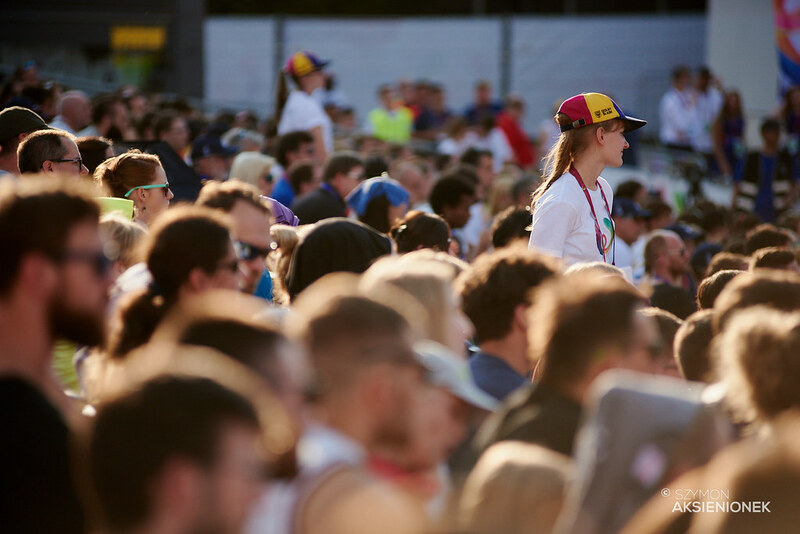 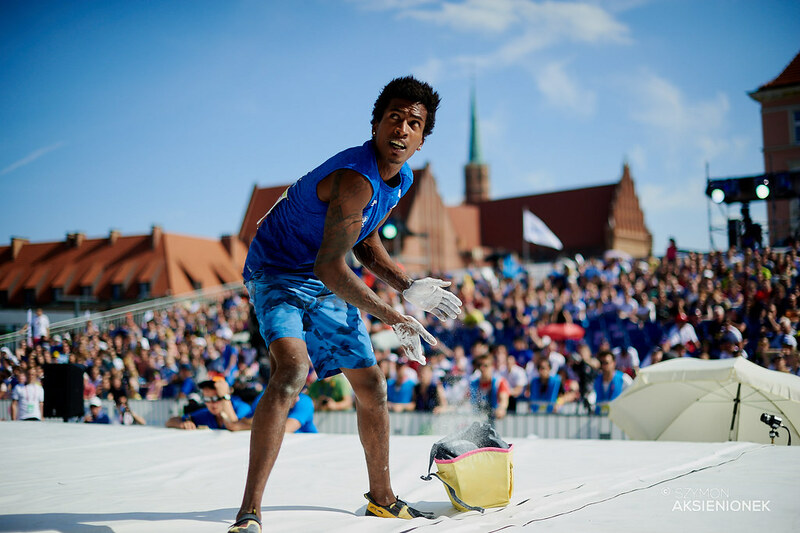 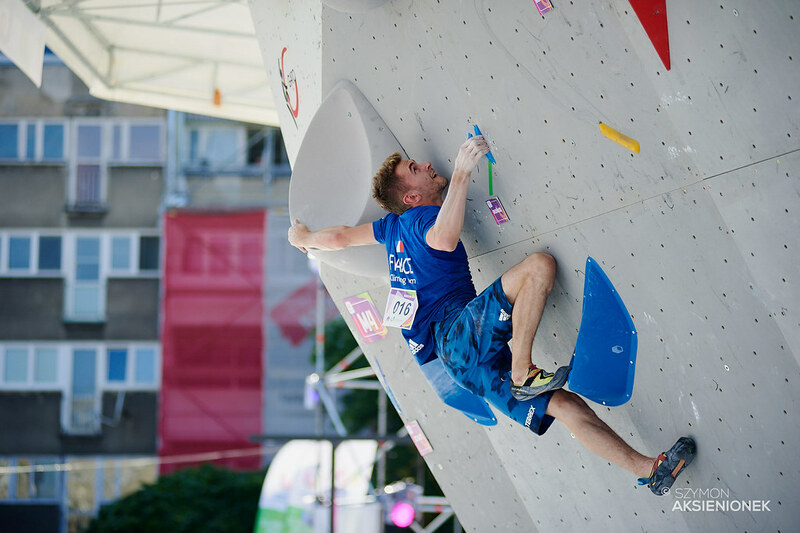 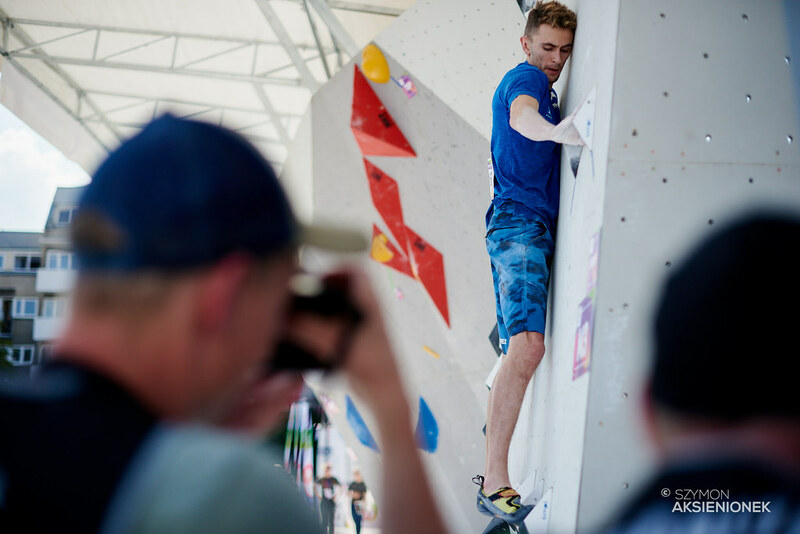 The 21-yearold is currently ranked fourth in the IFSC World Cup rankings for Lead and continues to solidify his presence on the world stage. Like his teammate Ogata, Korenaga qualified for The World Games 2017 as an Asian Continental champion. 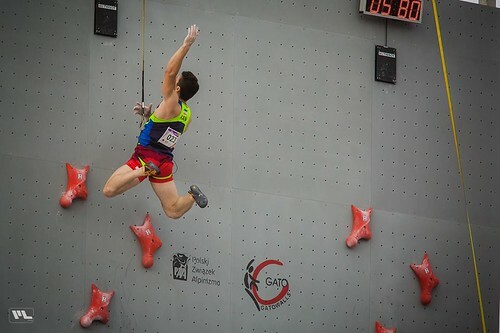 PanAmerican Continental champion Sean McColl of Canada also performed well, surpassing the early crux and falling just a few moves shy of the high point for Bronze. 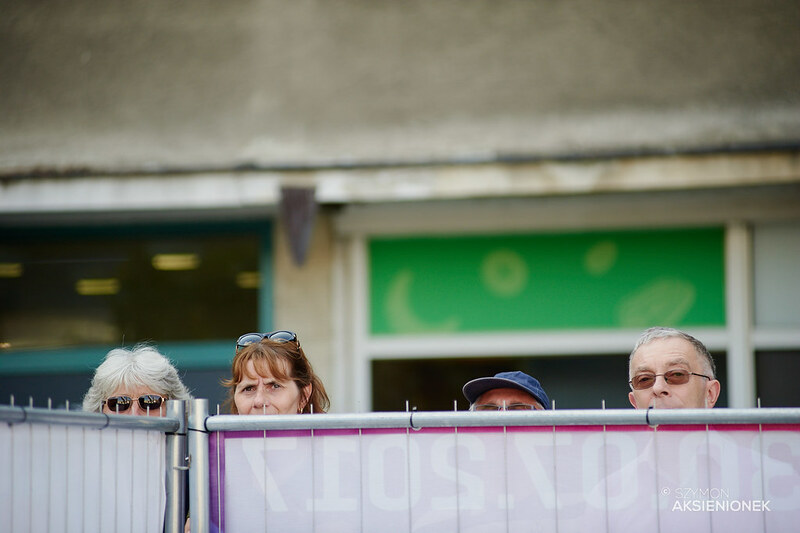 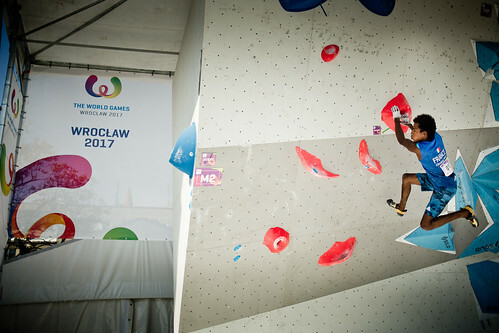 There were many strong performances in the women’s Lead final, with six athletes falling around move 39. 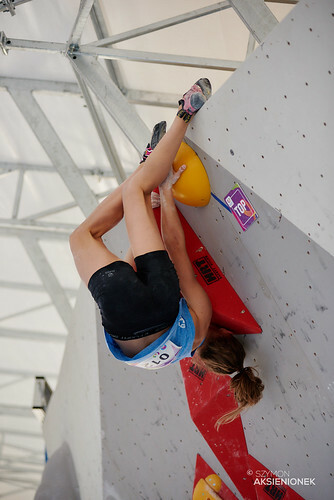 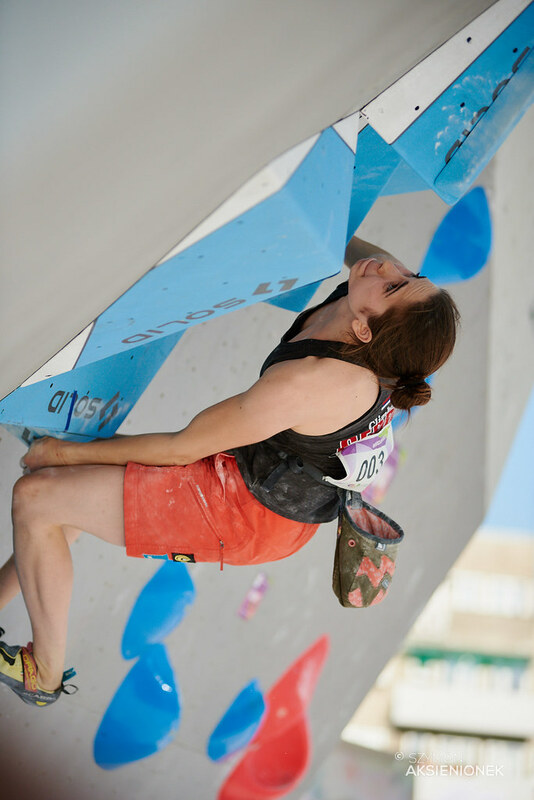 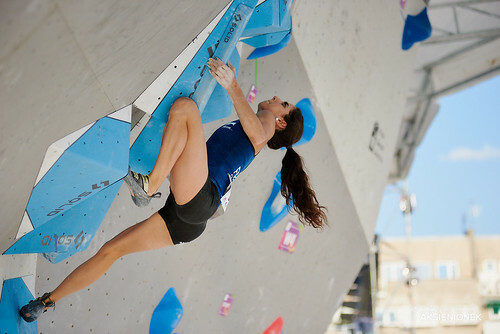 Julia Chanourdie of France was third to climb and set the high point at 39+, but many finalists were to follow. 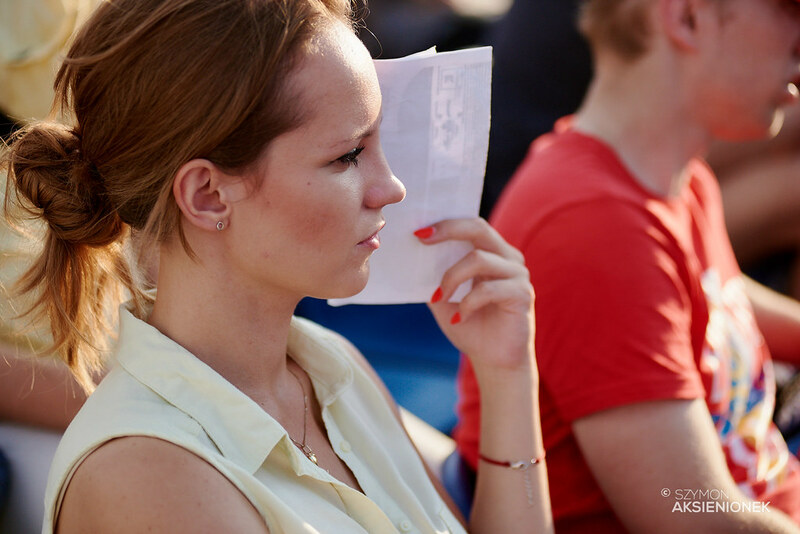 Slovenian Janja Garnbret fell at the same spot, as well as Anak Verhoeven of Belgium. 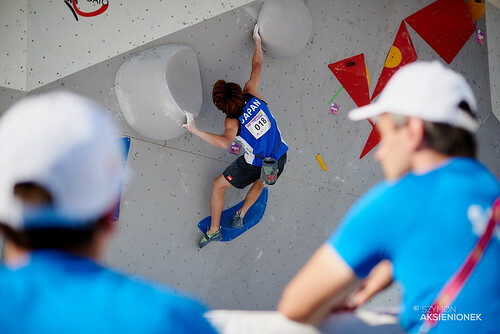 Korean Jain Kim climbed last and completed the same number of moves, but she failed to initiate positive movement to the next hold like the others. The tie-breaker again went to qualifications, where Verhoeven climbed five moves higher than Garnbret and six moves more than Chanourdie. 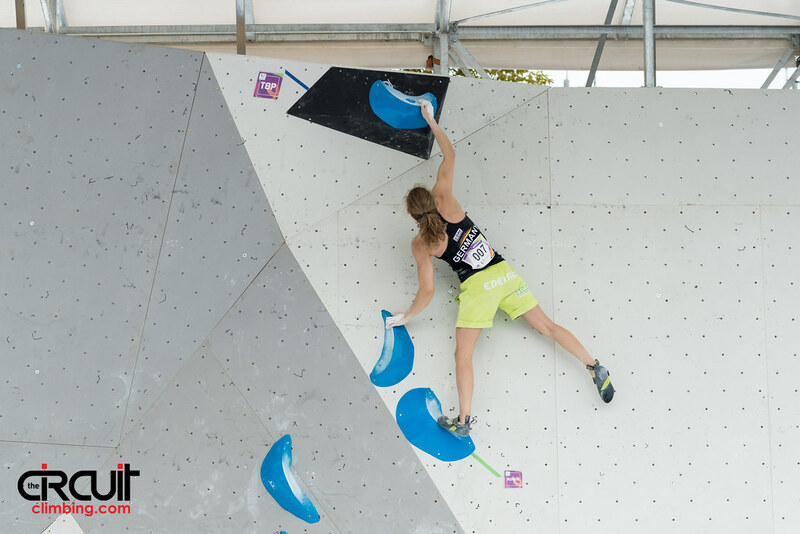 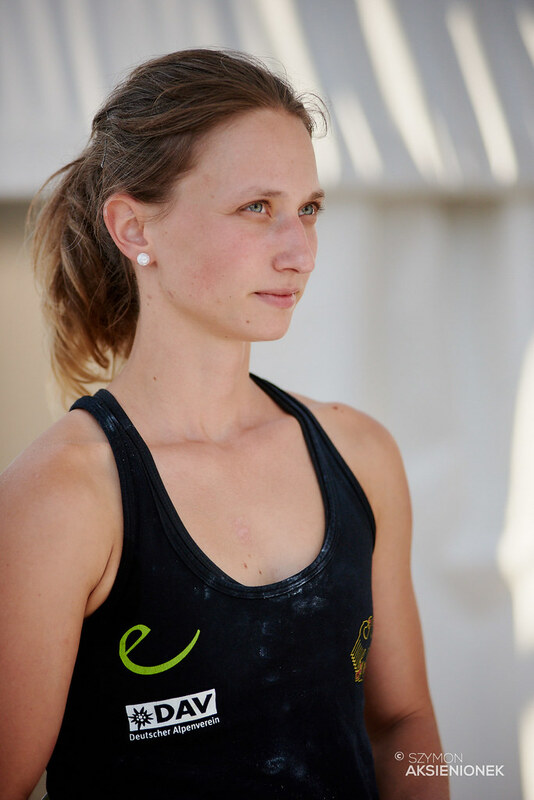 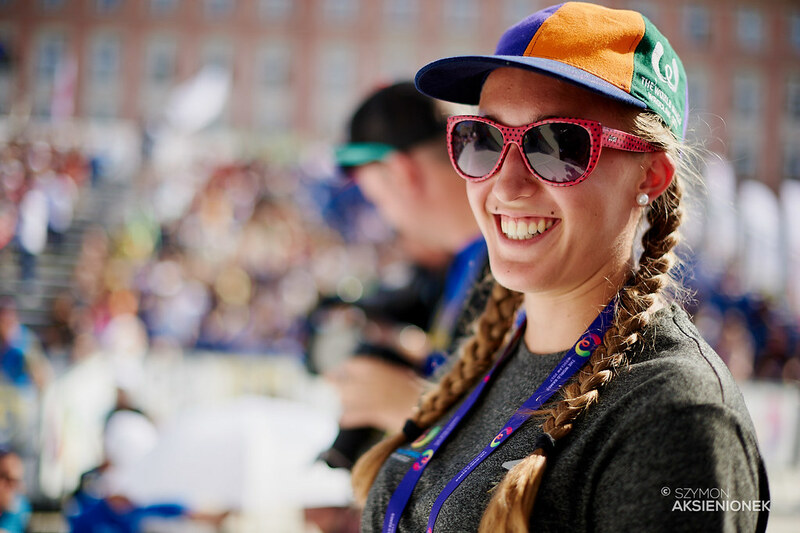 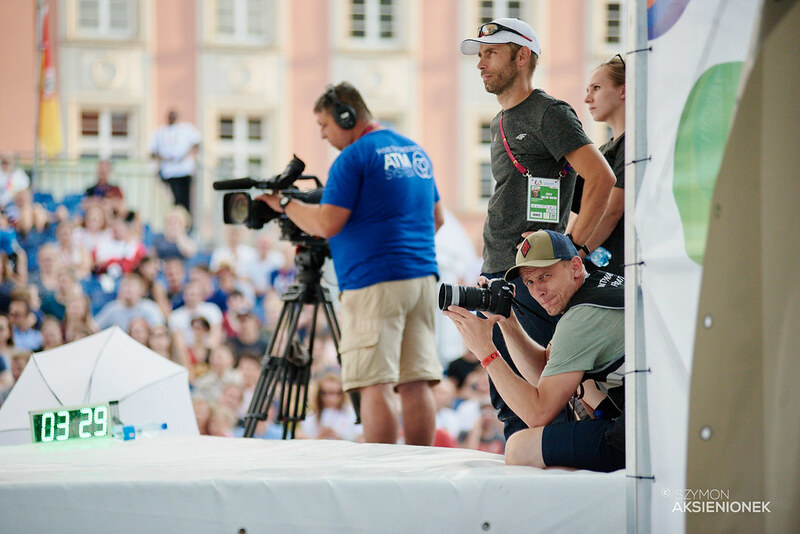 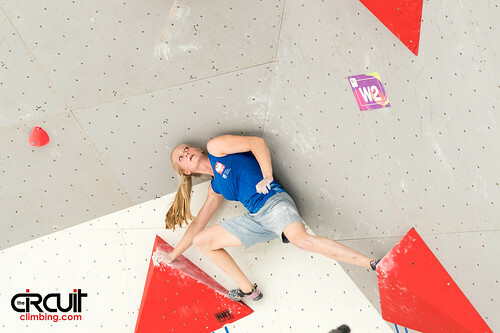 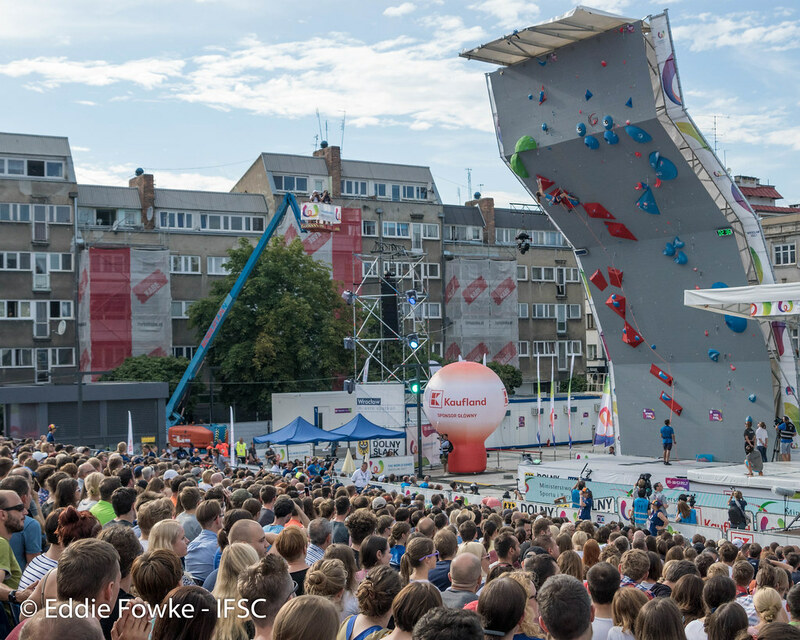 Verhoeven began her 2017 season with a victory at the European Championships, and she has yet to miss a podium this IFSC World Cup season. 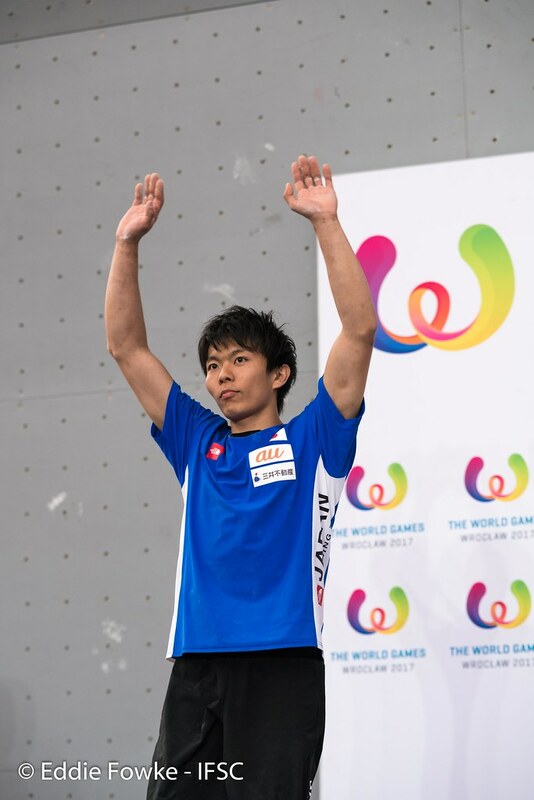 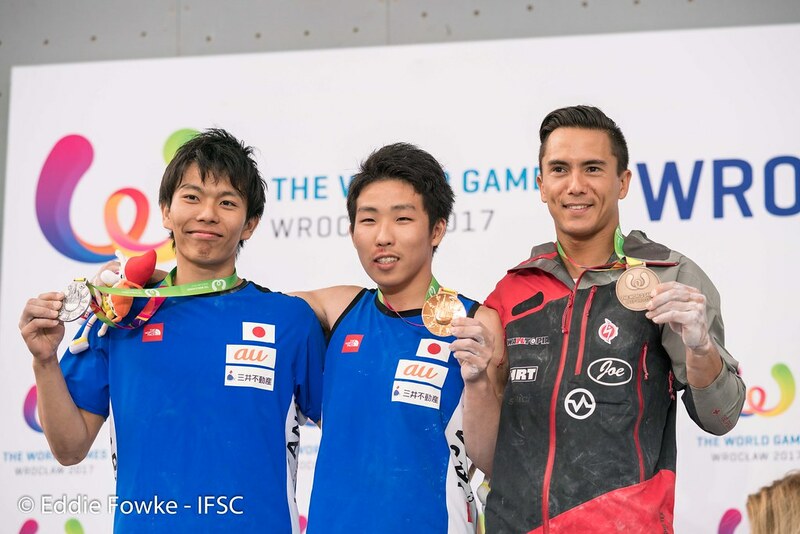 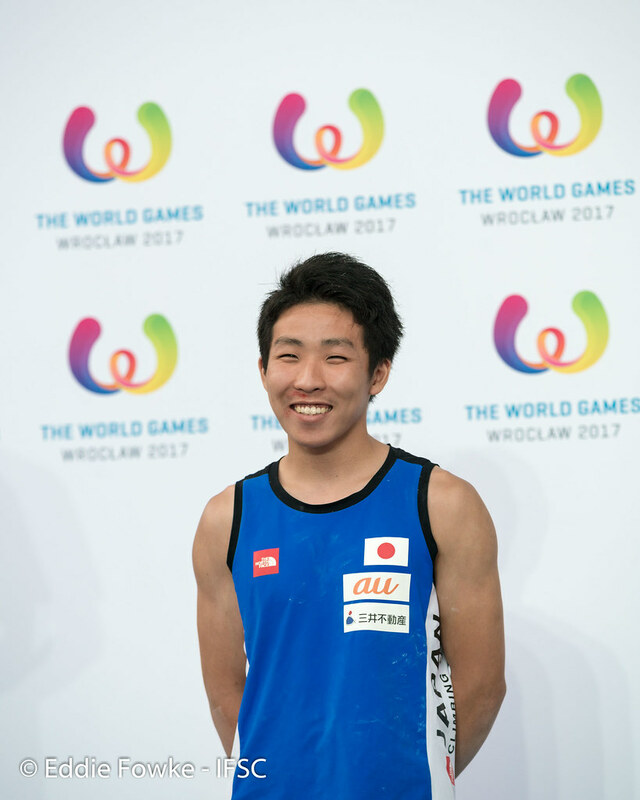 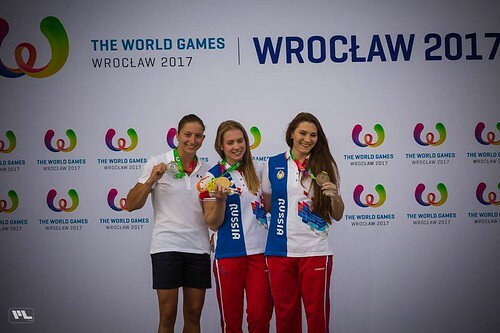 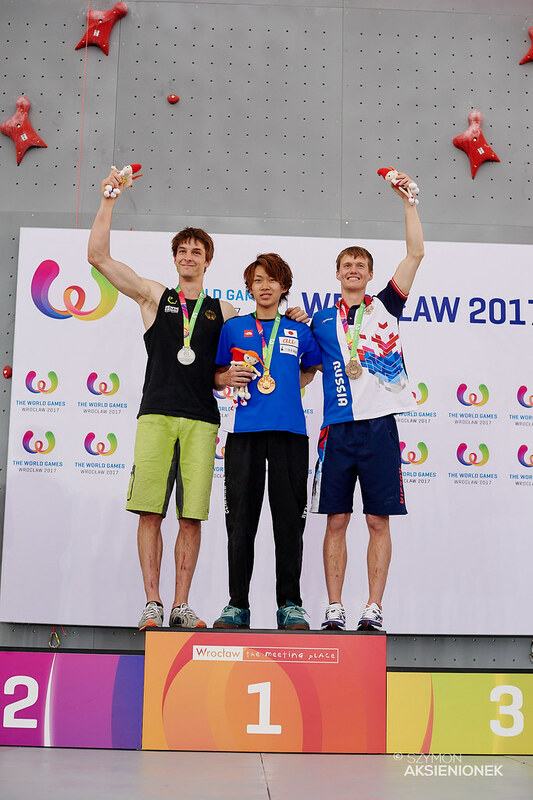 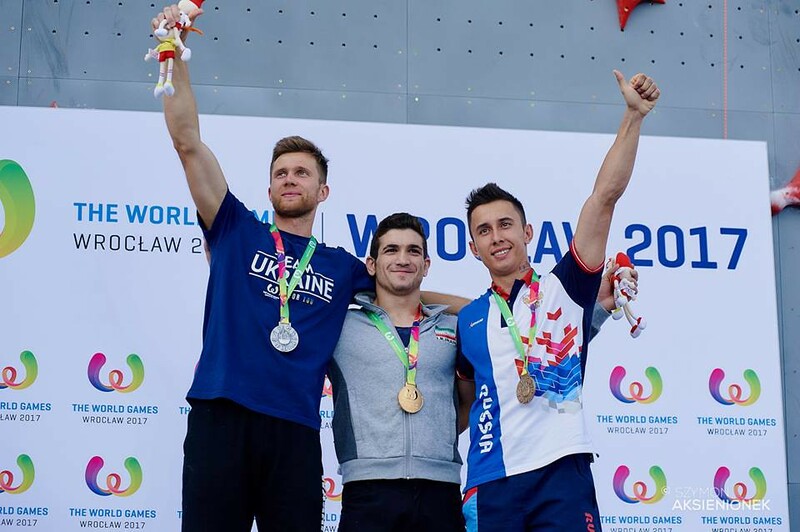 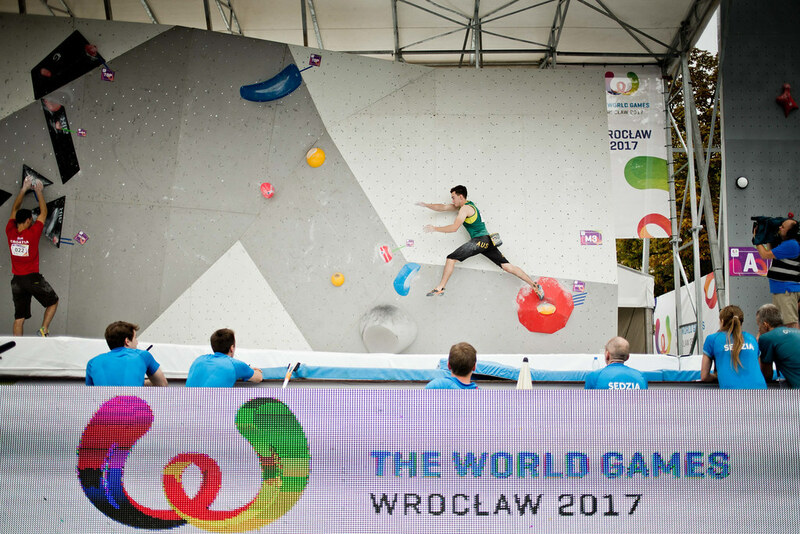 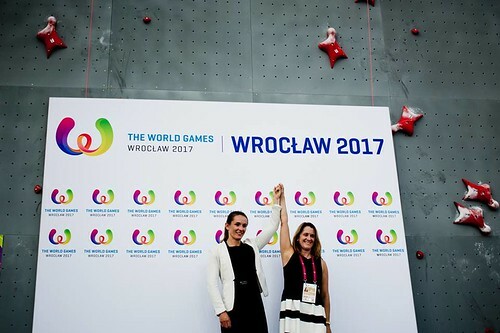 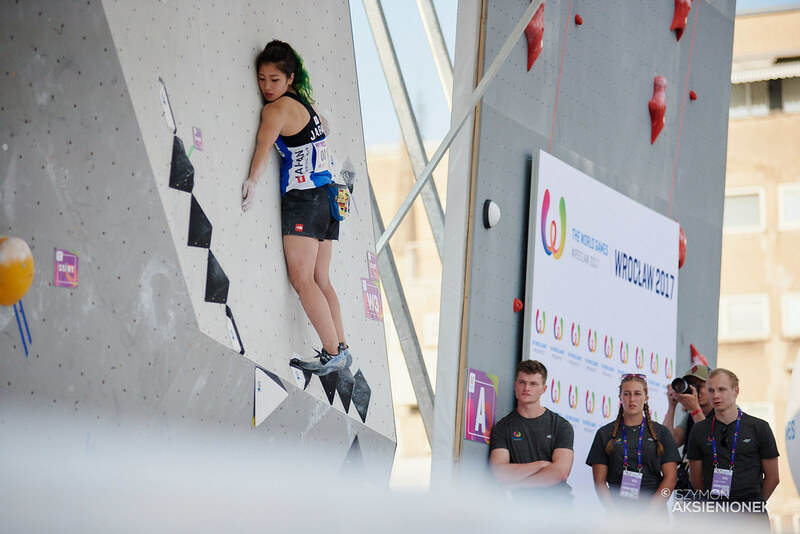 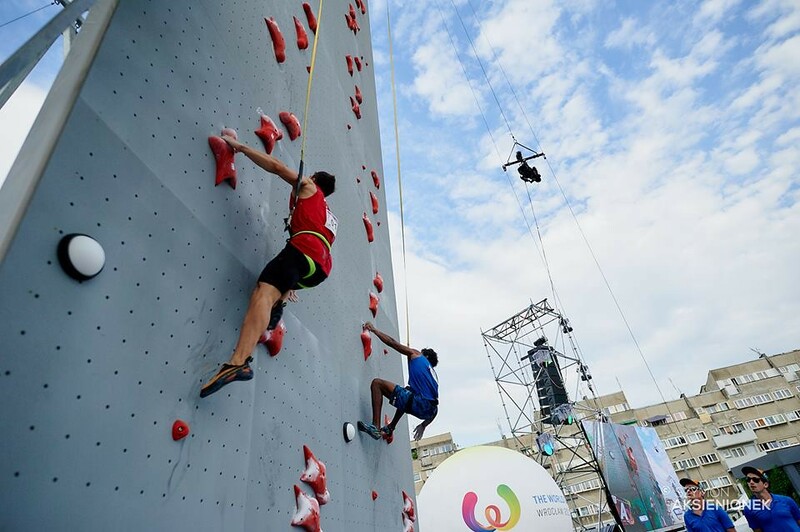 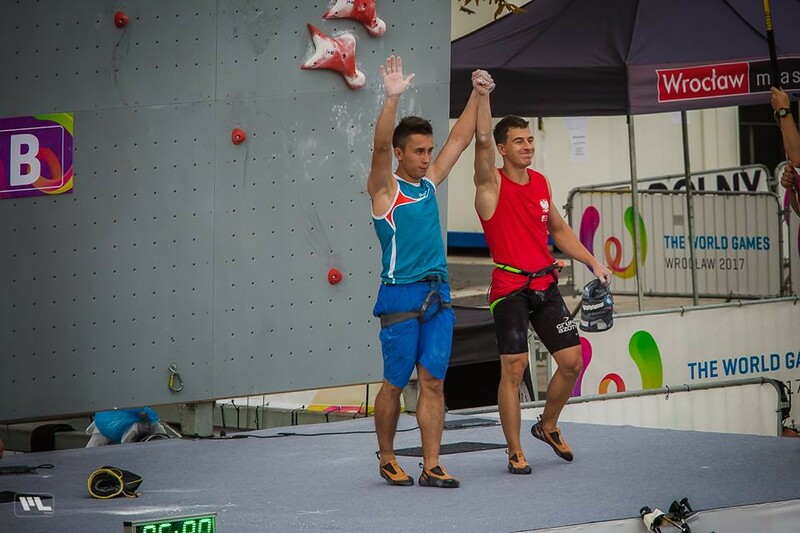 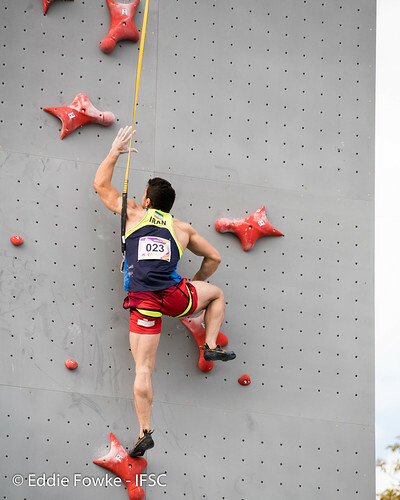 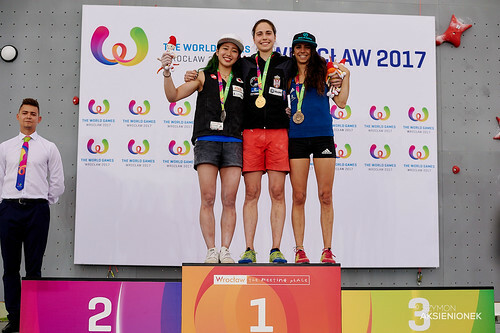 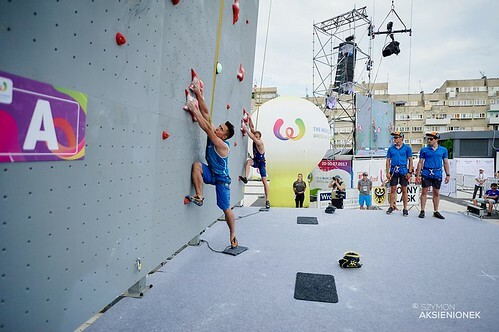 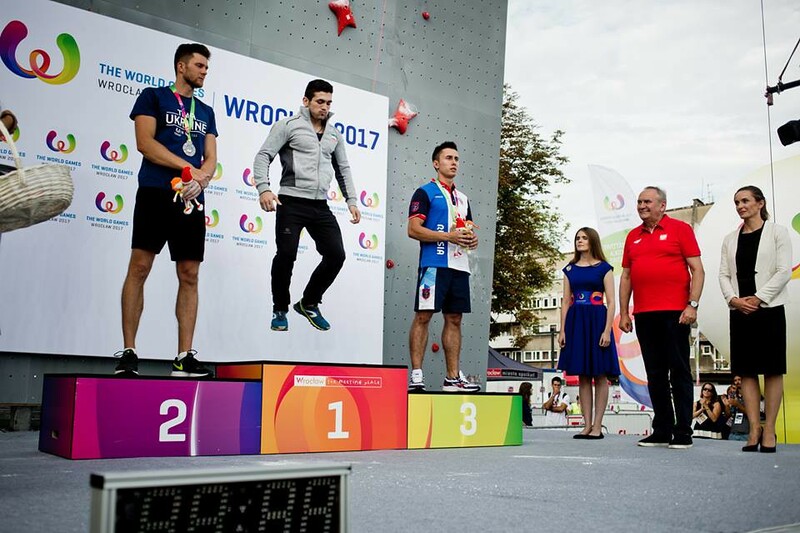 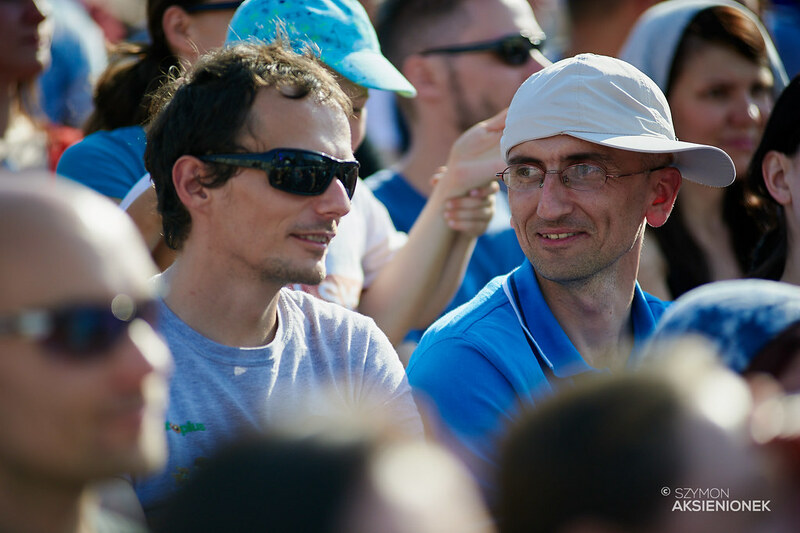 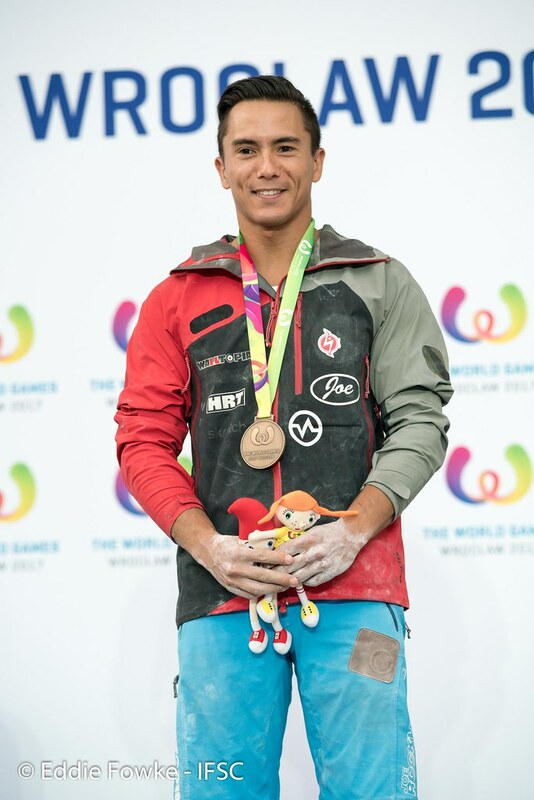 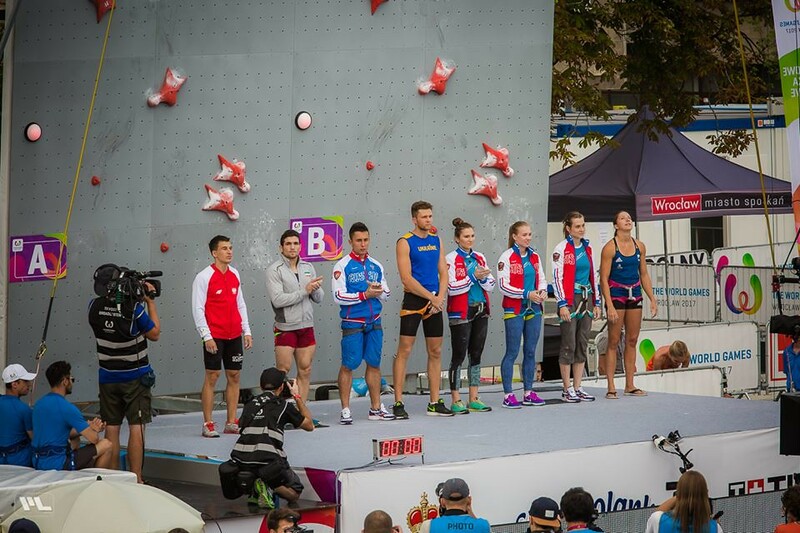 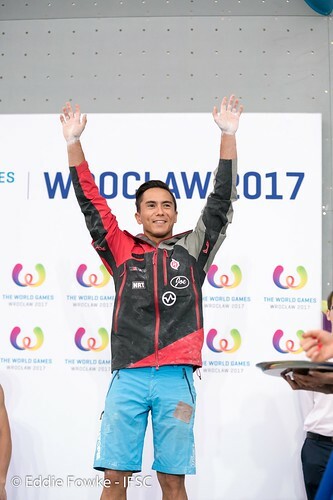 Japan tied Russia for most medals in Sport Climbing at The World Games 2017 when Korenaga and Hada stood on the men’s Lead podium, bringing the total to four. 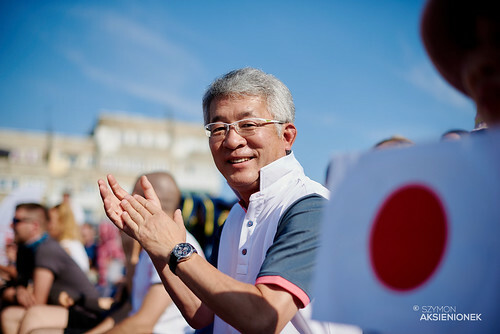 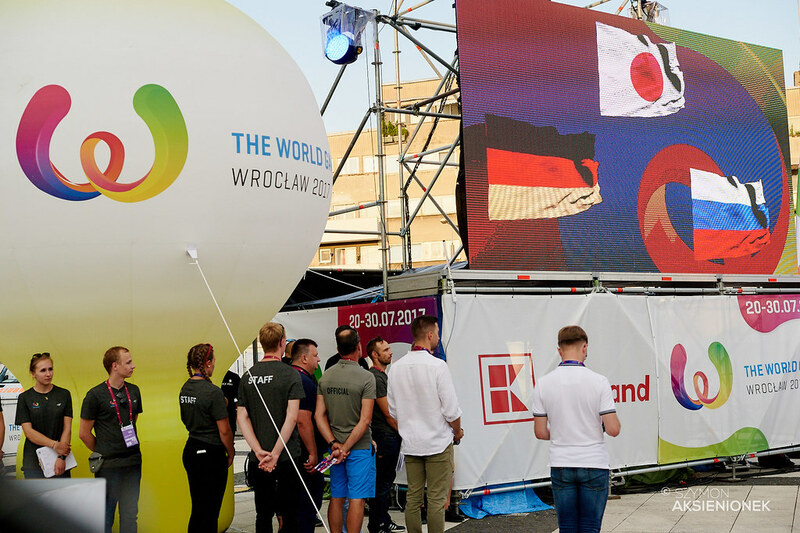 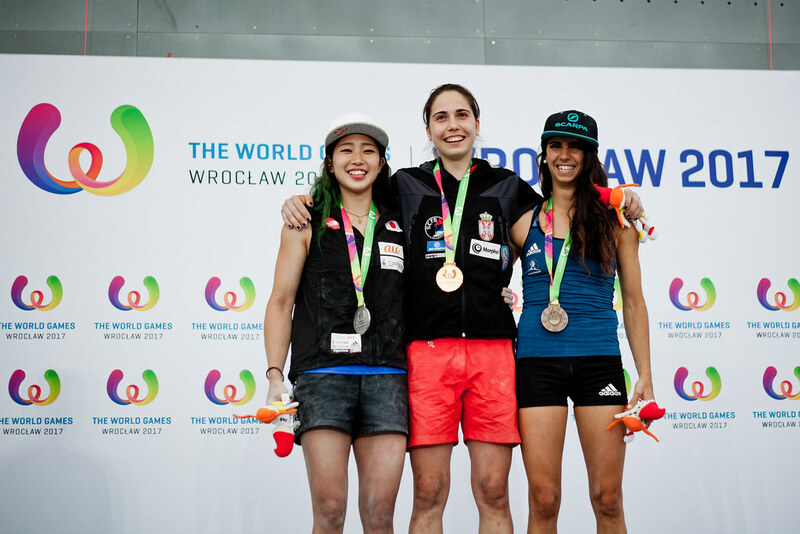 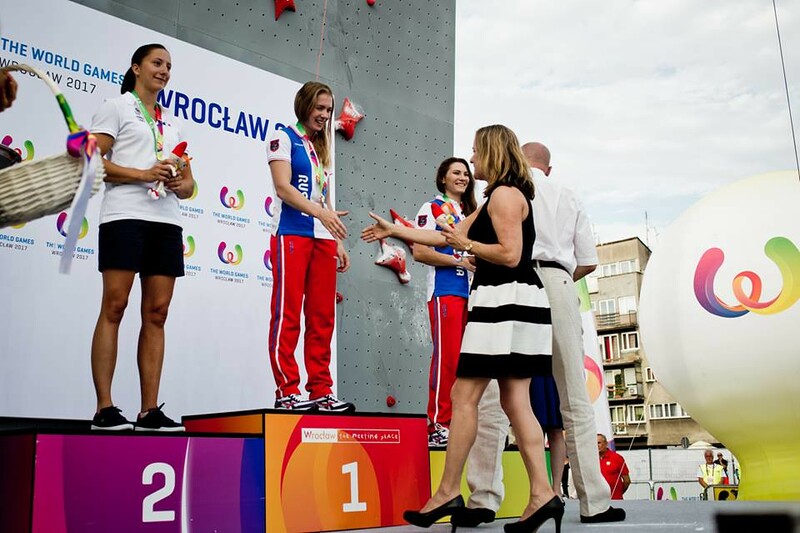 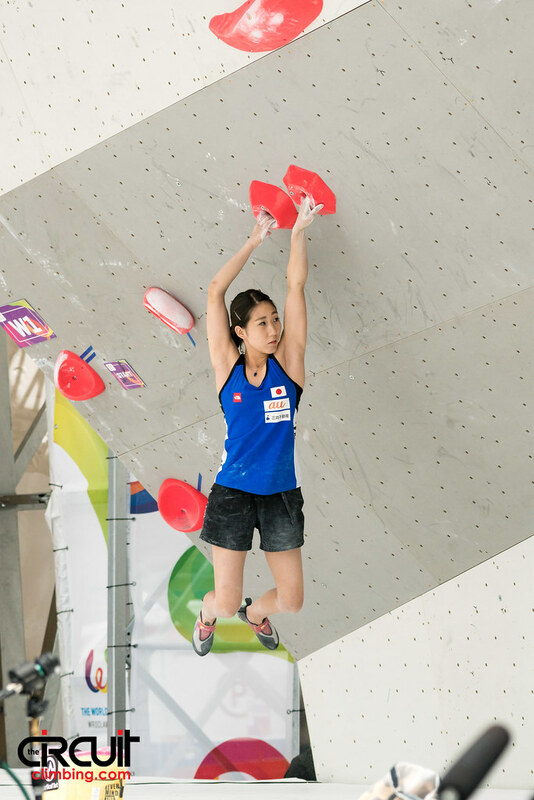 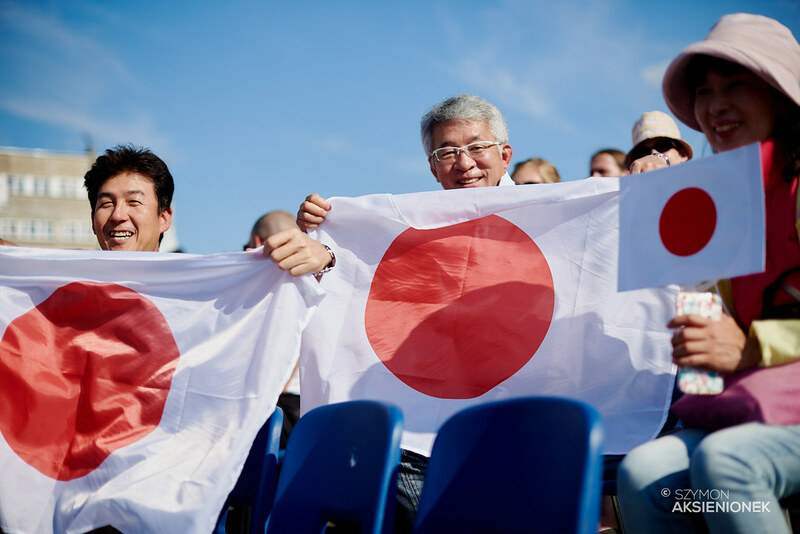 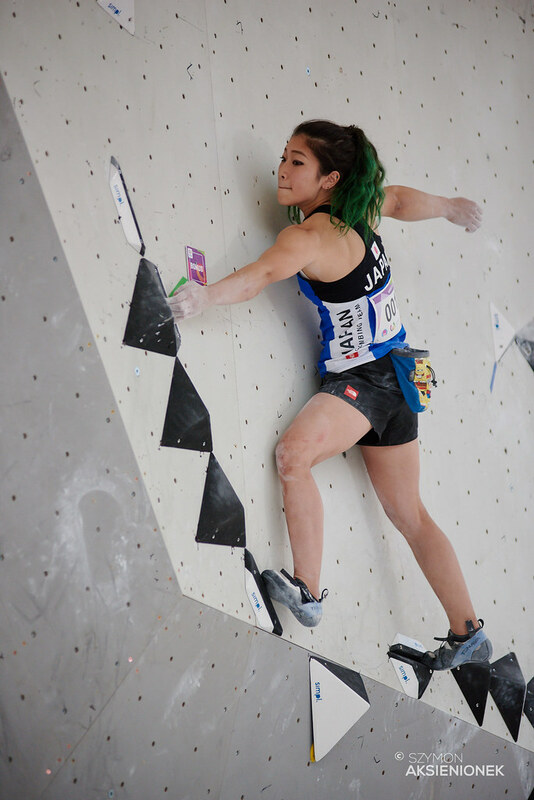 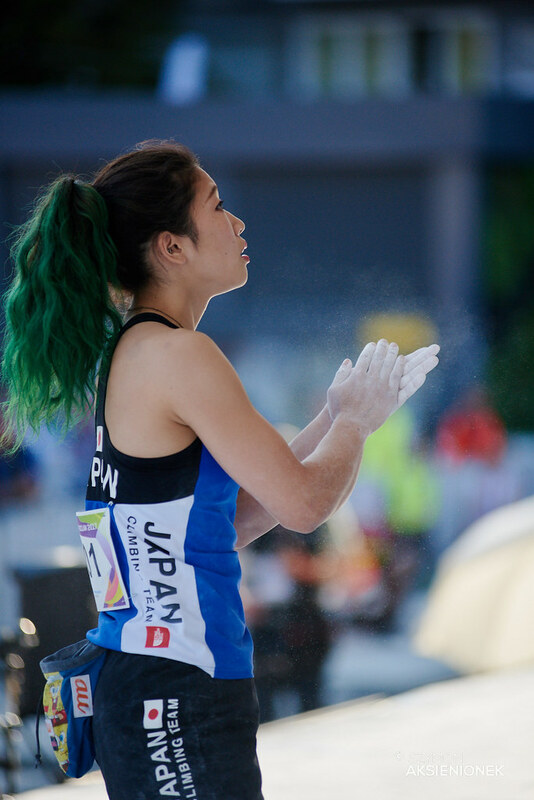 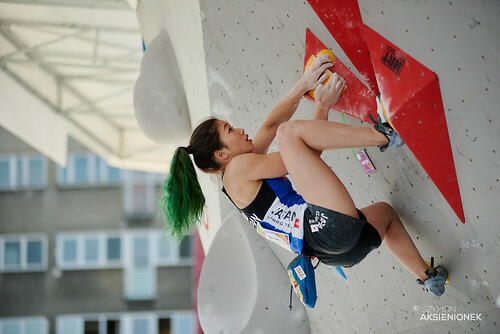 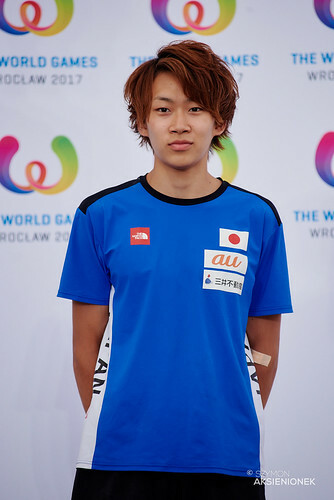 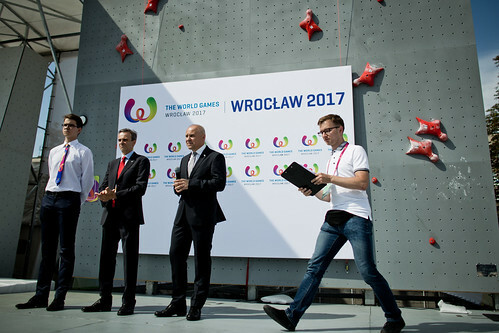 Korenaga’s victory also gave Japan their second Gold medal in Wroclaw, making Japan the only team to win two Sport Climbing events. 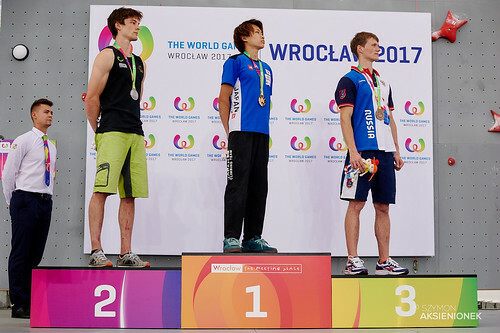 France finished with three medals.